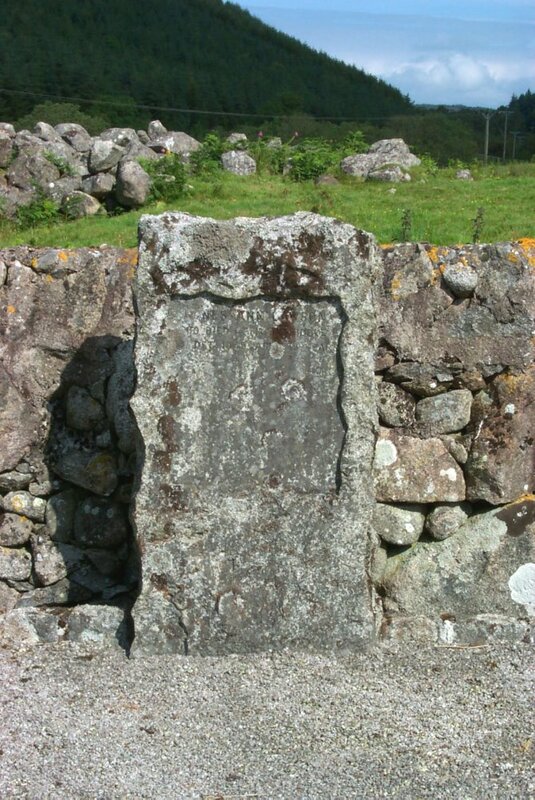 001 Sacred to the memory of James Smith, who died at Jock Lig, June 21st 1824, aged 57 years. Also Isabella Halliday, his wife, who died at Brough, 22d Nov’r. 1841 aged 69 years. And James Smith their son, who died 18th Dec’r. 1815, aged 17 years. Also Janet Smith their daughter, who died 28th March 1819, aged 19 years, and Margaret Smith their daughter, who died 12th Aug’t. 1839, aged 31 years. Also David Smith, who died at Mainsriddle, 10th June 1868 aged 71 years. 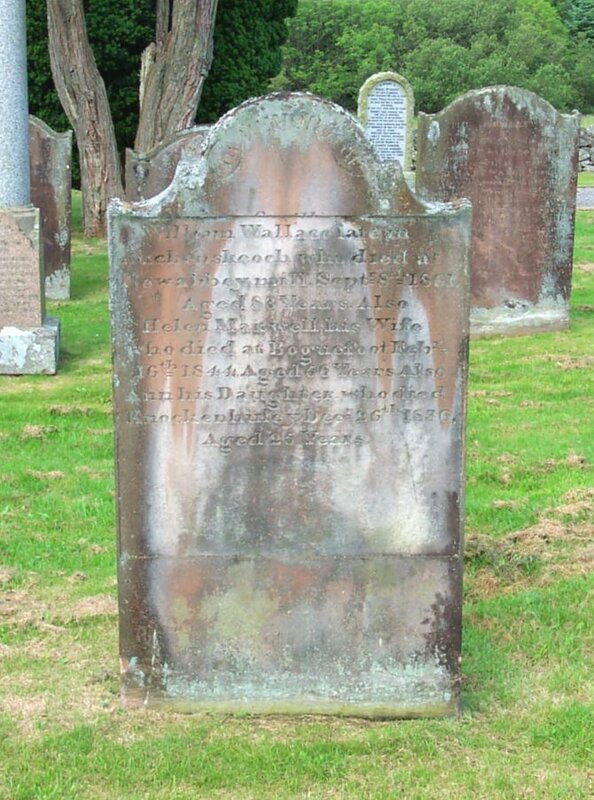 And Isabella Wallace his wife, who died at Mainsriddle, 14th April 1849, aged 52 years. Also Mary Smith, who died 8th Feb’y. 1883, aged 87 years. And Elizabeth, who died 13th Aug’t. 1884, aged 75 years. Also Lilias who died 4th Feb’y. 1885, aged 74 years. 002 In memory of William Wilson, who died at Govan, Glasgow, 25th January 1887, aged 84 years. Also Mary Tait, his wife, who died at Bocknowe, 2nd May 1867, aged 47 years. Also James, their son, who died 20th January 1848, aged seven weeks. Also James Wilson, engineer, son of the above William Wilson who died at sea 25th March 1896, aged 47 years. 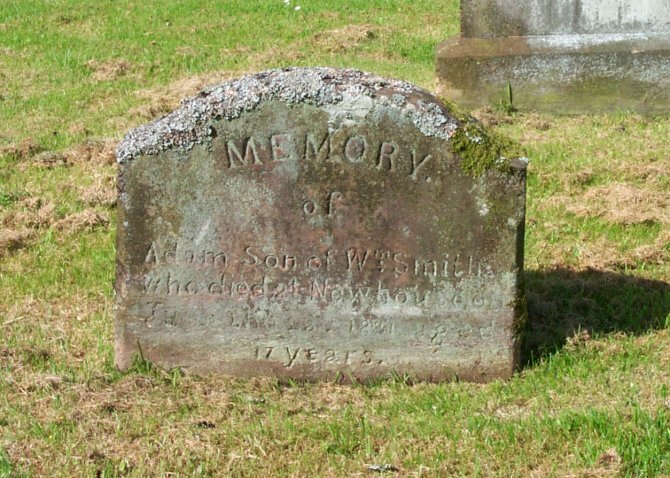 Samuel Wilson, who died at Bridge of Allan, 12th April 1905 aged 64 years. At “L. Arolle”, Mousquines, Lausanne, Switzerland. Rev. John Wilson, D.D., fell asleep 9th December 1912, in his 70th years. 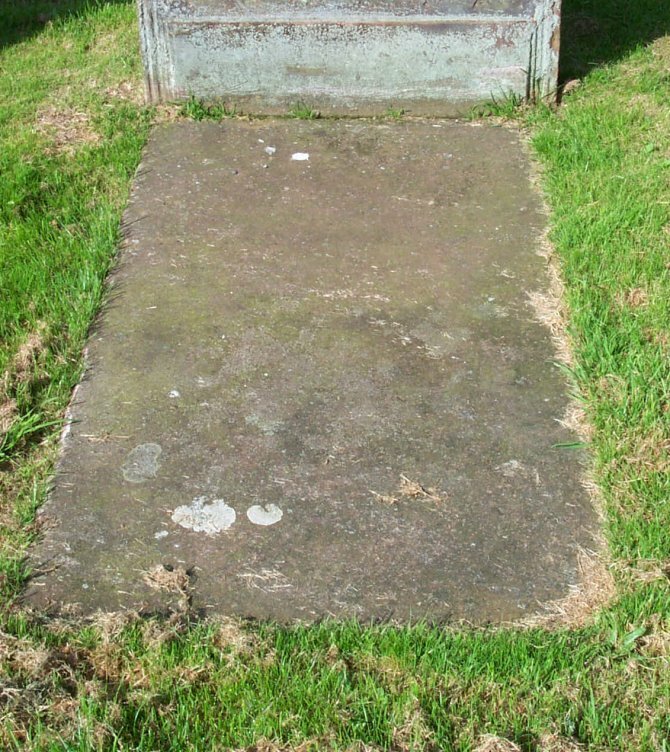 William Wilson who died at Kirkmacolm, Renfrewshire, 11th July 1927, aged 74 years. Elizabeth Carson Wilson died 5th June 1930 aged 85 years. 003 In memory of William McCraith, son to William McCraith, farmer in Clonyard, who died 8th Aug’t 1814, aged 30 years. 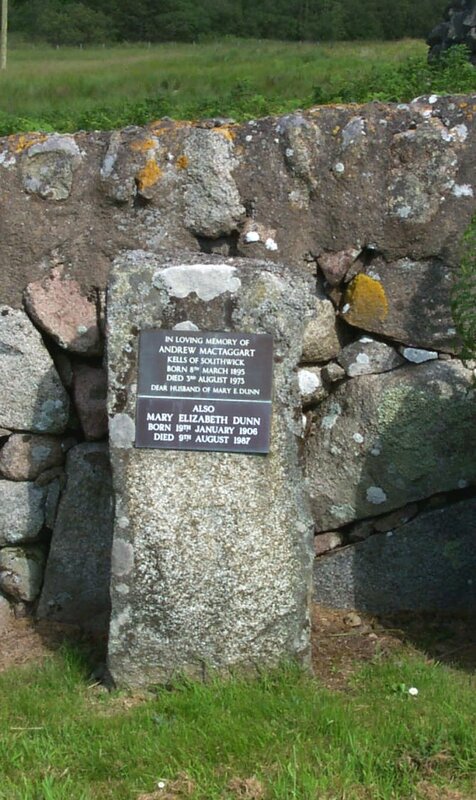 Also Margaret McCraith, who died 3rd April 1814, aged 7 years. 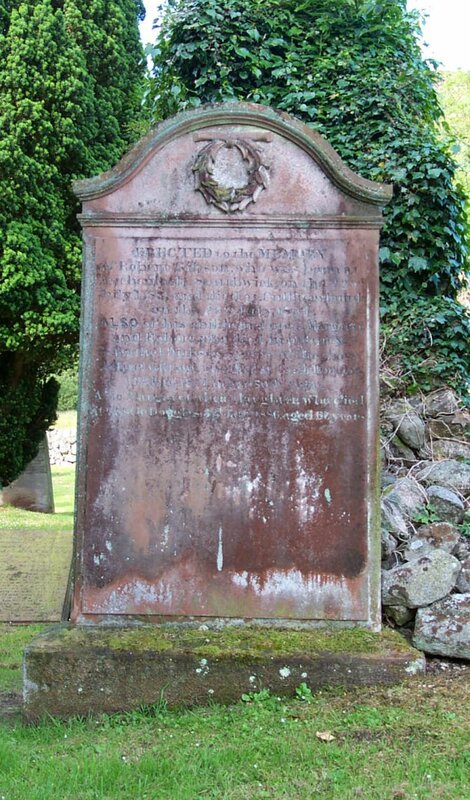 Also the above William McCraith who died 23rd Feb. 1820, aged 70 years. And of Agnes Palmer, his spouse, who died 31st March 1826, aged 72 years. 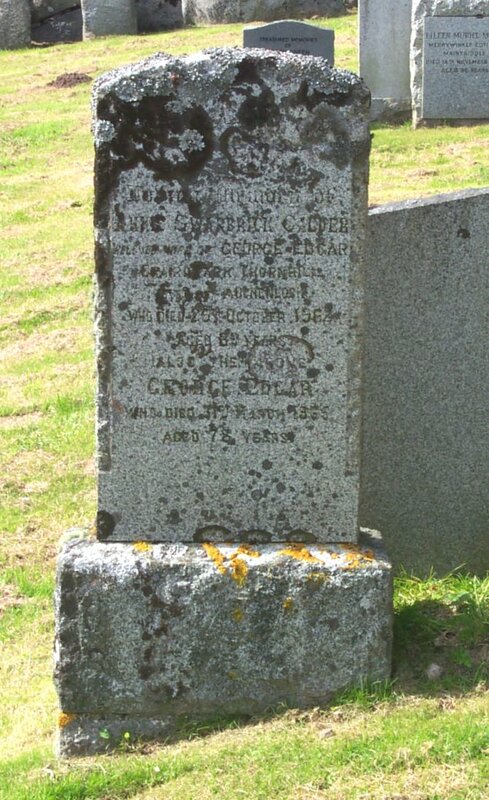 Also George Craik McCraith, their grandson, who died 29th December 1835, aged 20 months. 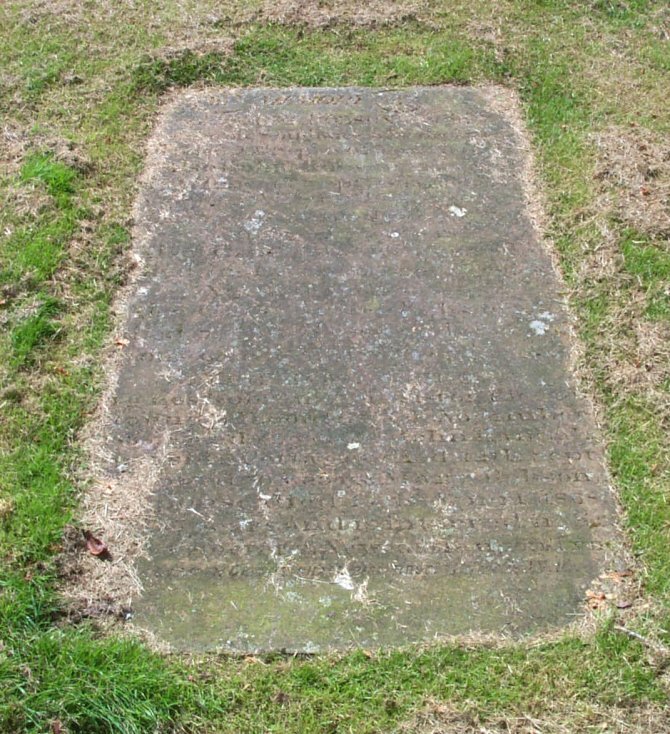 Also John, son of William McCraith, who died at Whitecroft, 16th December 1848, aged 49 years. Also Mary Crtaik, his spouse, who died at Hallscome of Benbrook, Cannada West, 11th Feb’y 1874, aged 71 years. 004 In memory of Mary Bell, spouse of John Riddick, who died at Southwick House, 21st May 1859, aged 44 years. Also Elizabeth his daughter, who died there 21st Feb’y. 1860 aged 20 years. Also an infant. Also William Riddick, born 18th October 1857, and died 31st January 1862. Also Robert Stewart Riddick, born 23rd August 1845, died 30th January 1864. 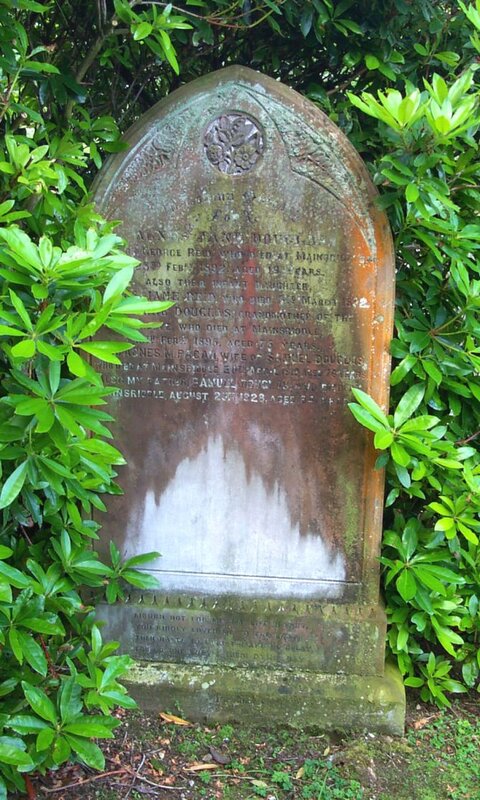 Also Anne Riddick, born 18th December 1864, died 1st February 1865. 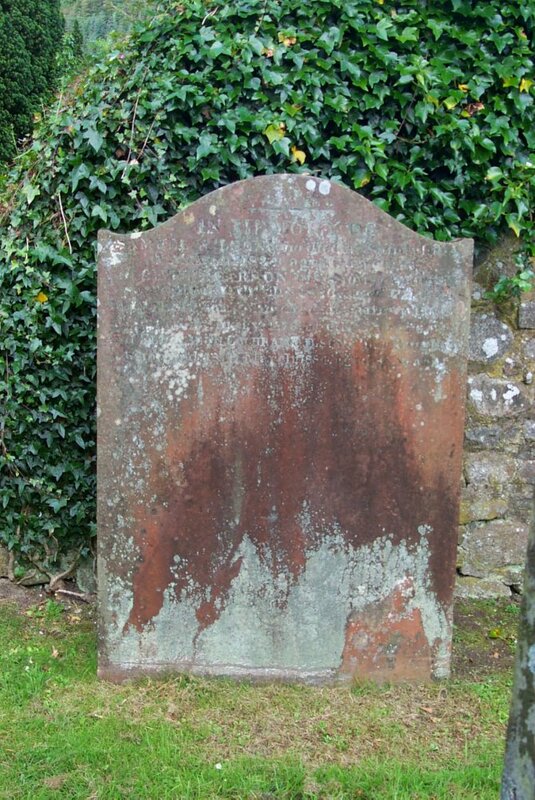 Also John Riddick who died at Knockenhooly, July 5th 1867 aged 47 years. Also John Riddick his son who was drowned in America 1872. Isabella Stewart Riddick, who died in Edinburgh 9th April 1877, aged 27 years. 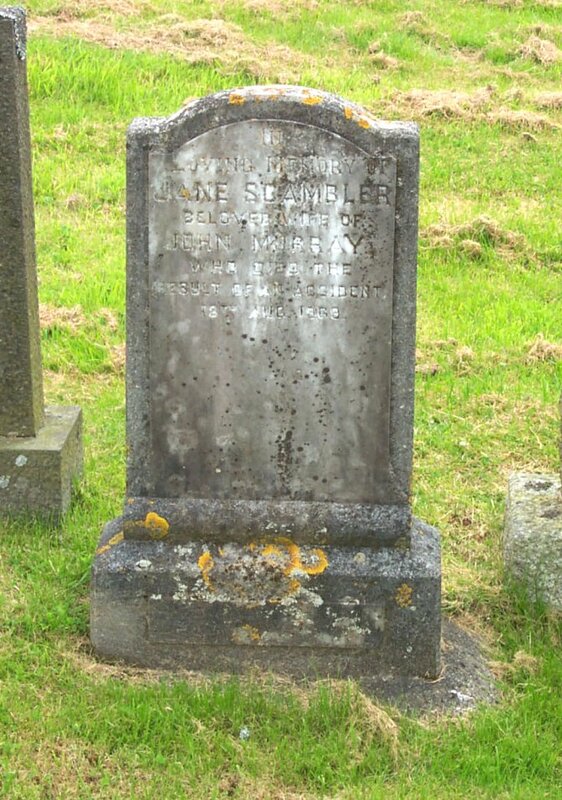 Sarah Bell, second wife of James Riddick who died at Shawfoot, Southwick 5th April 1901, aged 76 years. 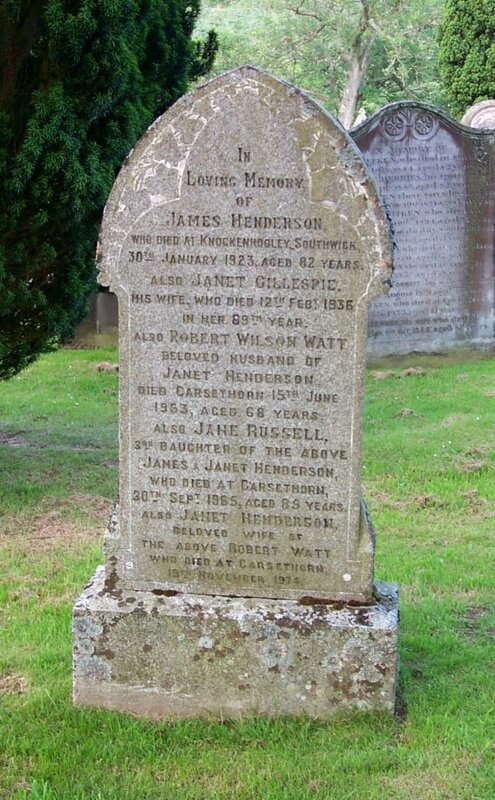 005 In loving memory of James Henderson, who died at Knockenhooley, Southwick, 30th January 1923, aged 82 years. Also Janet Gillespie, his wife, who died 12th Feb’y 1936, aged in her 89th year. 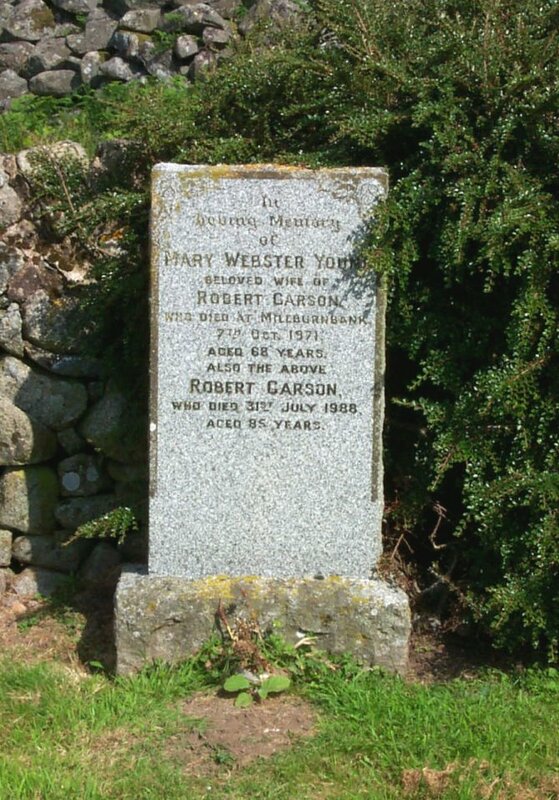 Also Robert Wilson Watt, beloved husband of Janet Henderson, died Carsethorn, 15th June 1953, aged 68 years. Also Jane Russell, 3rd daughter of the above James & Janet Henderson, who died at Carsethorn, 30th Sept. 1965, aged 85 years. Also Janet Henderson, beloved wife of the above Robert Watt, who died at Carsethorn, 19th November 1974. 006 In loving memory of Dora Margaret Tait, beloved wife of William Black, who died at Ford, Bridge of Dee, 4th Dec’r 1937, aged 70 years. Also John Craik their son, and Dora Agnes Elizabeth their daughter, who died in infancy. Also the above William Black who died at Ford, Bridge of Dee, 6th Oct’r 1944, aged 84 years. 007 In loving memory of James Thomson, who died at Knockenhooly, Southwick, on 24th Jan’y. 1922, aged 69 years. Also Devina his daughter, who died in infancy. Also Robert, son of the above, who died in France on active service 21st Oct. 1916, aged 34 years. Also James, son of the above who died in France on active service 9th Jan’ry 1917, aged 32 years. Also Elizabeth Fair, widow of the above, who died 28th March 1942, aged 86 years. 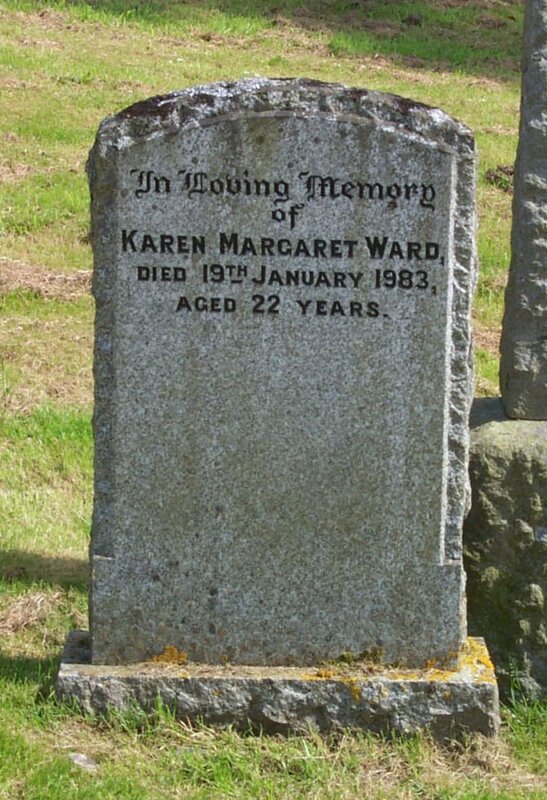 Also Margaret, their daughter, who died at Leith 5th Feb. 1953, aged 69 years. 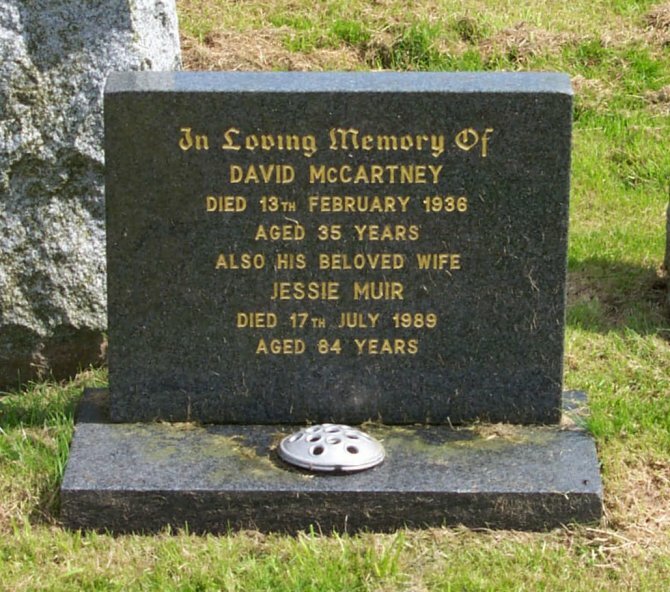 Also Joseph, their son, who died 17th July 1963, aged 62 years. Also Janet, their daughter, widow of David Love, who died 2nd April 1974, aged 87 years. Also Archibald their youngest son who died 1st Sep. 1977, aged 74 years. 008 Sacred to the memory of Robert Lochery, husband of Helen Muir, who died at Southwick, 2nd Dec. 1919, aged 64 years. Also Helen Muir, wife of the above, who died at Southwick, 15th May 1935, aged 72 years. 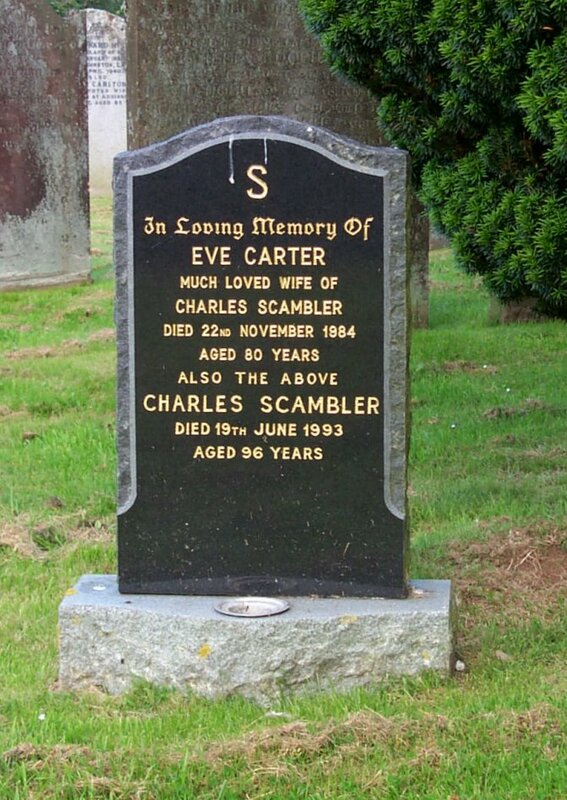 009 In loving memory of Eve Carter, much loved wife of Charles Scambler, died 22nd November 1984, aged 80 years. Also the above Charles Scambler, died 19th June 1993, aged 96 years. 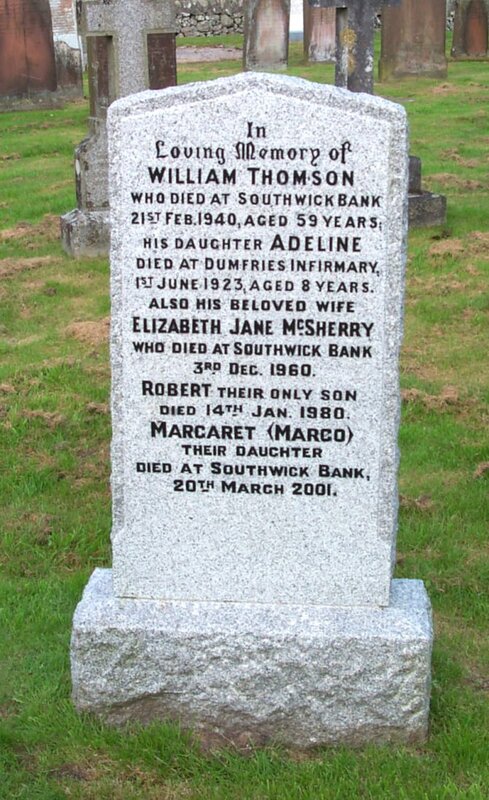 009a In loving memory of William Thomson, who died at Southwick Bank, 21st Feb 1940, aged 59 years. His daughter Adeline, died at Dumfries Infirmary 1st June 1923, aged 8 years. 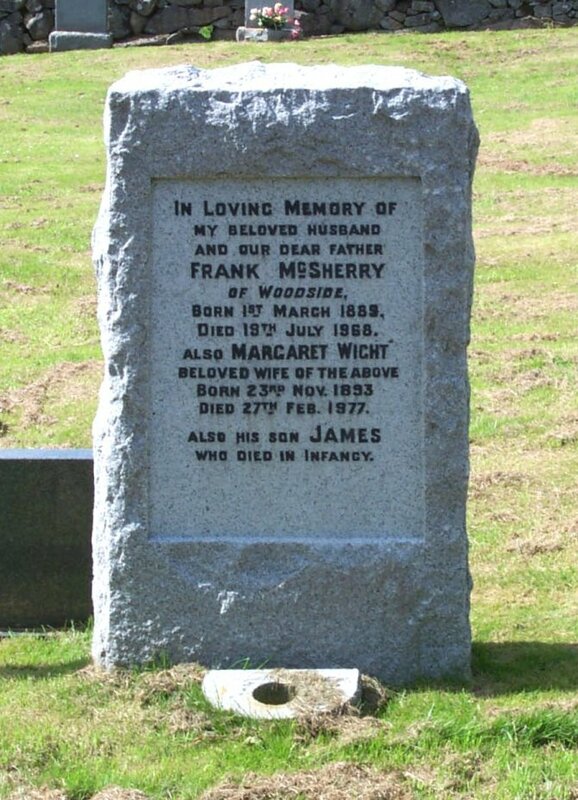 Also his beloved wife Elizabeth Jane McSherry, who died at Southwick Bank 3rd Dec. 1960. Robert, their only son, died 14th Jan. 1980. Margaret (Margo) their daughter, died at Southwick Bank, 20th March 2001. 010 Erected to the memory of Agnes Dobie, who died 21st Sept. 1811, aged 18 years. Also James Dobie, who died 1st June 1817, aged 18 years. And William Dobie, who was lost at sea in 1821, aged 25 years. Also David Dobie, who was killed at Quebec, 14th July 1831, aged 22 years. And William Dobie, father of the above, who died 1st February 1829, aged 69 years. And Mary Lindsay, spouse to the above William Dobie, who died at Mainsriddle, 3rd December 1850, aged 84 years. Also Elizabeth Dobie, daughter to Rob’ t. Dobie and grand-daughter of the above, who was accidentally killed at Cowcors on the 15th Sept’r. 1856, aged 17 years. Erected by Robert Dobie, his son. (Reverse) Also Robert Dobie, who died at Barrhill, 7th March 1862, aged 57 years. Helen Grierson his wife, died 13th Feb. 1888, aged 78 years. 011 In memory of Robert Anderson, surgeon, Mainsriddle, who died 6th April 1862. Isabella Dobie, his wife, who died 9th August 1864. Their two daughters Margaret, who died in infancy. Also Mary Anderson, daughter of the above and wife of Thomas Gibson, who died at Mainsriddle, 15th Feb’y 1895, aged 68 years. Also Thomas Gibson, who died at Mainsriddle, 28th June 1911, aged 84 years. Also John Gibson, their son, who died 29th November 1915, aged 54 years. 012 In memory of James Aitken, who died at Southwick Bank, 2nd July 1844, aged 82 years. Also Margaret Herries, his spouse, who died 29th Sept’r. 1846, aged 82 years. Also James Aitken, their son, who died in Birmingham, Nov’r. 10th 1821, aged 20 years. Also Robert Aitken, who died in Norwich, March 10th 1824, aged 25 years. John Aitken, who died at Southwick Bank, 23rd May 1869, aged 71 years. Elizabeth Aitken, who died at same place, 9th Nov’r. 1870, aged 67 years. Also Samuel Aitken, who died at same place, 29th Oct, 1883, aged 78 years. And Margaret Forrest, his wife, who died there 22nd August 1891, aged 77 years. John Aitken, who died at Crocketford, 21st Feb. 1933, aged 81 years. Helen Stewart, his wife, who died at Castle Douglas, 8th Oct. 1944, aged 83 years. 013 In memory of Capt. 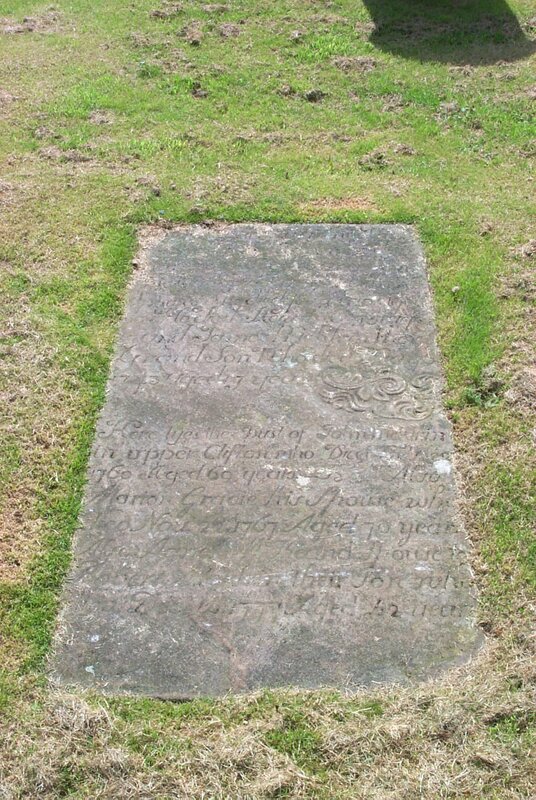 Samuel Robson, late in Glebe of Southwick, who departed this life 22nd Sept. 1803, aged 26 years. Also John Robson, who died at Glebe, 4th Sept. 1811, aged 70 years. Also Jean Young, his spouse, di24th March 1811, aged 72 years. Also Capt. John Robson, who died in Liverpool, 12th Nov. 1810, aged 25 years. Also Capt. 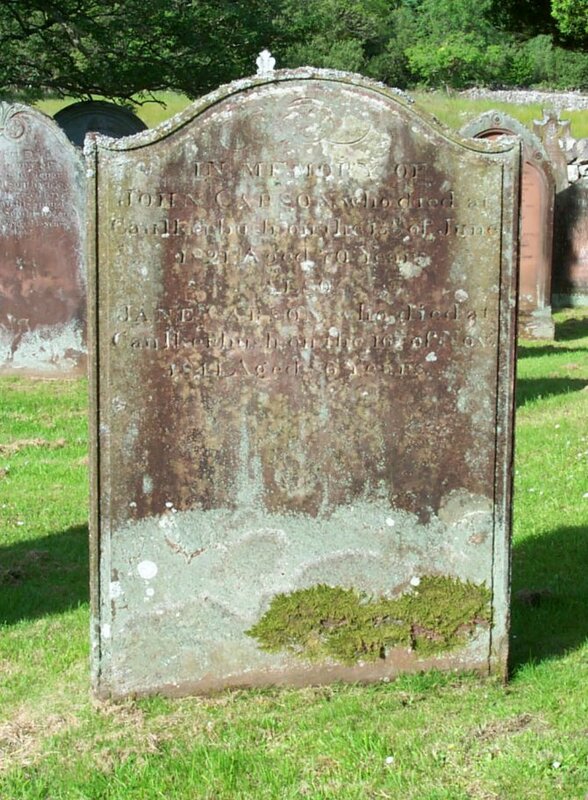 James Robson who died 7th April 1811, aged 41 years. Sons of the above John Robson. And Jean Young Agnes Robson, their sister, died at Roundfell, Southwick, November 1838, aged 71 years. John Hannah, Burnside Cottage, died 12th Sept. 1865, aged 70 years. Mary Robson, his spouse, died 15th April 1868, aged 75 years, and is interred in St. John’s Cemetery, Newcastle upon Tyne. The dead in Christ shall rise first. 014 In memory of Robert Nicholson in Drumcow, who died 26th September 1812, aged 67 years. Also Jean Haugh, his mother in law, who died 9th November 1791, aged 78 years. 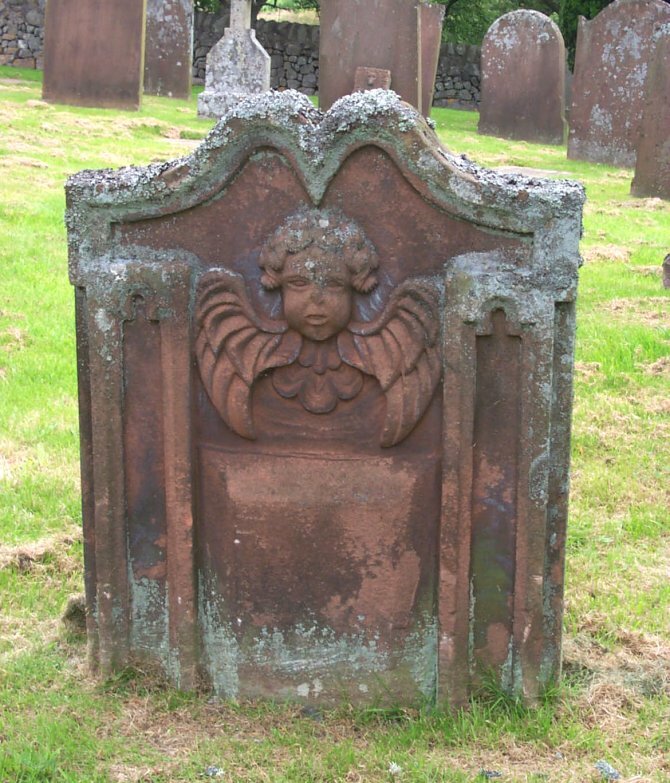 Also Margaret Nicholson, daughter of the above Robert Nicholson, who died 13th August 1784, aged 4 months. And John Nicholson, his son, who died 17th October 1785, aged 3 months. 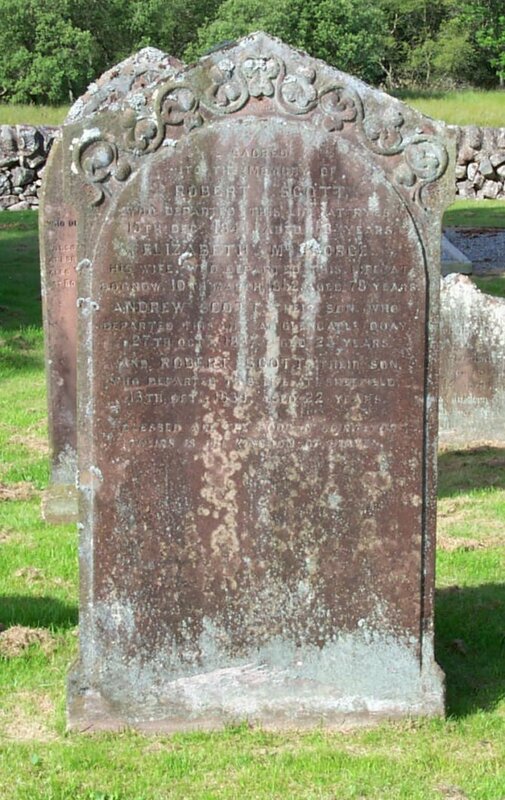 Also Mary Nicholson, spouse to John Johnston in Drumcow, and daughter of the above Robert Nicholson, who died 30th Dec’r 1813, aged 35 years. And of Nicholas Nicholson, his spouse, who died 10th October 1822, aged 79 years. And Jean Nicholson, her sister, who died 6th July 1836, aged 77 years. 015 In loving memory of Elizabeth Blackwood Smith, beloved wife of John Osborne Tait, who died at Clonyard, Southwick, January 22nd 1897, aged 59 years. Also John Osborne Tait, who died at Millburn Bank, Southwick, 6th December 1908, aged 91 years. 016 In memory of John Harries, who died at Parkhead, 29th April 1826, aged 57 years. Also his daughter Mary, who died in infancy. 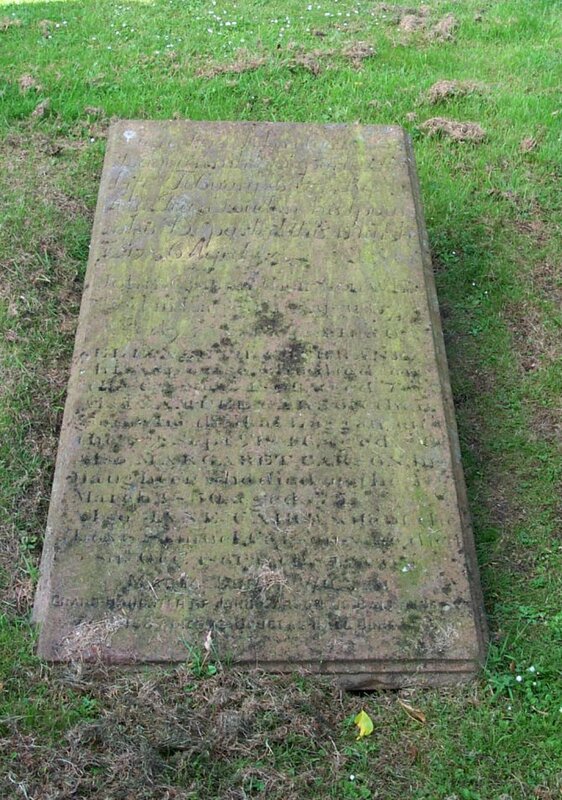 Also Janet Gibson, his wife, died 5 Jan’y 1848, aged 76 years. 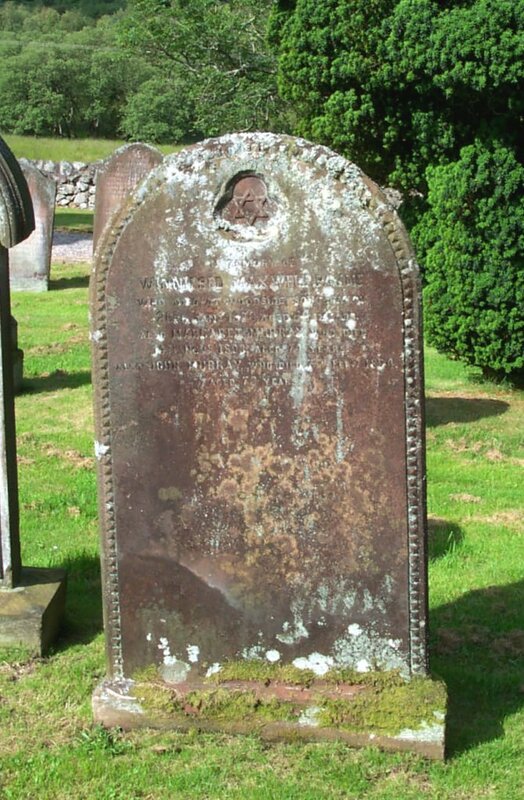 Also William Harries, son of John Harries, joiner, Glensone, who died 22 October 1839, aged 6 years. Also Henrietta Harries, who died 22 May 1850, aged 12 years. Also the said John Harries, who died in Maxwelltown, 16th November 1862, aged 59. Also Henrietta Kirkpatrick, his wife, who died at same place, 18th March 1882, aged 81. 017 In loving memory of Agnes Marion, third daughter of Adam Davidson, who died at Low Glensone, 11th May 1887, aged 6 years & 10 months. Also Janet, his eldest daughter, who died at Culkiest, 6th August 1894, aged 32 years. 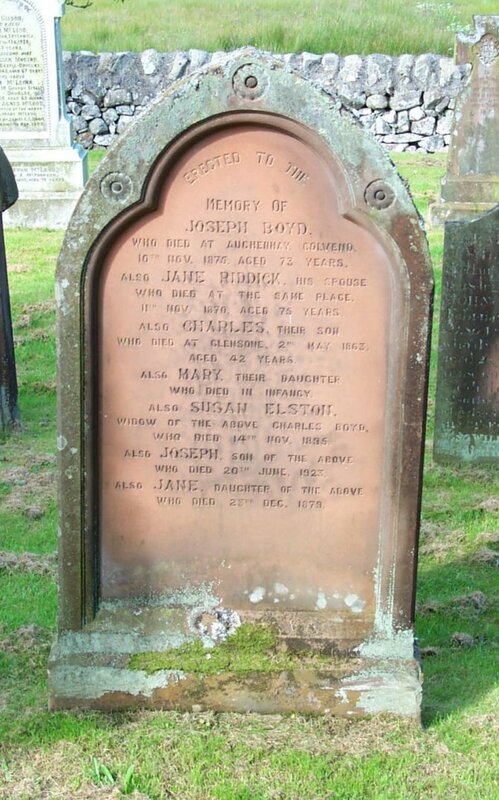 The above Adam Davidson, who died at Bogfoot, 6th Sept. 1906, aged 65 years. Also Marion Bell, his wife who died at Bogfoot, 8th Dec. 1905, aged 61 years. Pte. Adam Edward Davidson, R.S., their son, died of wounds in Palestine, 6th Nov. 1917, aged 34 years. John Adam Davidson, who was killed in action, near Zonnebeke, Belgium, 9th Oct. 1917, aged 21 years, beloved son of Walter and Catherine Davidson, of Didsbury, Manchester, and grandson of the above Adam and Marion Davidson. 018 In memory of Samuel Wilson, who died at Sandyhills, 12th April 1834, aged 76 years. And Betty Carson, his spouse, who died at same place, 15th Feb’y. 1836, aged 72 years. Also Elizabeth Cochrane Wilson, their daughter, who died 18th March 1884, aged 83 years. 019 In memory of John Aitken, who died at New Farm Cottage, 4th April 1882, aged 74 years. Also Marion Currie, spouse of above, who died at Dunmuck, 23rd October 1895, aged 87 years. 020 In memory of Catherine Adamson, spouse of William Wilson, in Cauckerbush, died the 13th of June 1820, aged 28 years. Also the above William Wilson, her husband, who died at New House, 19th July 1858, aged 75 years. And Agnes Graham, his second wife, who died there August 27th 1850, aged 86 years. Also of Jannet Wilson, daughter of the above W.W. & C.A., who died at Greengrove, Torthorwald, 27th Oct. 1896, aged 82 years. 020a Here lyeth Andrew (Desey) of Glenstocking, who died first of August 1660. 021 Here lyes the body of Alexander Lindsay of Millhill who departed this life Dec’r 12th 1722 aged 45 years. 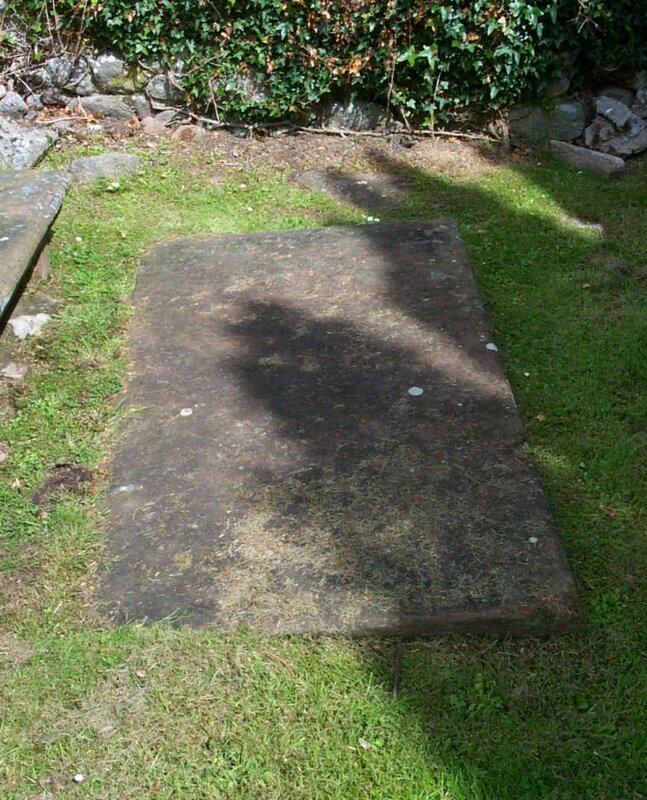 Also the body of Barbara Herries, his spouse, who departed this life April 18th 1760 aged 81 years. 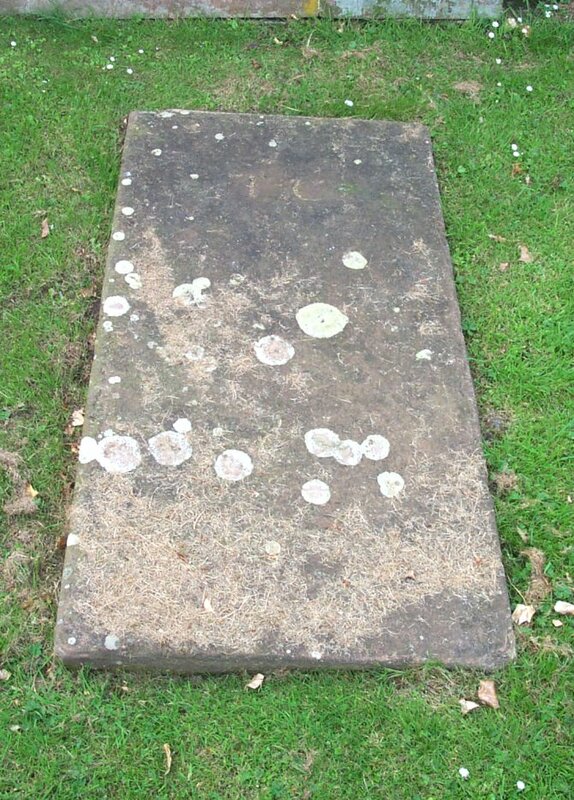 022 Here lyes the body of William Carlyle, only son to Michael Carlyle of Locharthur, who died the 1st day of Jun. 1750, aged 22 years. 024 In memory of John Gibson Jun’r., farmer Auchenlosh, son of John Gibson and Janet McWilliam, who died on the 14th Sep. 1868, aged 56 years. Erected by his heirs, Mary and Janet Gibson. 025 In memory of Joseph Seaton who died the 16th of May 1831 aged 35 years. Also Janet Seaton aged 4 months. Also Robert Seaton, their father, who died at Auchenskeoch Mill, 19th Dec’r. 1837, aged 66 years. Also Mary Hume, his spouse, who died 11th Dec’r. 1841 aged 77 years. Also Mary Seaton, his grand-daughter who died 21 Nov’r. 1840, aged 13 years. 027 In memory of John McKnight in Peathill, who died on the 11th day of Sept’r. 1798, aged 85 years. 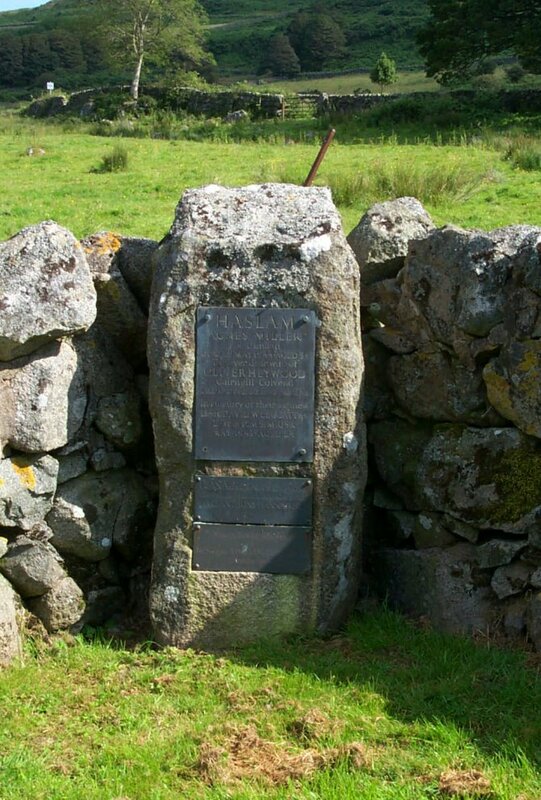 The name of McKnight lived in Felside of Borland and Peathill for two hundred and eighty five years. Also Mary McClellan, his spouse who departed this life on the 29th day of Dec’r. l801 aged 64 years. 028 In loving memory of Samuel Thomson, died at Rosefield, Pettico, Ireland, 26th March 1899, aged 77 years. 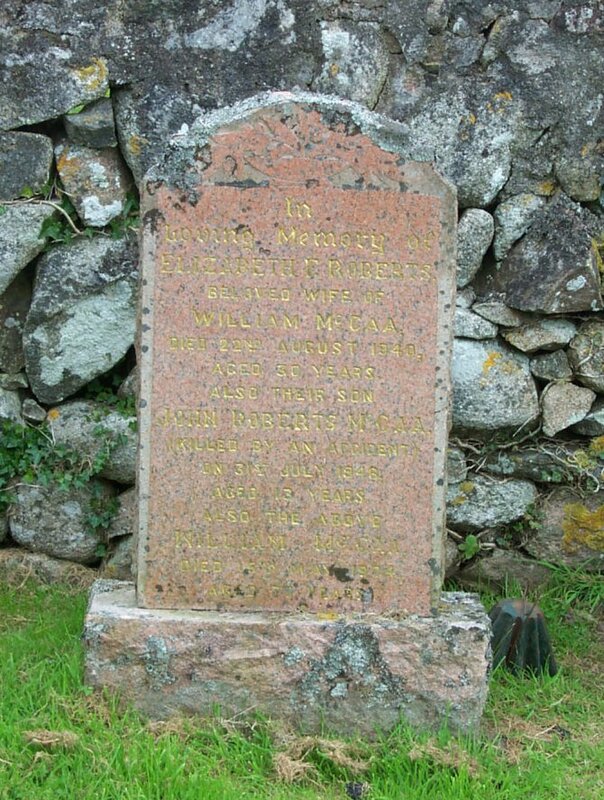 Mary McNae, his wife, died at Whitecroft Cottage, Southwick, 29th Dec. 1895, aged 75 years. 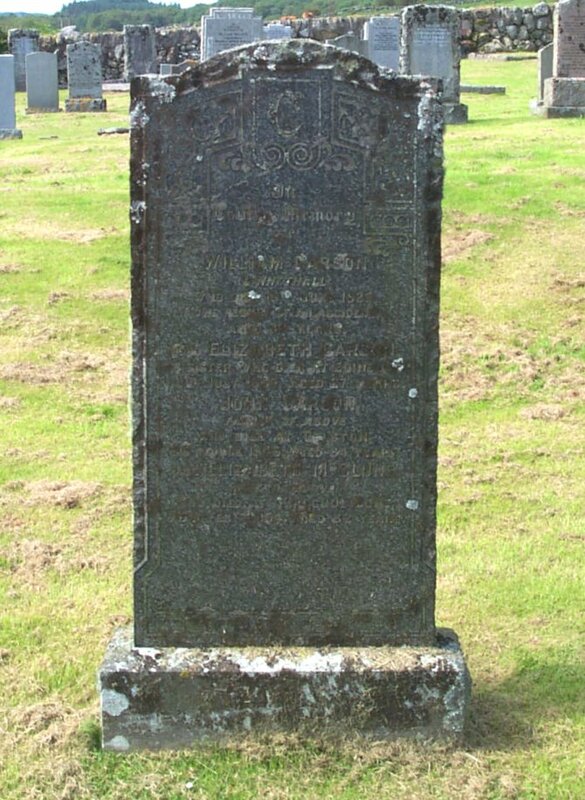 Catherine, their daughter, died at Breckoniehill Cottage, Buittle, 1st Sep. 1901, aged 43 years. Joseph, their son, died in infancy. 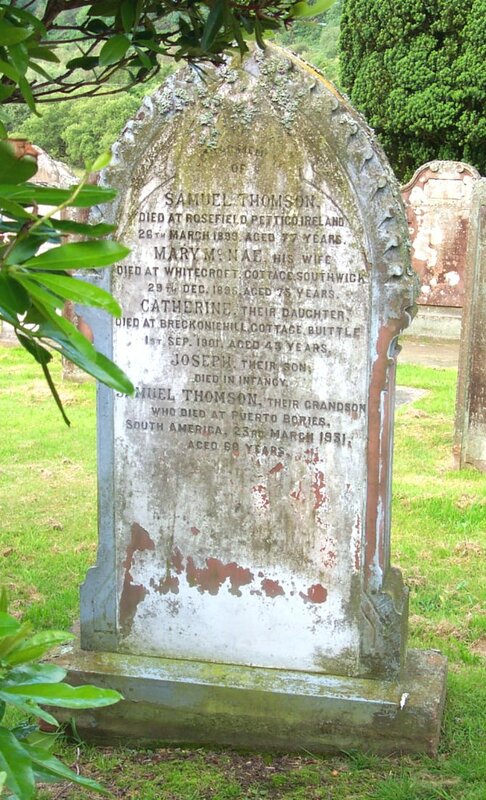 Samuel Thomson, their grandson, who died at Puerto Bories, South America, 23rd March 1931, aged 60 years. 029 In loving memory of Jane Bell McMichael, beloved wife of William Scambler, died at Glebe, Southwick, 9th Dec. 1897, aged 43 years. Elizabeth Allen Scambler, their daughter, died at Borgue, 16th Aug. 1908, aged 21 years. Kathleen Allen Scambler, their grand-daughter, died 19th Dec. 1929, aged 9 months. Also the above William Scambler, died 18th Feb. 1948, aged 89 years. Also his son Robert Scambler, died at Glebe, 9th March 1965, aged 76 years. Also Catherine Allen Scambler, died 29th Aug. 1985, in her 94th year. 030 In loving memory of James Peacock, who died at Millbrae, Maxwelltown, June 23rd 1894, aged 63 years. 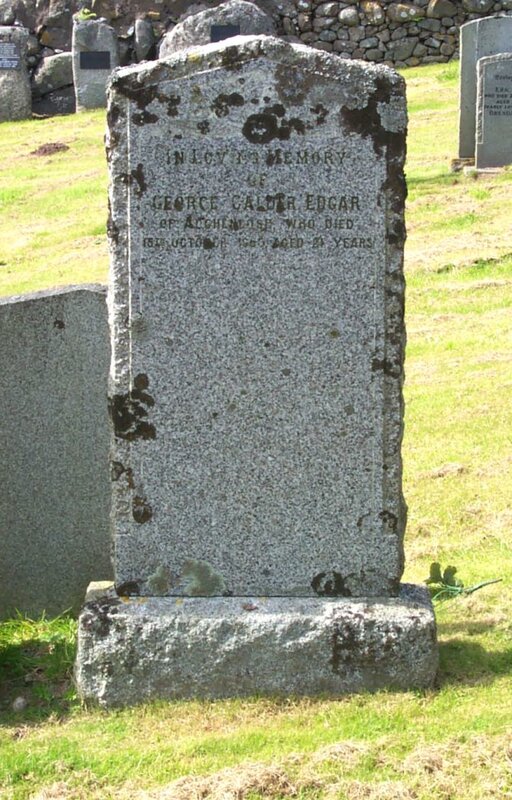 Also Agnes McGuinnis, his wife, who died at Bogfoot, Southwick, March 9th 1885, aged 62 years. Erected by W & C Jardine. 031 In memory of John Murray, who died at Bairness. 25th Dec’r. 1844, aged 60 years. Also two daughter, who died young. 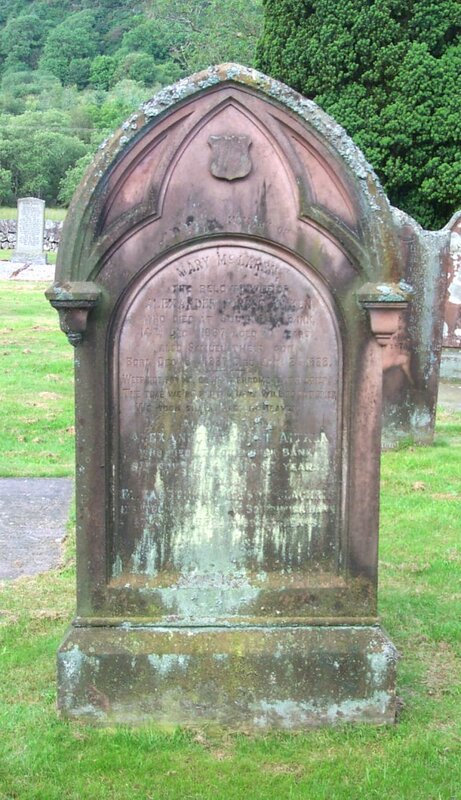 Also John, son of the above John Murray, born May 23rd 1844, died at Dumfries 6th Jan. 1863. ALso Jane Thorburn, spouse of the above, who died 12th March 1874, aged 74 years. Also Agnes Holder, daughter of the above, who died at Calkerbush, 5th June 1885, aged 50 years. 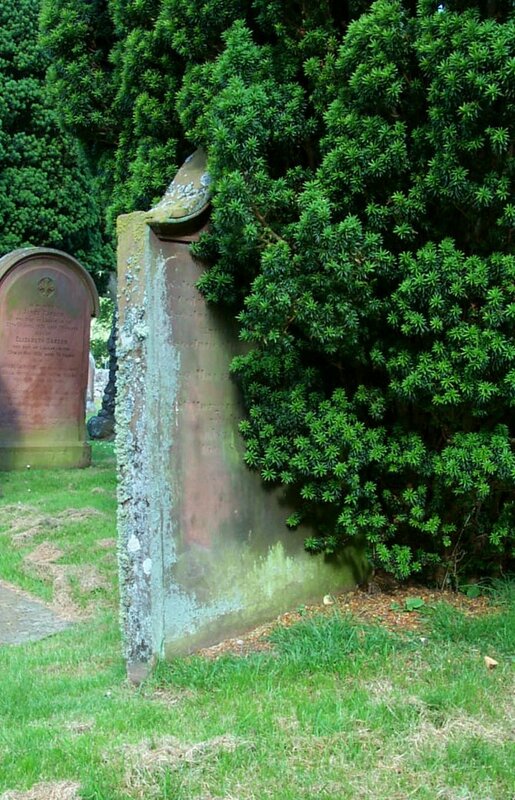 Both interred in St. Michaels, Dumfries. Also William Murray, who died in Liverpool, 5th Oct. 1894, aged 61 years. 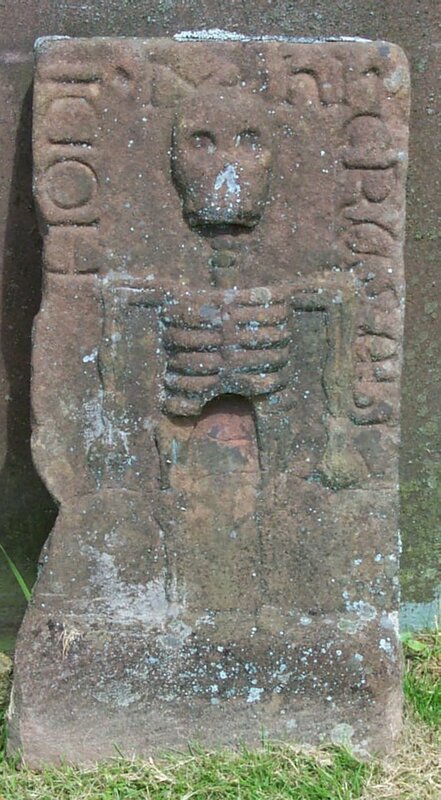 Interred in Annfield Cemetery. Also James Murray, died in Edinburgh, 26th April 1897, aged 66 years. 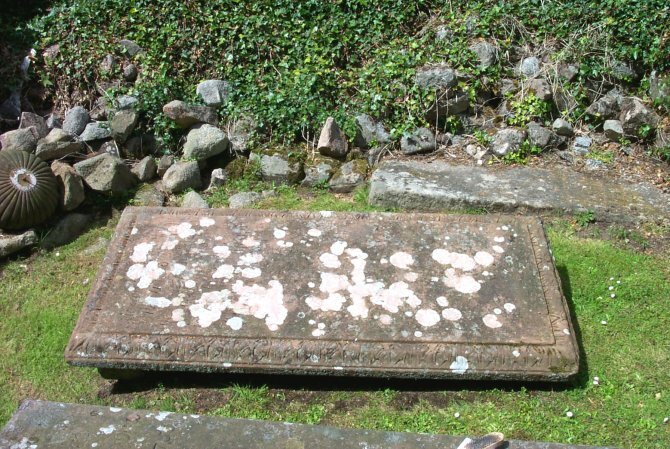 Interred in Dalry Cemetery. 033 In memory of John Gibson, in Auchenlosh, who died Anno 1762, in the 68th year of his age. Also Janet Kirkonnald his spouse, who died Anno 1778, in the 70th year of her age. 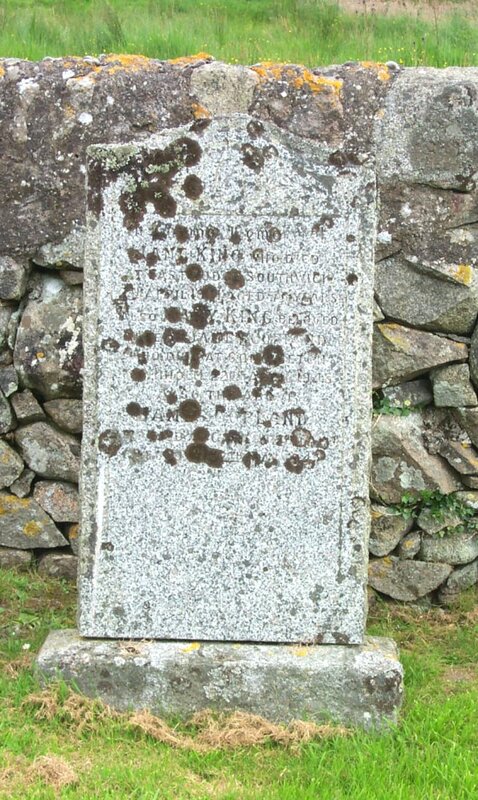 Also Thomas Gibson, in Torra, their son, who died Anno 1798, in the 63rd year of his age. Also John, Thomas, Helen & Agnes, their children. 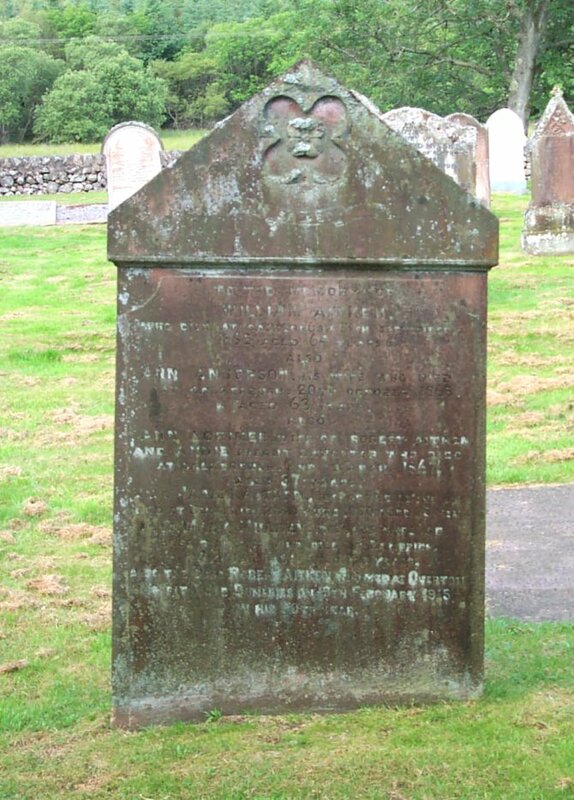 Also John Gibson, in Auchenlosh, who died the 20th of June 1807, in the 80th year of his age. 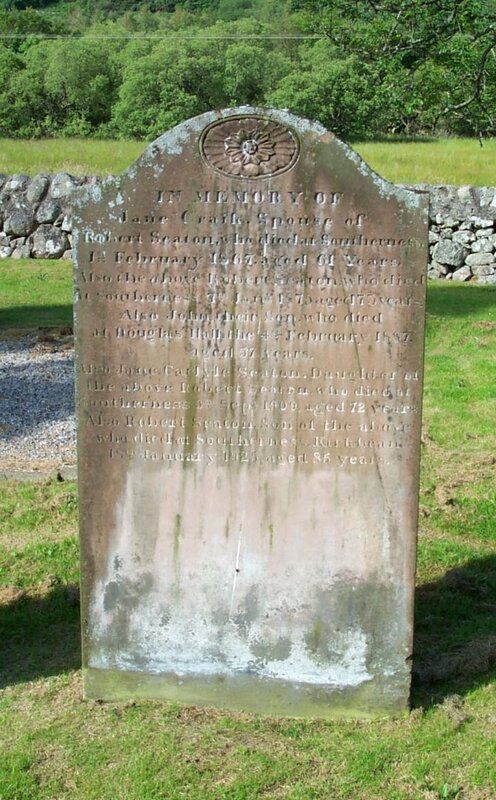 Also James Gibson, in Auchenlosh, who died the 21st of April 1808, in the 76th year of his age. 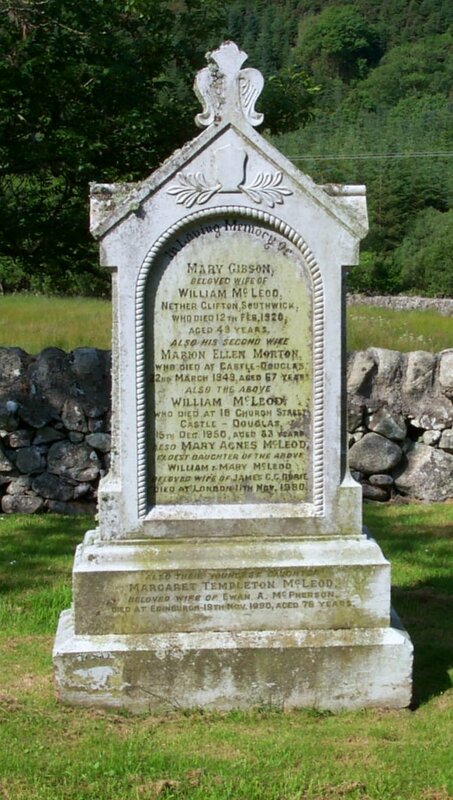 Also Mary McWilliam, spouse to Robert Gibson, who died the 23rd of March 1812, in the 23rd year of her age. 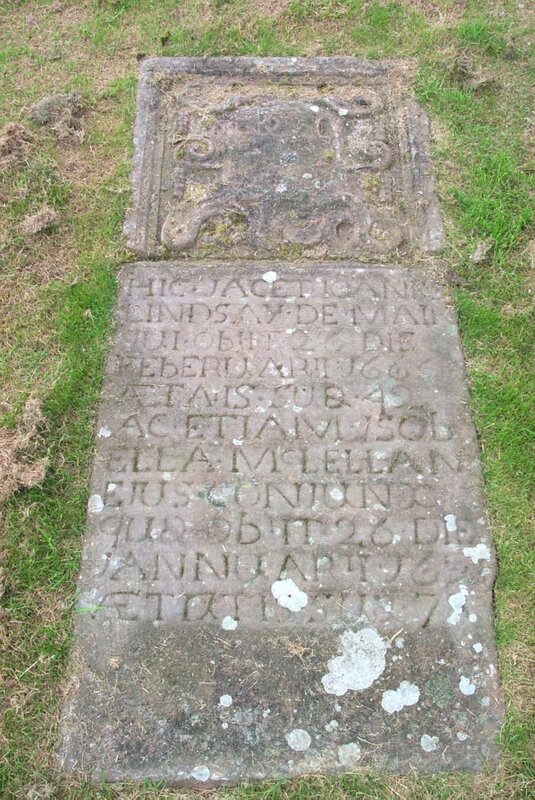 Also Janet McWilliam, wife of John Gibson Jun’r., who died 27th Jan. 1816, aged 23 years. 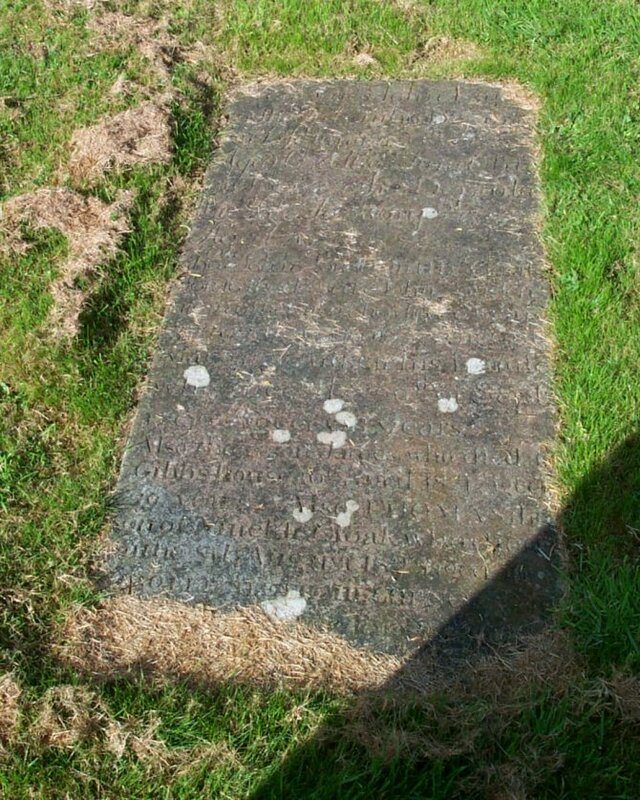 Also Margaret Herries, wife of John Gibson Sen., who died 5th May 1819, aged 86 years. 034 In loving memory of Mary McLaren, the beloved wife of Alexander Forest Aitken, who died at Southwick Bank, 14th Dec’r. 1887, aged 37 years. Also Samuel, their son, born Dec’r. 8th 1887, died Jan’y. 2nd 1888. Also the above Alexander Forest Aitken, who died at Southwick Bank, 6th Nov’r. 1934, aged 87 years. Also Elizabeth Donaldson Clachrie, his widow, who died at Southwick Bank, 6th Jan’y. 1938, aged 85 years. 035 Erected in memory of Margaret Gibson, spouse to James Robison, in Parkhead, who died 7th September 1822, aged 29 years. Also James Robison and John Robison, her two sons, being one year old each when they died. 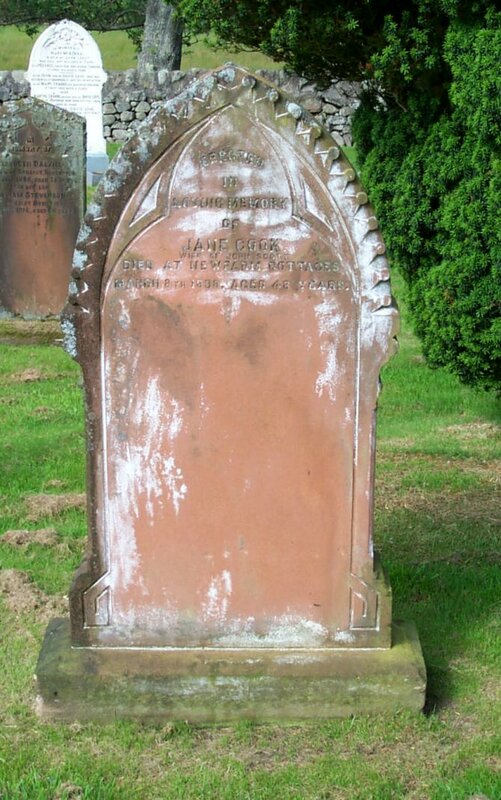 Also James Robson, mason, who died at Parkhead, August 19th 1857, aged 70 years. Also Ellen Saggie, his wife, who died at Bareness, 18th Jan’y. 1878, aged 82 years. 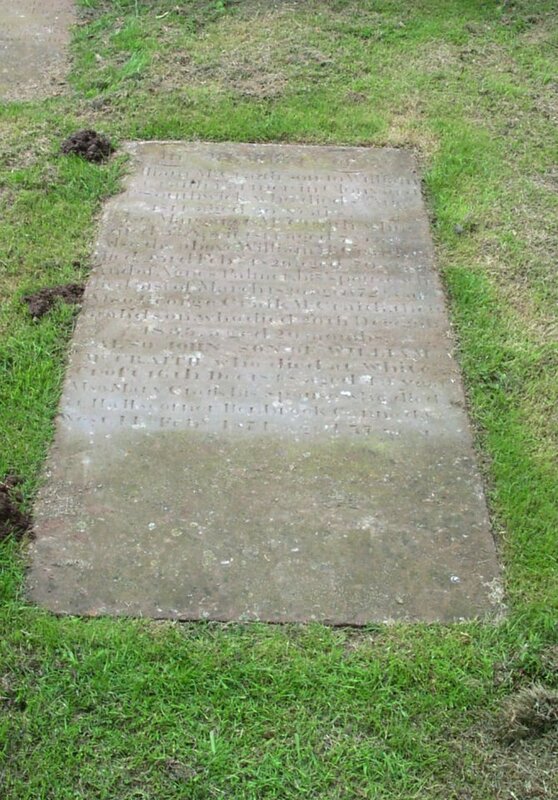 Also John Radcliff, grandson of James Robson, who died at Parkhead, 21st May 1857, aged 16 years. Agnes Gunyon, beloved wife of James Robson, who died at Bareness, 9th March 1909, aged 78 years. James Robson, who died at Mains Mill, 28th January 1913, in his 84th year. 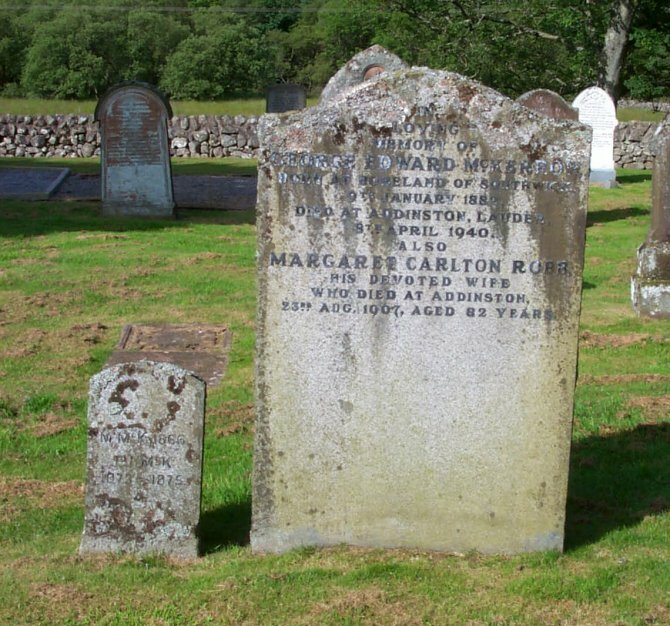 Mary Johnstone Tait, who died at Dalbeattie, 8th January 1933, aged 71 years. 037 Sacred to the memory of William Aitken, who died at Calkerbush, 13th September 1865, aged 64 years. Also Ann Anderson, his wife who died at Calkerbush, 20th October 1865, aged 63 years. Also Ann Lorimer, wife of Robert Aitken, and Annie, infant daughter, who died at Calkerbush, 2nd March 1867, aged 37 years. 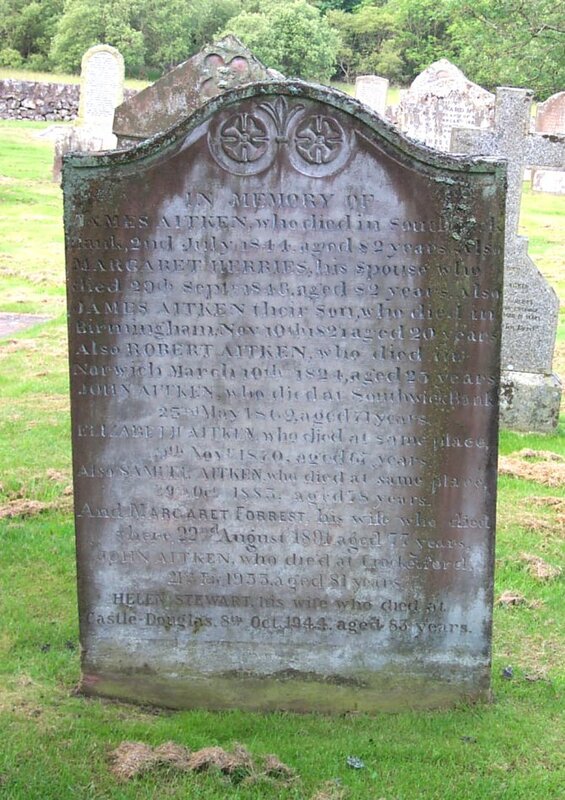 Also James Aitken, son of the above, who died at Dumfries, 23rd June 1890, aged 65 years. 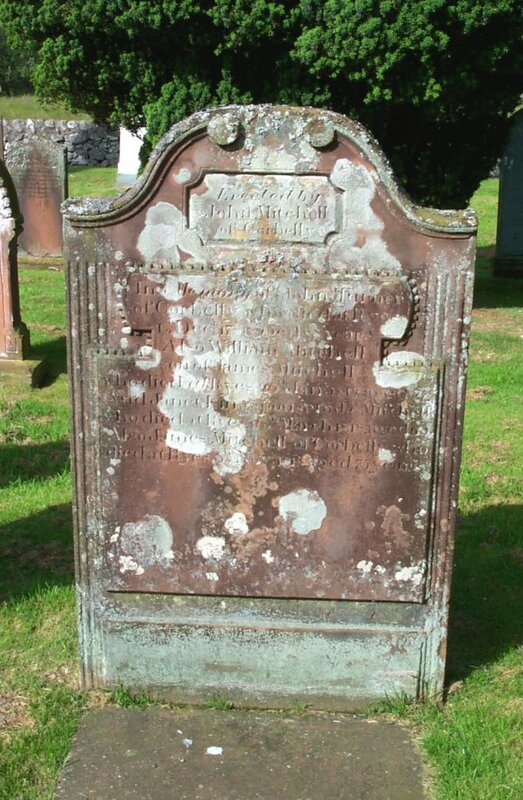 Also Mary Murray, beloved wife of Robert Aitken, who died at Dumfries, 4th Jan’y 1901, aged 70 years. Also the said Robert Aitken, who died at Overton, Moffat Road, Dumfries, 19th February 1915, in his 90th year. 038 In memory of Jannet Wright, of this Parish, who departed this life, on the 27th of July 1831, aged 38 years. Also Hugh Wright, who died at Brough, Oct’r. 18th 1848, aged 78 years. And Ann Lewis, his spouse, who died there Dec’r. 17th 1846, aged 80 years. Also William, their son, who died there Aug. 23rd 1845, aged 36 years. 039 In loving memory of Janet McCaig, wife of Samuel Booth, who died at Auchenlosh Cottage, 12th Sept. 1895, aged 73 years. Also Samuel Booth, husband of the above. 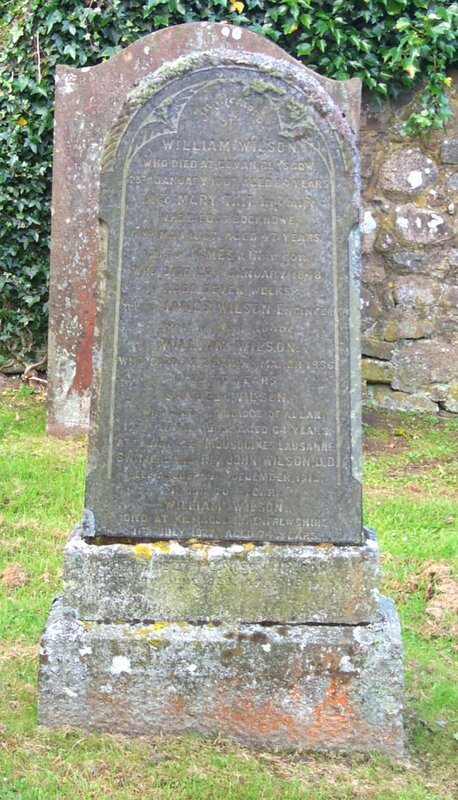 040 In memory of William Wallace, late in Auchenlosh, who died at Newabbey-mill, Sept’r 8th 1861, aged 83 years. Also Helen Maxwell, wife, who died at Boguefoot, Feb’y. 16th 1844, aged 56 years. Ann, his daughter, who died at Knockenhuley, Dec’r. 26th 1836, aged 25 years. 041 In loving memory of George McCardle, who died at Cushat Grove, 9th November, 1905, aged 78 years. Elizabeth Wallace, his wife who died at Cushat Grove, 20th May 1913, aged 86 years. Lizzie Ellen McCardle, grand-daughter of the above, who died at Maxwelltown, 9th August 1926, aged 44 years. Grace McCradle, grand-daughter of the above, who died at Dumfries, March 17th 1929, aged 52 years. 042 In loving memory of our father Hindle Taylor, who died at Auchenskeoch, 21st February 1889, aged 75 years. 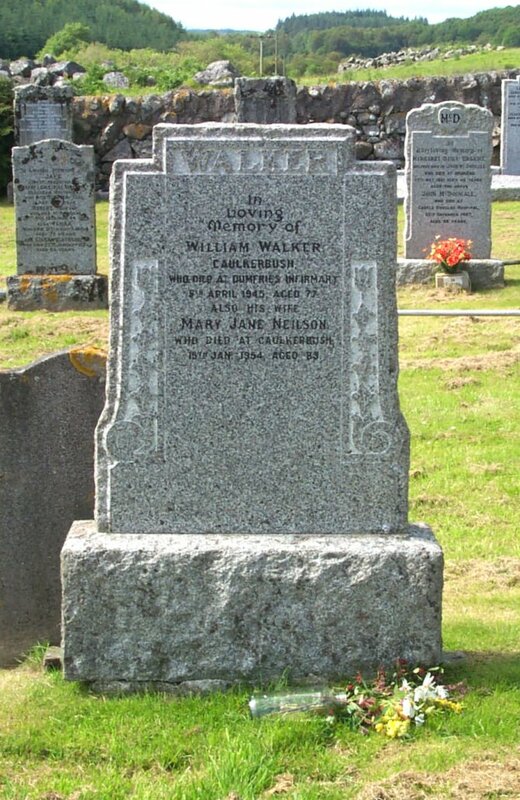 Jane Wallace, his wife who died 31st March 1891, aged 63 years. 043 In loving memory of Fanny Taylor, who died 10th October 1896, aged 36. 044 In memory of John Gordon, who died at Plumjordan, Southwick, 22nd April 1870, aged 48 years. Robert, his son, who was lost at sea 21st April 1872, aged 18 years. Also Jane Carter, wife of the above John Gordon, who died 4th January 1911, aged 82 years. 045 Here lyes Janet Cutler spouse of Pyarick Young of Auchnscioh, who departed the 16 of March 1691 aetatis 52. 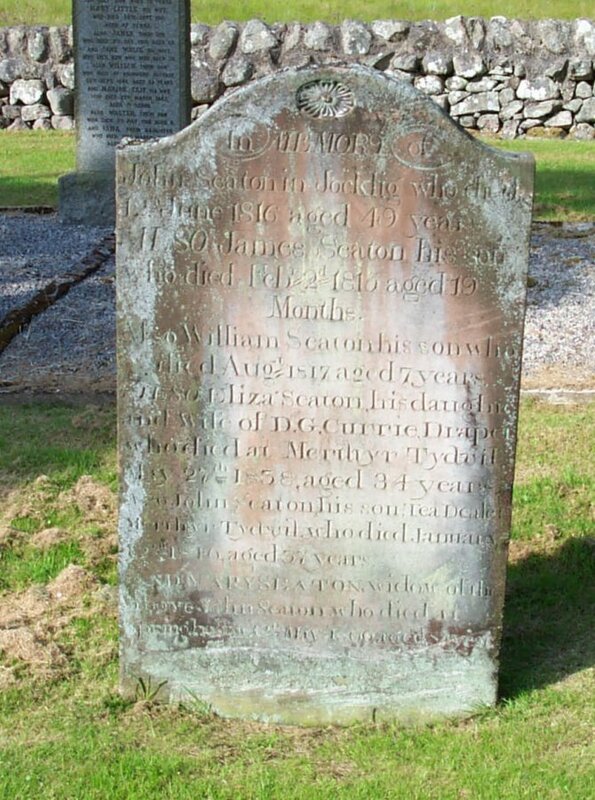 And William Young of Auchenskeoch who died 9 March 1713. 046 Small inscription. No name. See photograph. 047 In memory of William Anderson, late in Auchenskeock, who departed this life 26th October 1812, in the 82nd year of his age. 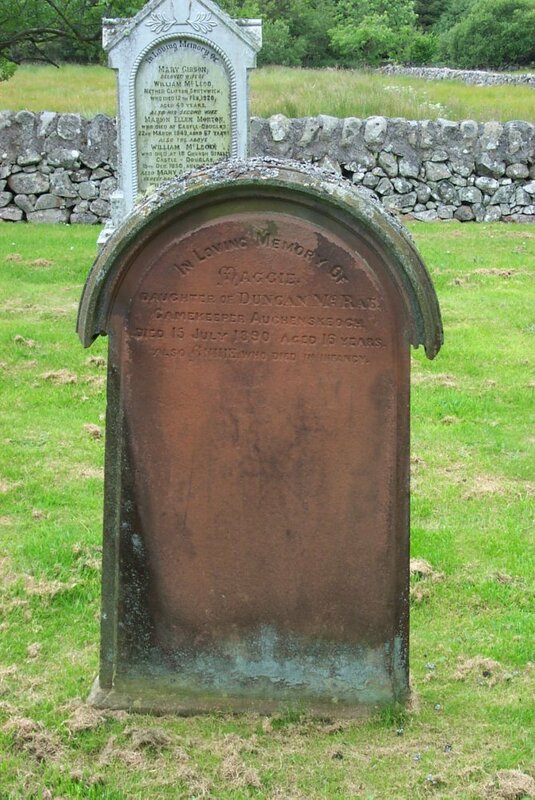 As also Christian Robson, spouse to William Anderson, Auchenskeoch, who died 7th March 1804 aged 77 years. Also of Janet Anderson their daughter, who died 31st May 1843, aged 70. 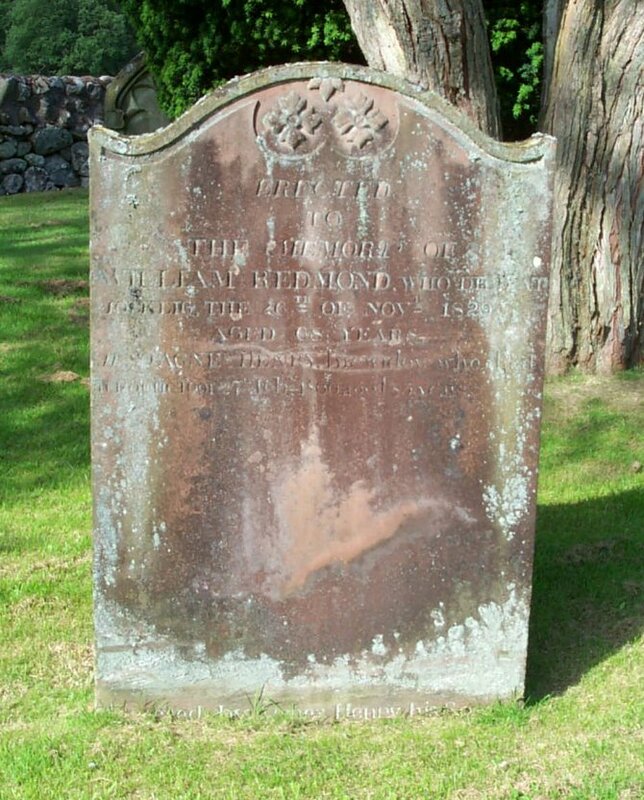 048 Here lyes the corpse of James Anderson in Auchenskeoch, who departed this life November 19 1752, aged 61. 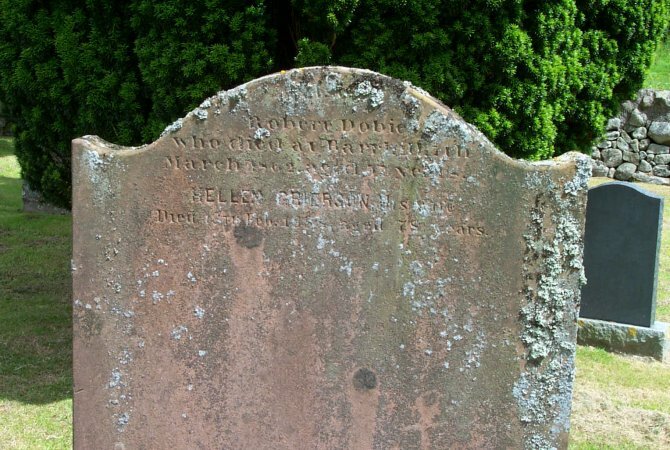 And also Helen Herries his spouse, who died July 7th 1760, aged 70 years. 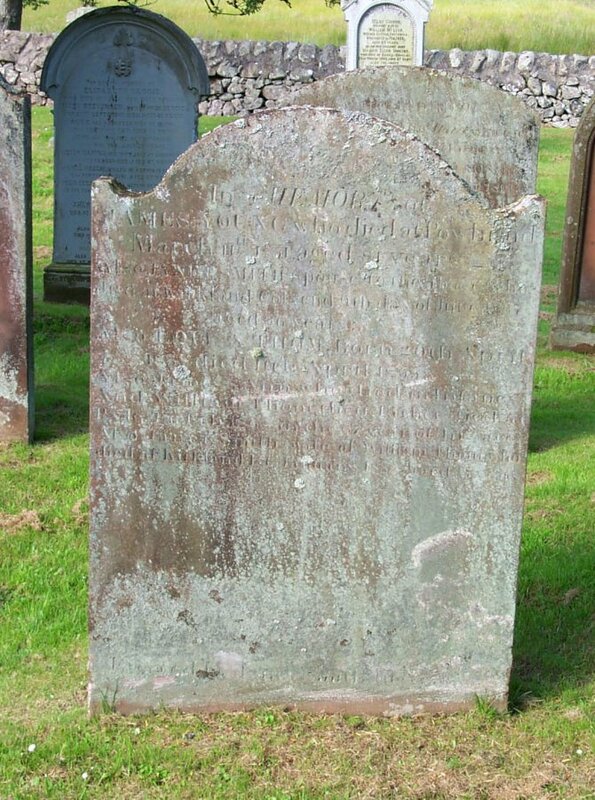 Also Robert Anderson, son of the deceased James Anderson, late in Coucors, who died Aprile 20th 1782, aged 55 years. 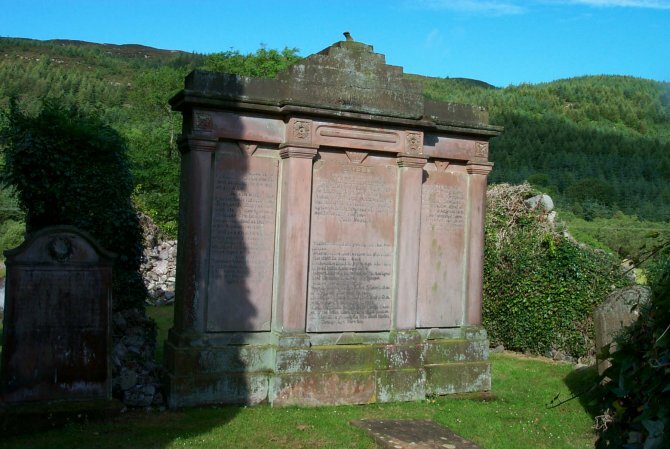 Also Nelly & Peggy Anderson, daughters of William Anderson in Auchenskeoch, who died, Peggy on the 13th & Nelly on the 25th February 1782. Nelly aged 21 & Peggy 20 years. They were loved in their lives, and in their deaths not divided. 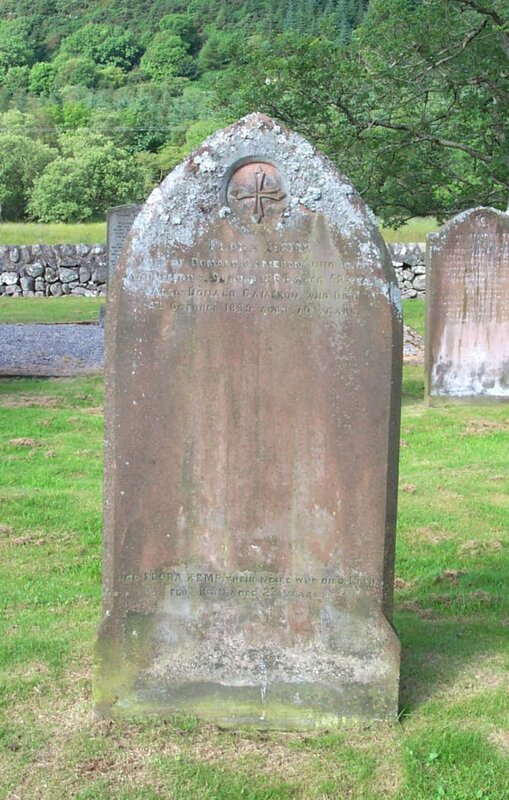 Also Mary Anderson, who died December the 23rd 1791, aged 21 years. Erected by his sons. 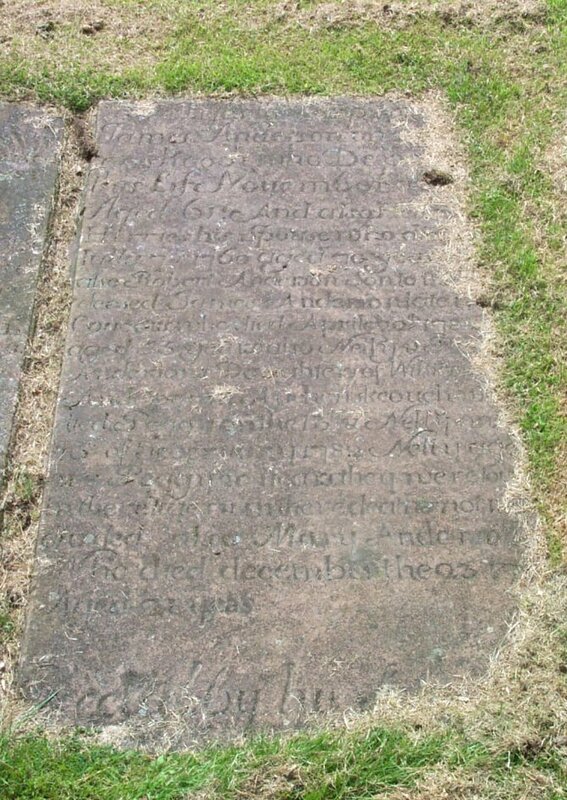 049 (Illegible) … and James McLirn, their grandson, who died (illegible) 1743, aged 13 years. 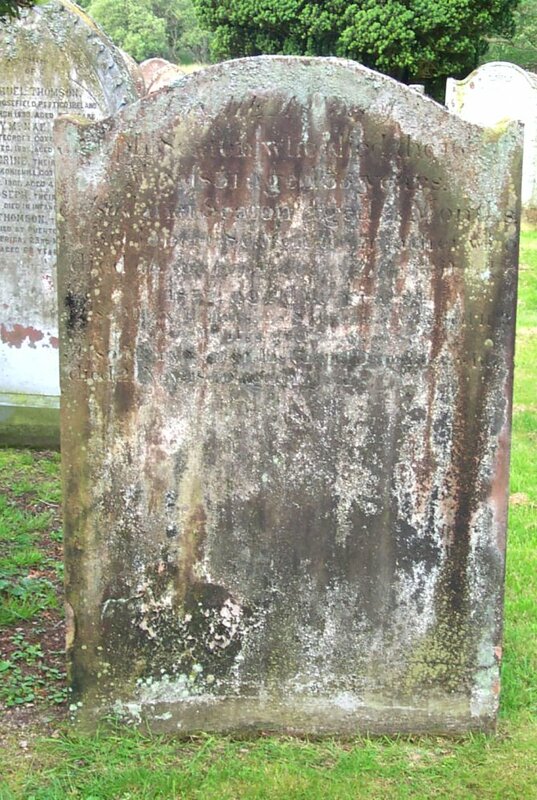 Here lyes the dust of John McKlirn in Upper Clifton, who died Feb’y 22nd 1760, aged 69 years. Also Marion Grace, his spouse, who died Nov. 22nd 1767, aged 70 years. 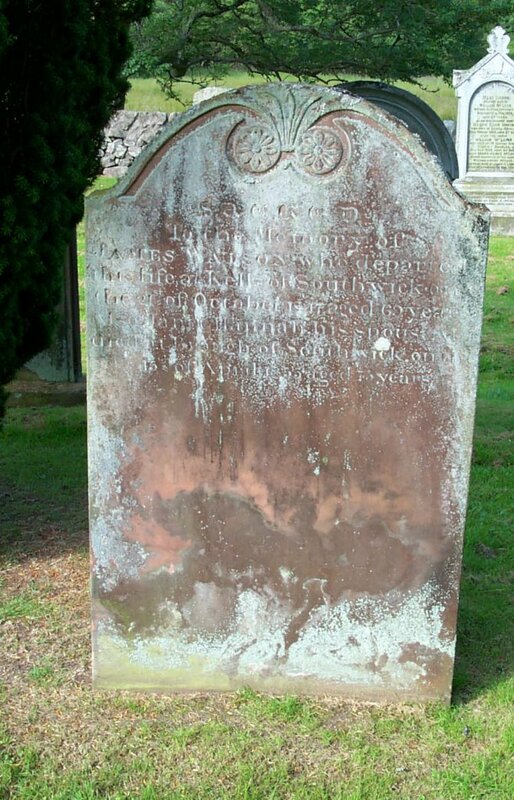 Also Agnes McKeand, spouse to Robert McLirn, who died Dec. 14th 1777, aged 42 years. 050 In memory of Thomas Johnston who died at Gateside of Colvend, 13th Nov’r.1812 aged 35 years. Also Margrat who died 3rd Dec’r. 1812 aged 4 months. Also John who died 10th May 1812 aged 7 years. And Jannet who died 12th August 1817, aged 10 years. Children of the said Thomas Johnston. Also Margaret Gibson, died there 8th July 1864, aged 90 years his spouse. Also Jean their daughter died 8th of May 1861 aged 58 years. Also Thomas their son died 1st Dec. 1864 aged 63 yrs. Also Walter their son who died 1st June 1875 aged 76 years. 051 In memory of Walter Gibson, who died at Torrs, Parish of Colvend, 8th of April 1850 aged 84 years. Also of Janet Riddick, his spouse, 28th Dec. 1838, aged 60 years. Also Jane, their daughter, died 8th of Oct'r 1812, aged 9 years. 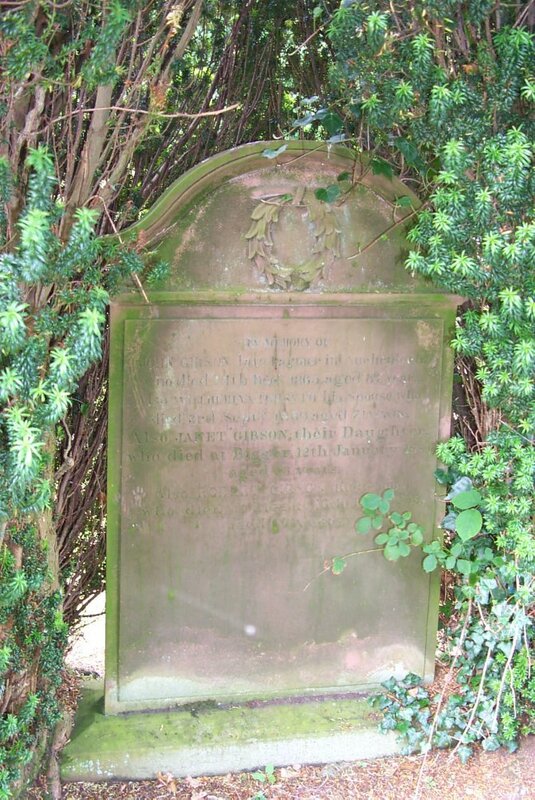 Also Mary, who died 18th February 1818, aged 12 years. And Margaret, who died in North America, 8th July 1847, aged 36 years. Also John, died at Gateside, 16th Sept. 1895, aged 84 years. 052 In memory of John Gibson, late farmer in Auchenlosh, who died 14th Dec’r. 1865, aged 87 years. Also Wilhelmina Forsyth, his spouse, who died 3rd Sept. 1869, aged 71 years. Also Janet Gibson, their daughter, who died at Biggar, 12th January 1884, aged 53 years. Also Robert Gibson, their son, who died at Biggar, 10th July 1895, aged 67 years. 053 Sacred to the memory of John Gibson, Mariner, who died at Palnackie, in the Parish of Buittle, on the 31st of March 1849, aged 60 years. 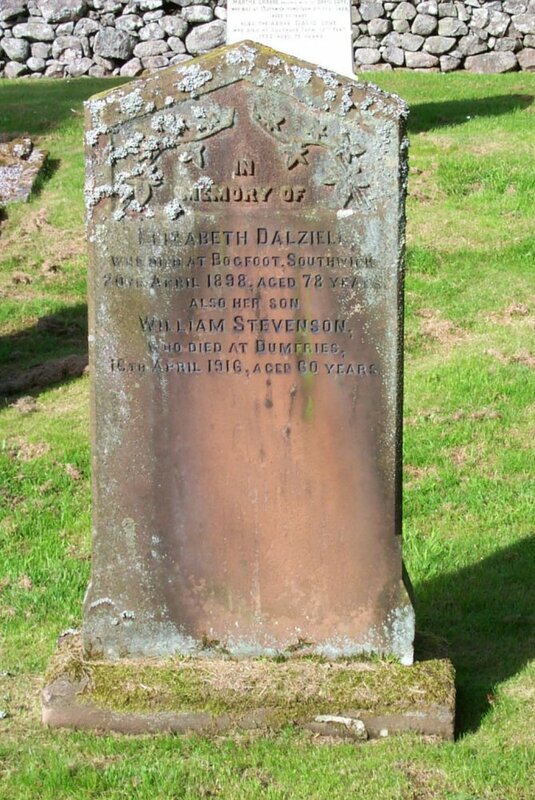 Also Elizabeth Neilson, his spouse, who died at Castle Douglas, 12th Jan’y. 1869, aged 81 years. 054 Erected to the memory of Robert Gibson, who was born at Auchenlosh, Southwick, on the 22nd July 1783, and died at Cullinaw, Buittle, on the26th July 1864. Also of his children, James, Margaret and Robert, who died in infancy. Rachel Dickson, spouse of the above Robert Gibson,who died at Castle Douglas, 15th Jan’y. 1871, in her 80th year. 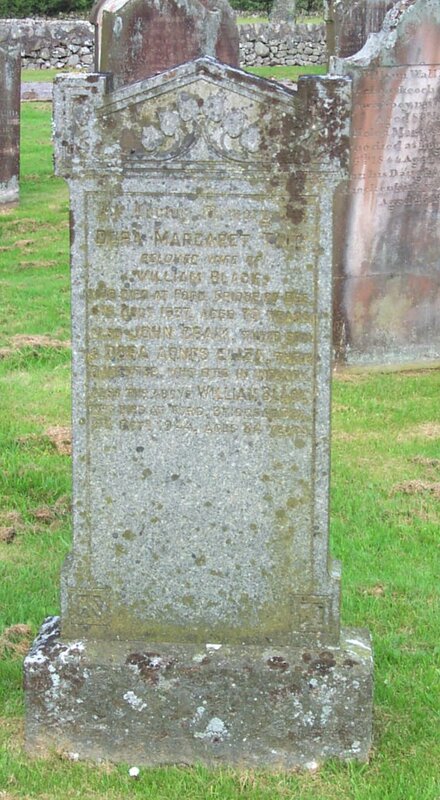 Also Margaret, their daughter who died at Castle-Douglas, 31st Jan’y. 1886, aged 67 years. 055 7. 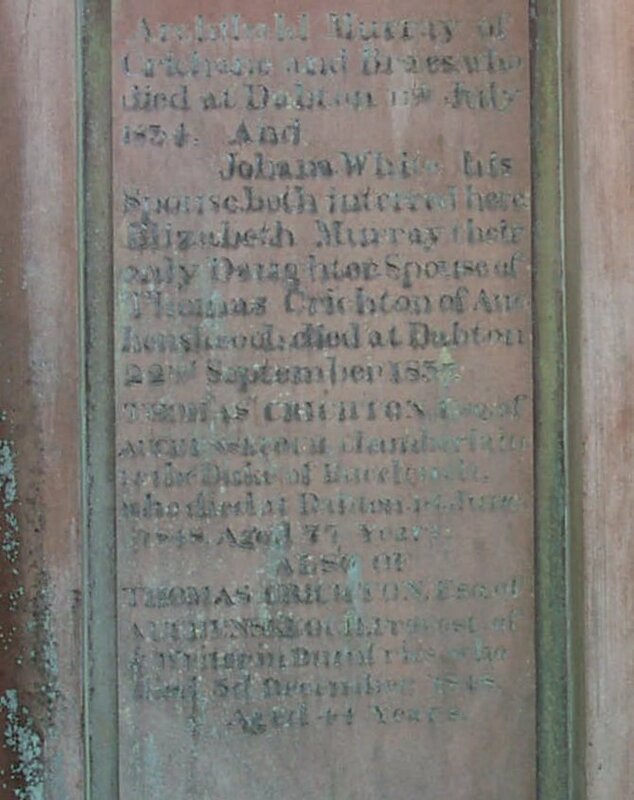 Thomas Crichton Esq., of Auchenskeoch, chamberlain to the Duke of Buccleuch, who died at Dabton, 1st June 1848, aged 77 years. 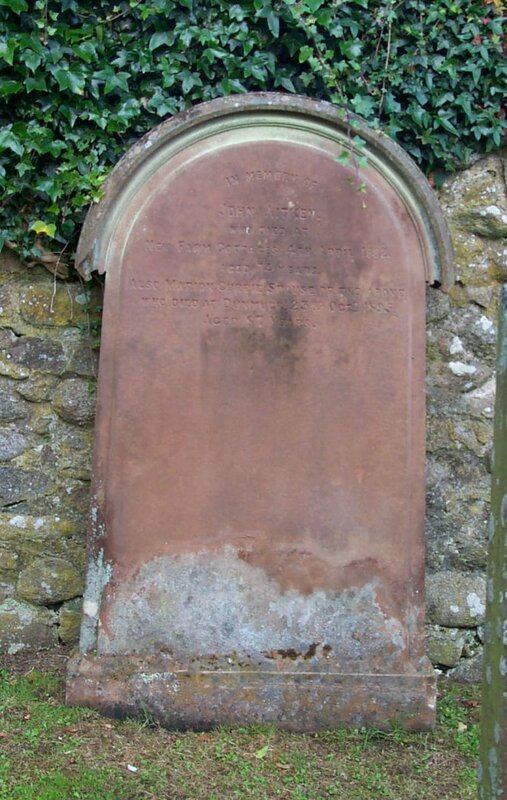 Also of Thomas Crichton, Esq., of Auchenskeoch, Provost of & Writer in Dumfries, who died 3rd December 1848, aged 44 years. 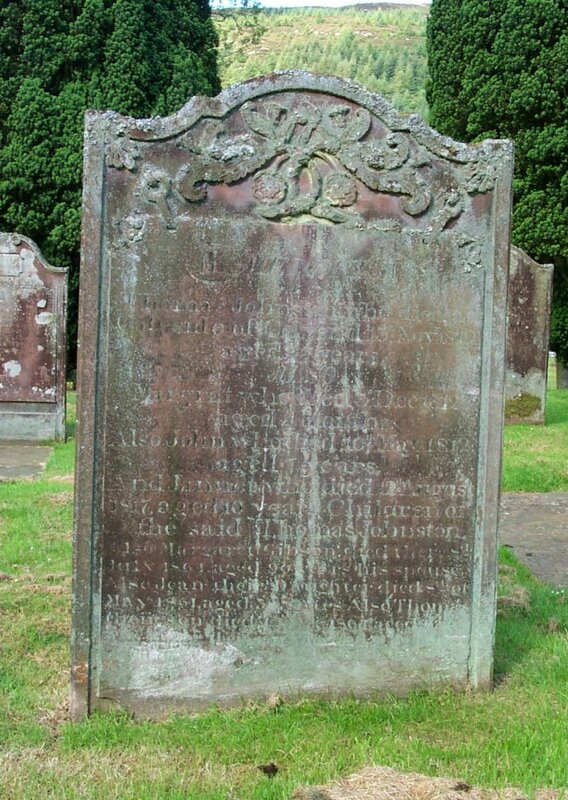 (b) Sacred to the memory of Thomas Crichton, of Auchenskeoch, who died in 1784. And Catharine Denholm, his spouse, No Issue. 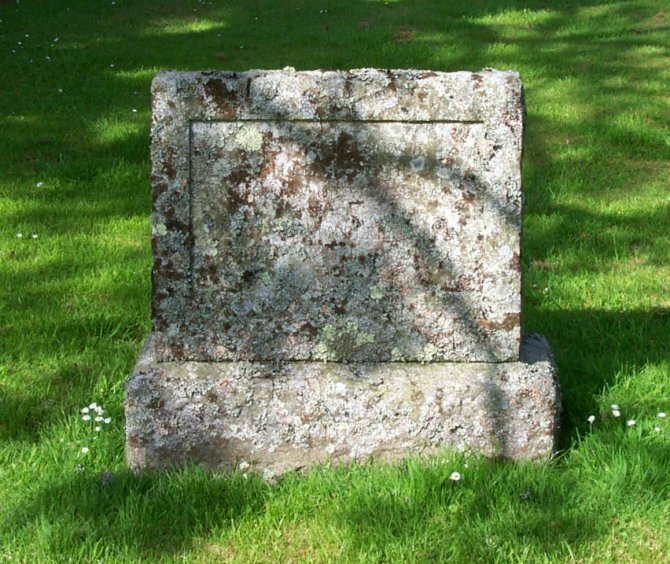 Robert Crichton, of Auchenskeoch, who died at Borland in 1799. And Agnes Wilson his spouse, who died in 1806. Both interred here. Their Family, William, who died young in the West Indies. Walter, sometime farmer in Borland, who died 1841. And Catharine Barber, his spouse, who died in 1840. Both interred here. Robert, Physician, who died in Antigua, And Eleanor Murray his spouse, James, who died young. Sarah, relict of the Revd. James Wilson of Tynron, who died in 1841. David, Lt. Colonel in the East India Companys Service, who died in 1845. John, Captain in the East India Companys Service, died in the East Indies. Charles, died young in the East India Campanys Service. (c). 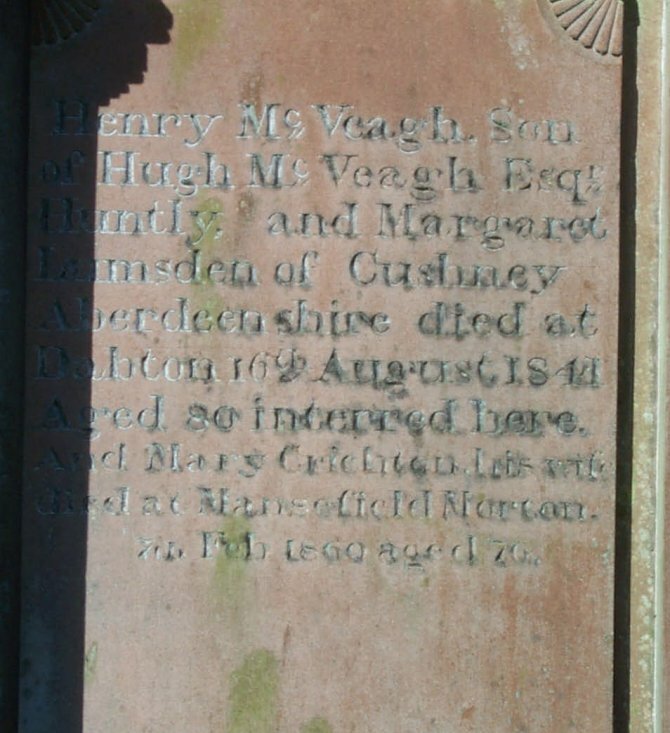 Henry McVeagh, son of Hugh McVeagh, Esq’r., Huntly, and Margaret Lumsden of Cushney, Aberdeenshire, died at Dabton, 16th August 1841, aged 80. Interred here. And Mary Crichton, his wife, died at Mansfield Morton, 7th Feb. 1860, aged 76. 056 In memory of Jam's Gibson, son to William Gibson, Dunmuck, who died Feb. 12th 1774, aged 15 years. 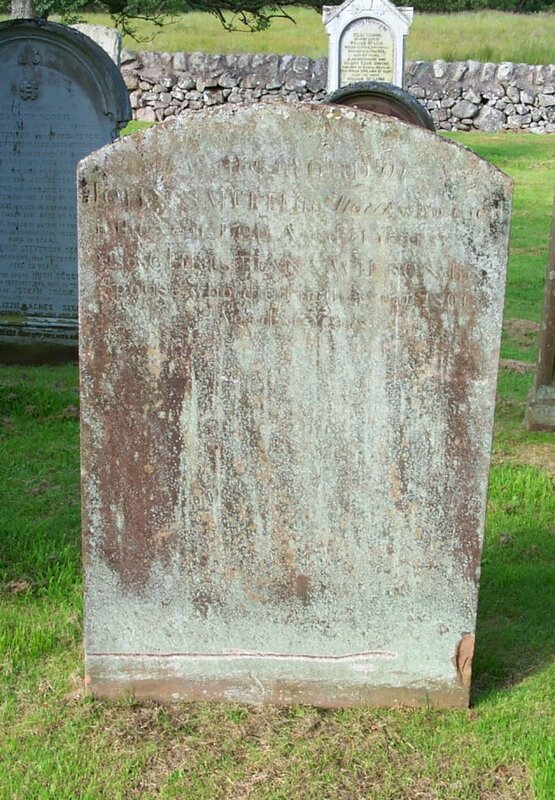 Also Jean Newell, souse to Will'm Gibson, who died Feb. 10th 1788, aged 66 years. Also William Gibson, who died the 25th Nov'r 1803, aged 74 years. 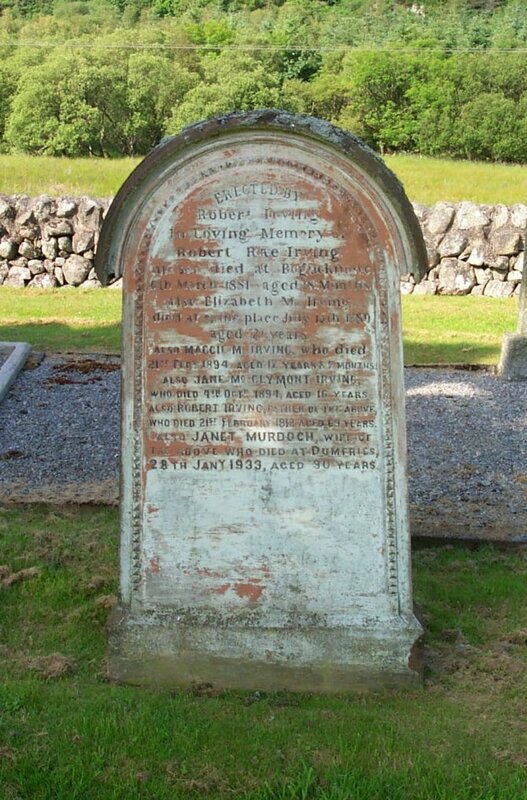 Also John Gibson, their son, who died at Talloquhairn, Kirkbean, June 22nd 1837, aged 81 years. 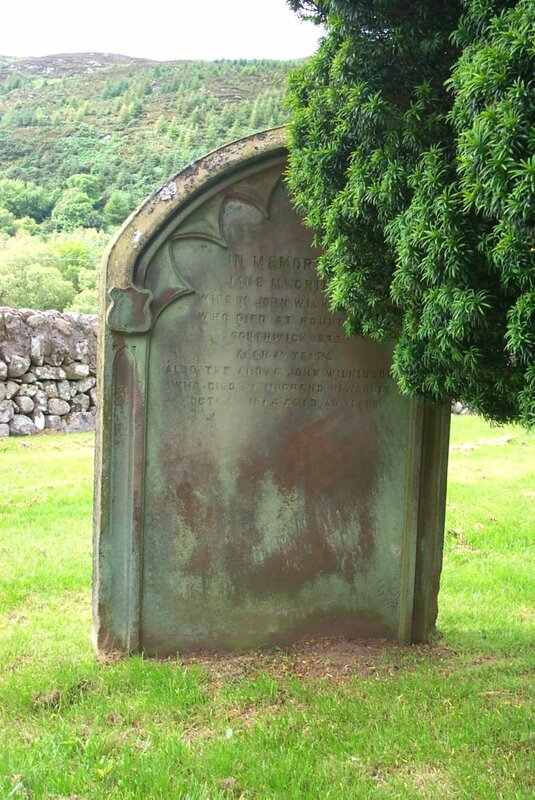 Also Mary Wilson, his spouse, who died at Talloquhairn, 3rd Oct'r 1851, aged 88 years. Departed friends, dry up your tears. Here must me lye till Christ appears. 057 In memory of Margaret Lowden, daughter of the late Thomas Lowden, Esq., Muckle Cloak, who died there on the 23rd January 1845, aged 37 years. 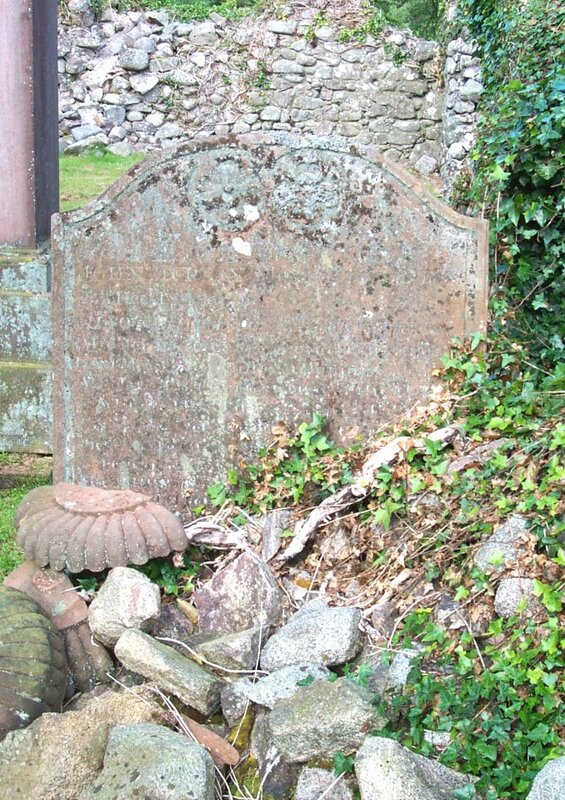 Also at the same place, John McGuffog, who died on the 8th January 1846, aged 41 years. Also at the same place, John Lowden, Esq., who died 6th March 1847, aged 34 years. 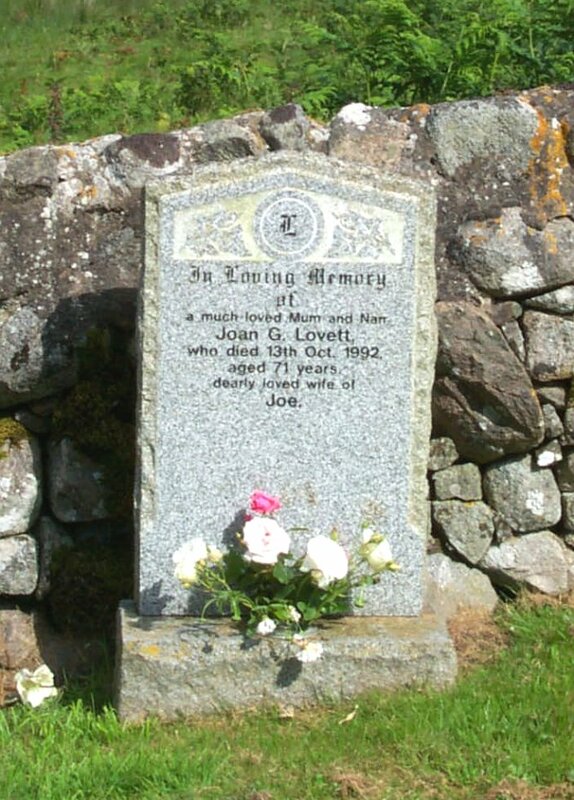 Also John Lowden, son of the above Margaret Lowden, who died at Dalbeattie, aged 8 years. 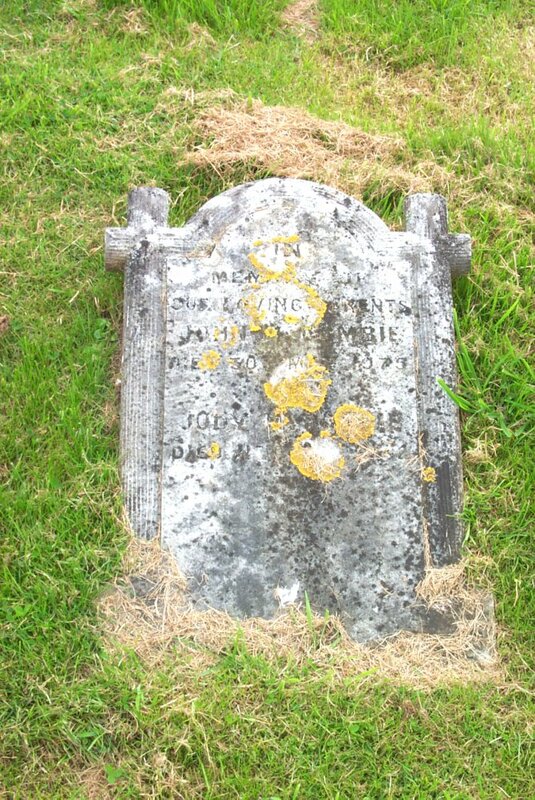 Also Janet Lowden, spouse to John McGuffog, who died 15th April 1889, aged 78 years. 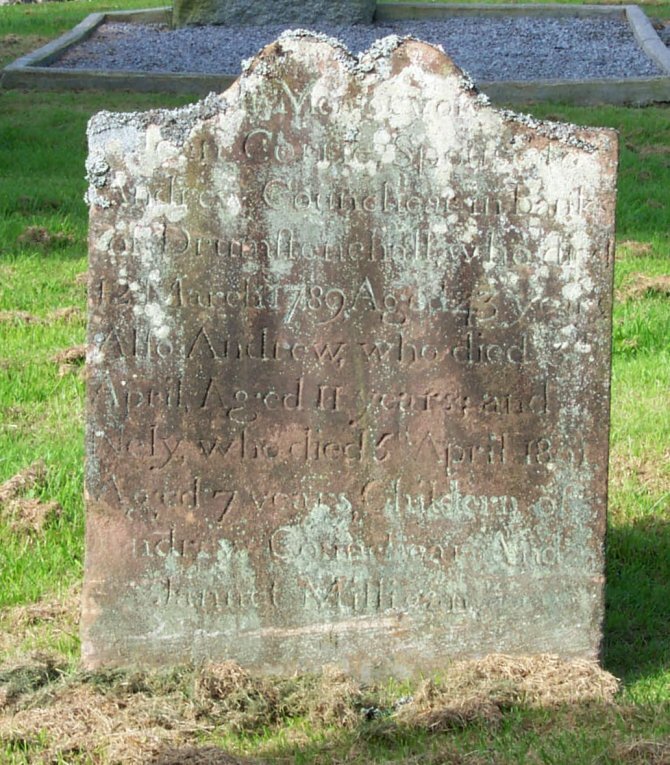 058 Here lyes John Louden in Shilhill, who departed this life January 19th 1738, aged 63. Also Janet Rea, his spouse, who departed this life January 7th 1753, aged 76. 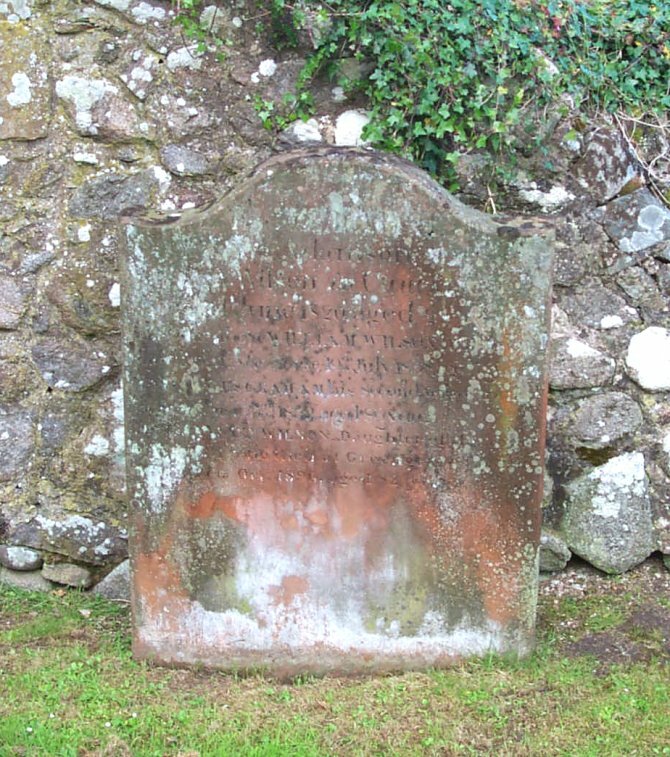 Also John Louden in M. Cloak, son to the deceased John Louden, late in Shelhills, who died July 9th 1778, aged 56 years. 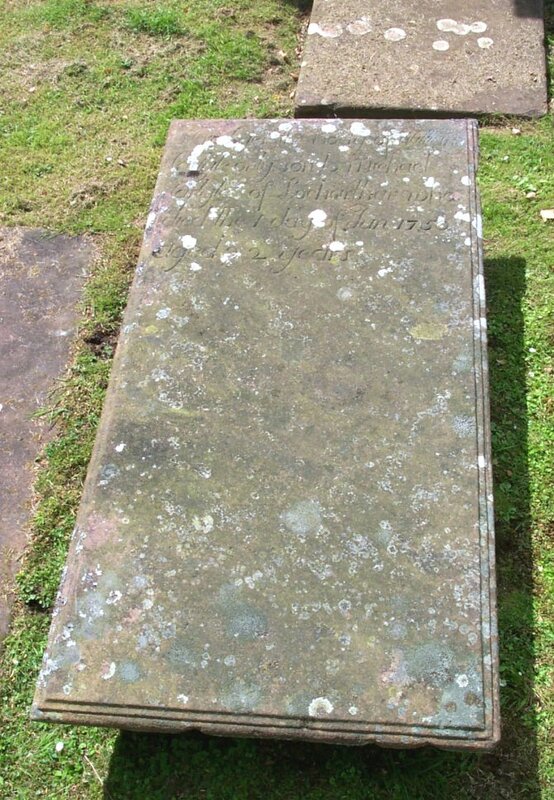 And of Margaret Aitken, his spouse, who died the 20th of Sept'r 1792, aged 68 years. 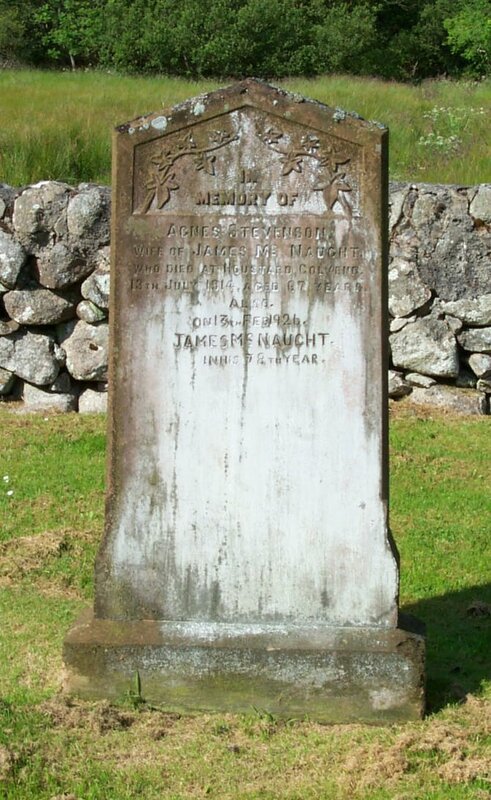 Also their son James, who died at Gibbshouse, 16th April 1821, aged 59 years. 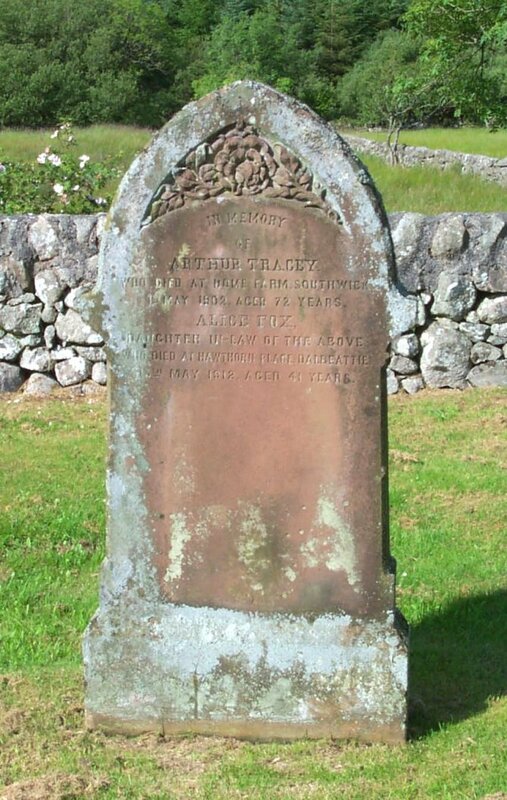 Also Thomas, their son, of Muckle Cloak, who died on the 8th August 1828, aged 56 years. 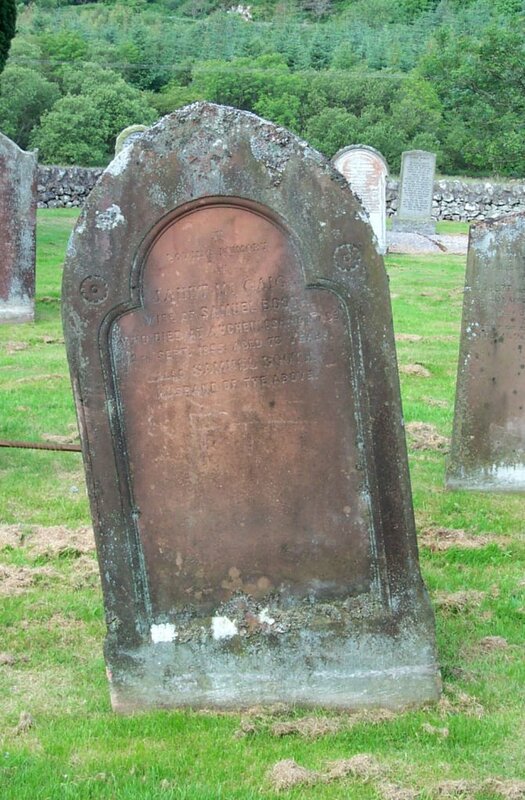 Also Elizabeth Millhench, souse of the late Thomas Lowden of Meikle Cloak, who died 26th April 1857, in her 87th year. 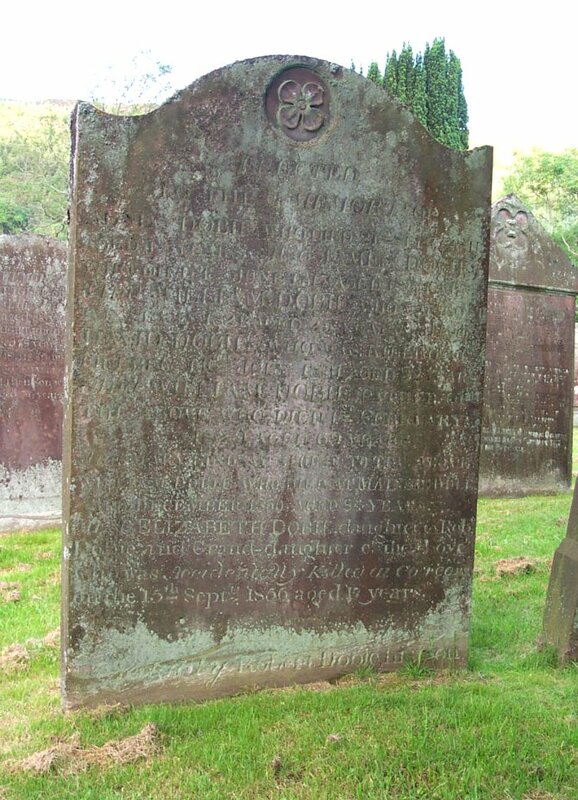 059 Here lyes John Edgar in (illegible), who died July 15th 1737, aged 84 years. And James Edgar, his grandson, who died January 30th 1757, aged 20 years. 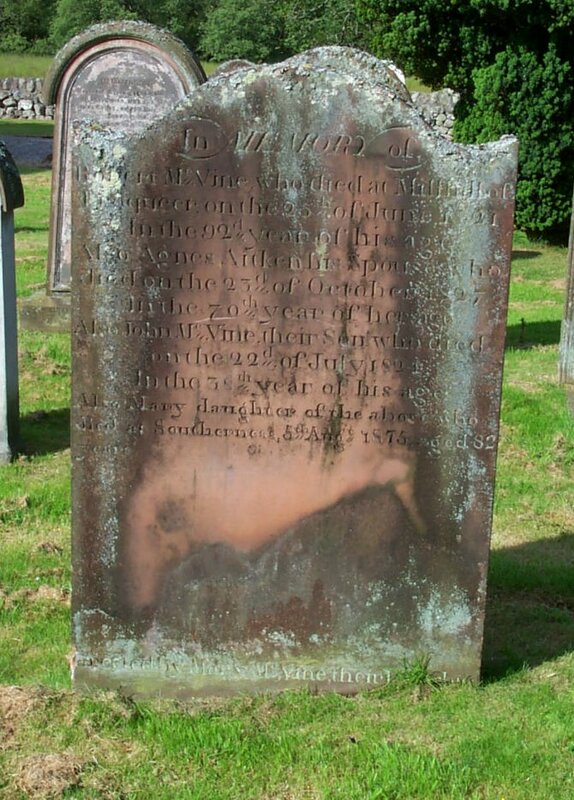 Here lyes the dust of John Edgar, who died in Brekinihill, Feb'y 10th 1770, aged 69 years. 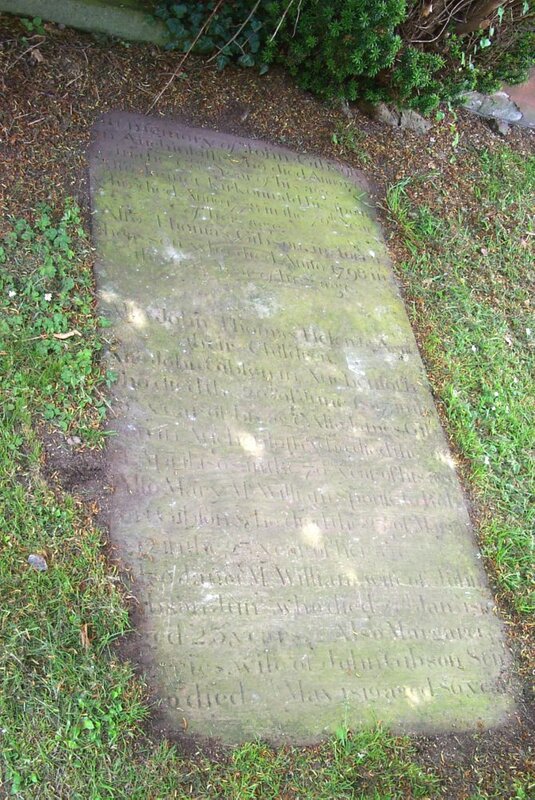 Also John Edgar, his son, who died June 28th 1764, aged 24 years. 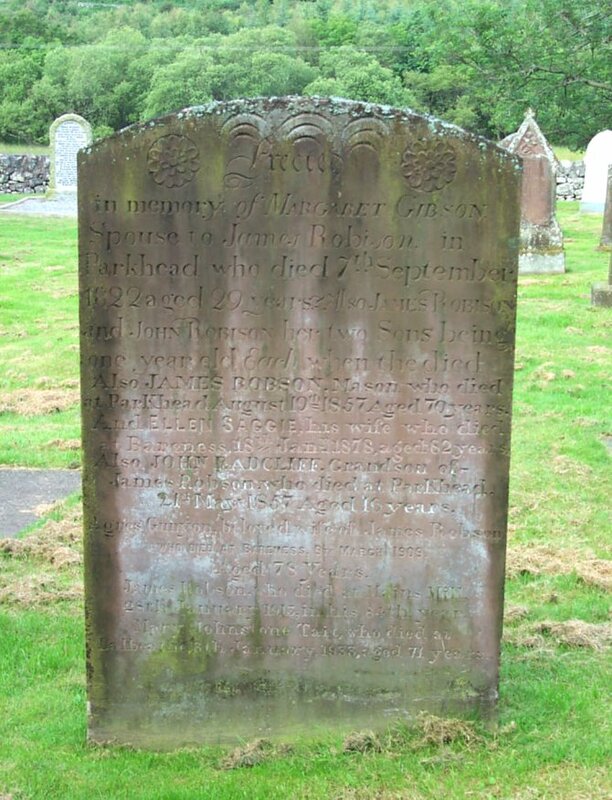 Also Elizabeth Herries, spouse to John Edgar, who died Nov'r the 30th 1779, aged 76 years. 060 In memory of Robert McVine, who died at Millhill of Troqueer, on the 25th of June 1821, in the 92nd year of his age. 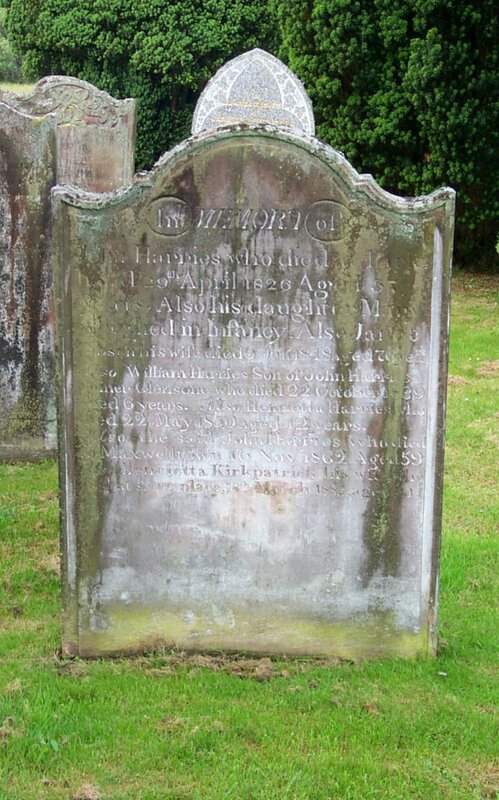 Also Agnes Aitken, his spouse, who died on the 23rd of October 1827, in the 70th year of her age. 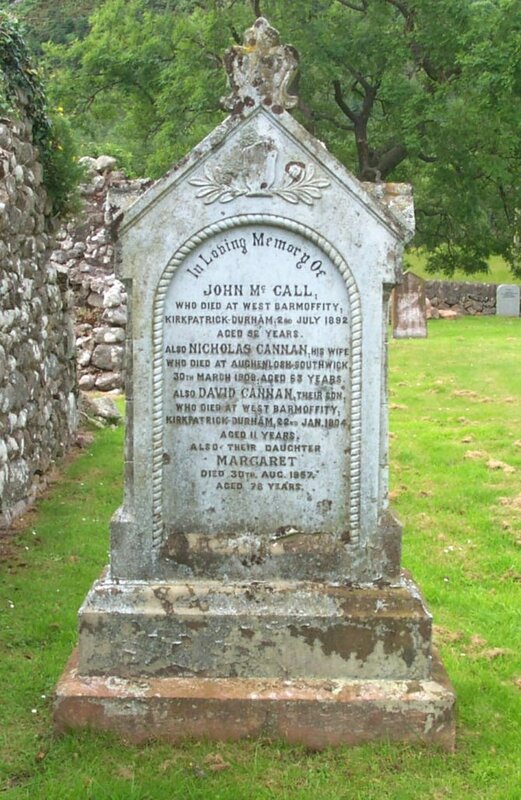 Also John McVine, their son, who died on the 22nd of July, 1824, in the 38th year of his age. Also Mary, daughter of the above who died at Southerness, 5th Aug’t. 1875, aged 82 years. Erected by Mary McVine, their daughter. 061 In memory of James, son of Robert Fergusson who died at Boreland Hill, Southwick 1st January 1879, aged 6 years. 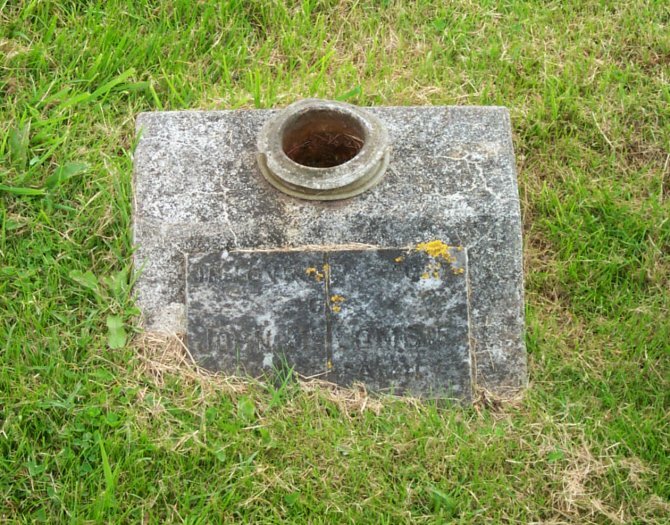 Also William, his son who died 18th Jan. 1901, aged 22 years. 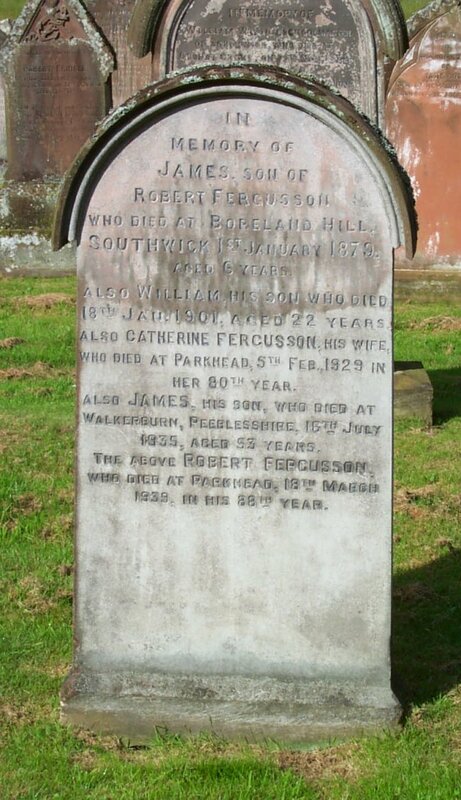 Also Catherine Fergusson, his wife, who died at Parkhead, 5th Feb. 1929 in her 80th year. 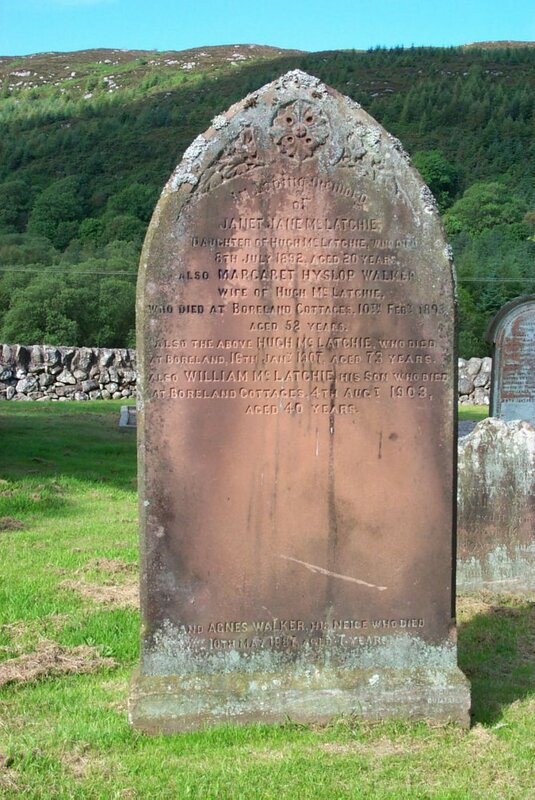 Also James, his son, who died at Walkerburn, Peeblesshire, 16th July 1935, aged 53 years. The above Robert Fergusson, who died at Parkhead, 18th March 1939, in his 88th year. 062 In loving memory of Carson Purcell Dorrington, elder son of John & Patricia Biggar, born at Ballyneety, Ardfinnan, Co. Tipperary, 10th June 1928, died at Corbieton, 23rd March 1935. (Please Jesus take care of Carsh till we come to him, Caird) Patricia Margaret (Bunny), beloved wife of John W. Biggar, passed on 22nd Jan. 1949. John William Biggar, born June 1887, rejoined Bunny July 1966 (Say not good-night, but in some brighter clime, bid me good-morning) These lines from his wife Jenny. Jenny joined them 1977. 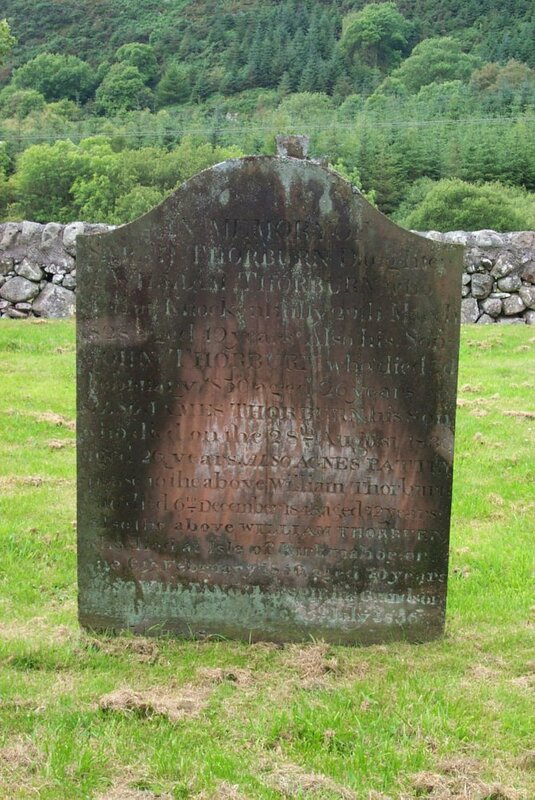 063 Here lyes John Carson in Laggan, who departed this life February 16th 1734 aged 72. Also Jean Loudon, his spouse, who departed this life March 12th 1736, aged 55 years. 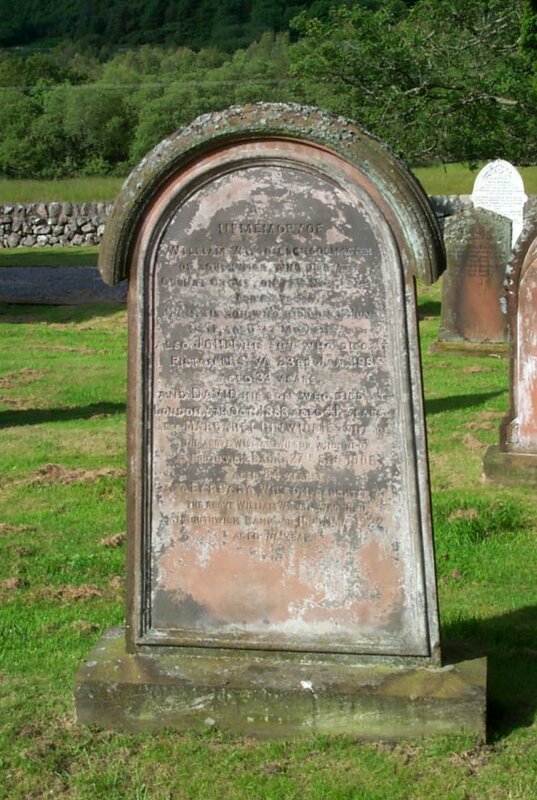 Also John Carson their son, who died in Laggan, 4th August 1797, aged 75 years. 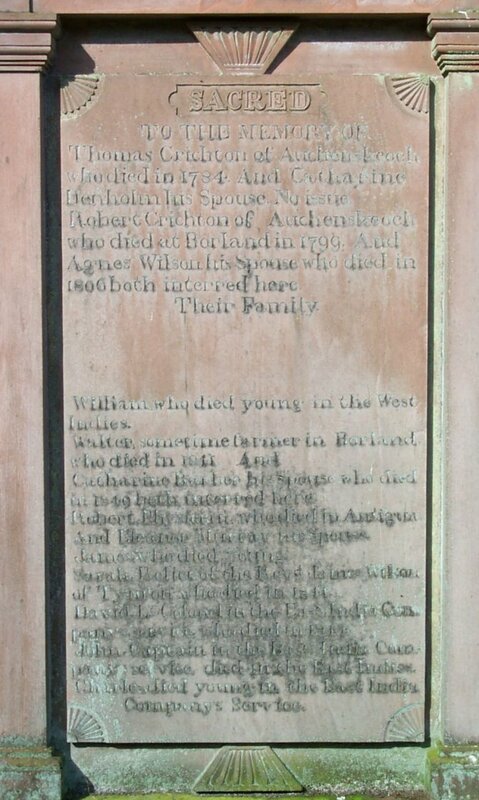 Also Elizabeth Cochrane his spouse, who died on the 6th May 1806 aged 78. 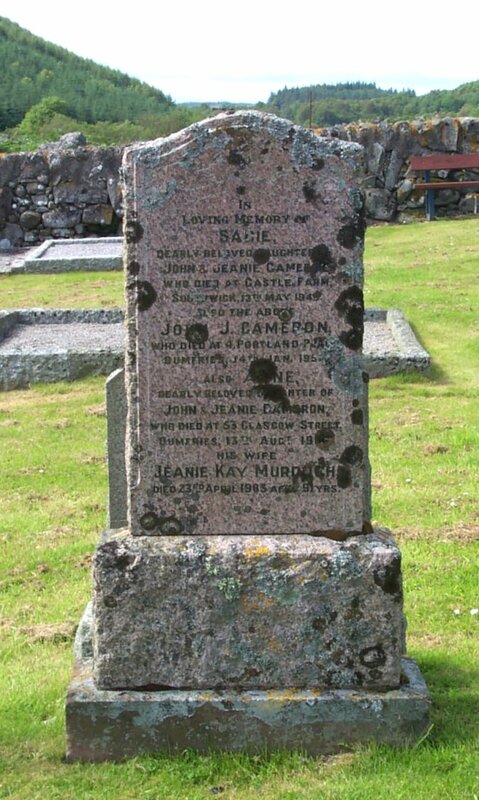 Also Samuel Carson their son, who died at Laggan on the 8th Sept’r 1846 aged 80. Also Margaret Carson his daughter who died on the 5th March 1850 aged 35. 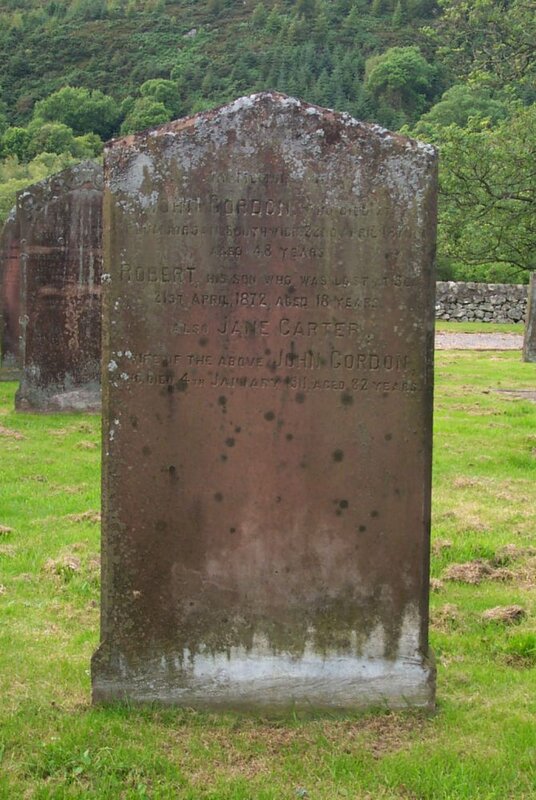 Also Jane Caird wife of the above Samuel Carson who died 8th Oct’r 1861 aged 84 years. Maria Scott Wilson, grand-daughter of John Carson of Ballyneety, born 1887, died at Douglas Hall, June 1972. 064 In memory of James Carson who died at Laggan, on the 29th of April 1875, aged 70 years. 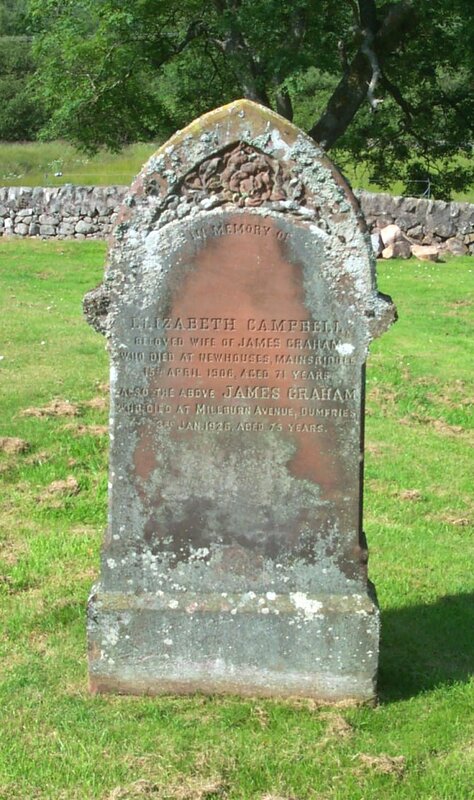 Also of Elizabeth Carson, who died at Laggan, on the 26th of May 1875, aged 75 years. 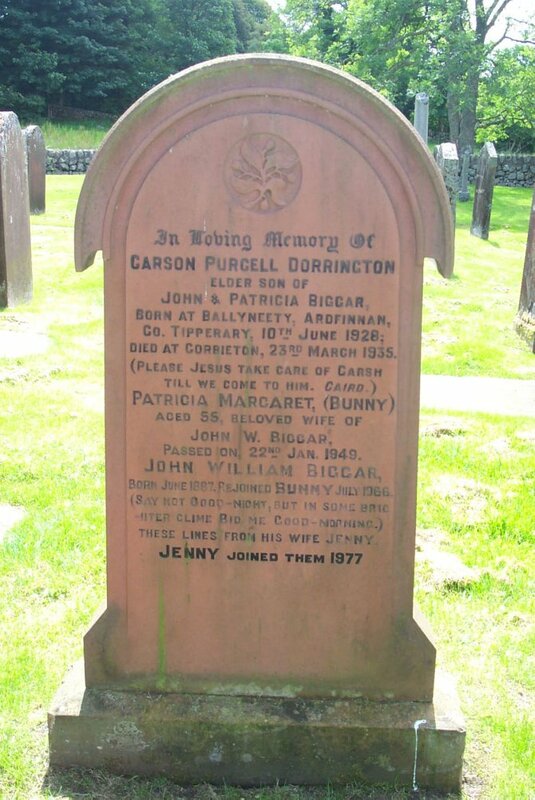 Also of John Carson, who died at Lower Bally Neety, Ireland, on the 7th of May 1878, aged 75 years. Also of Mary Carson, who died at Rockcliffe on the 27th of December 1884, in the 84th year of her age. 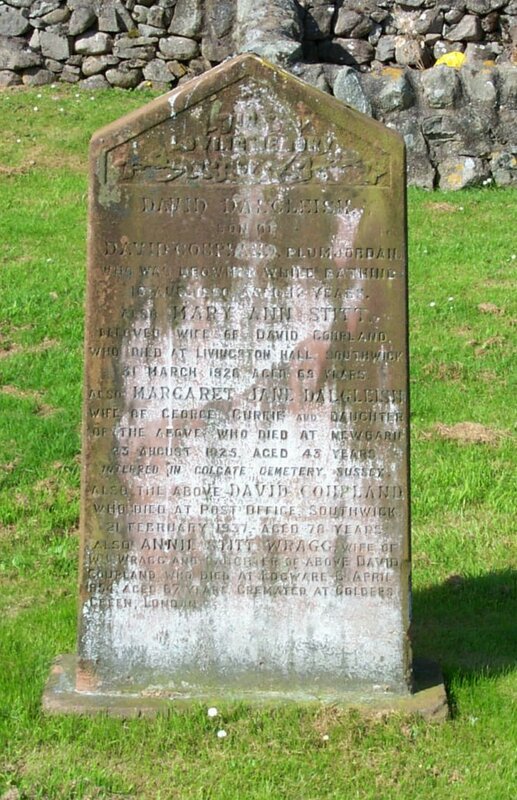 Also of Jane Carson, of Laggan, who died at Rockcliffe, on the 28th of June 1891 in her 84th year. Erected by the above John Carson. 065 In memory of John Carson who died at Caulkerbush on the 15th of June 1821 aged 70 years. 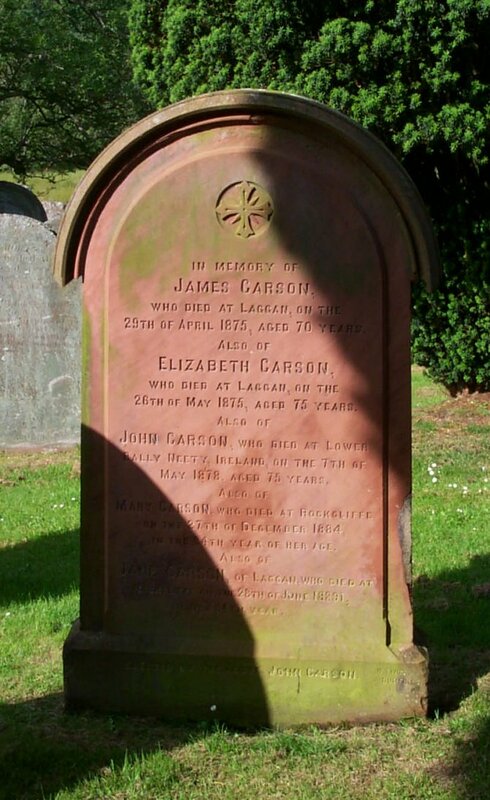 Also Jane Carson who died at Caulkerbush on the 16th of Nov. 1841 aged 86 years. 066 In memory of Samuel Mitchell, who died at Rosebank, on the 27th April 1856, aged 84 years. Elizabeth Robson, his wife, who died at Rosebank, on the 27th May 1854 aged 85 years. And their children. The Rev. James Mitchell, who died in England, on the 30th March 1847, aged 35 years. John Mitchell, who died in England, on the 3d Feb. 1850 aged 44 years. 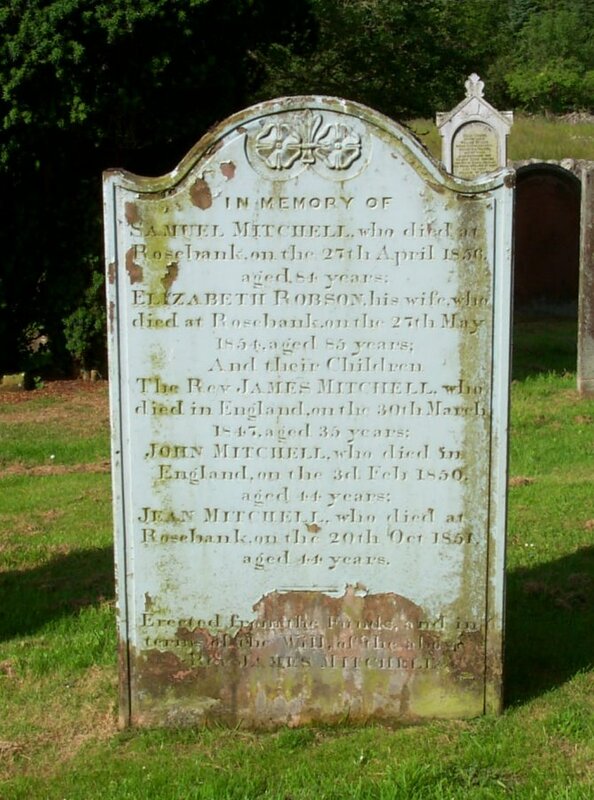 Jean Mitchell who died at Rosebank, on the 20th Oct. 1851 aged 44 years. Erected from the funds, and in terms of the will of the above Rev. James Mitchell. (Reverse) In memory of Thomas Good, who died at Rosebank 13th February 1873 aged 53 years. Also Elizabeth Robson, his daughter who died there 11th Oct’r. 1852 aged 2 years. Also Ann Charters, wife of Thomas Good, who died at Rosebank 27th May 1915 aged 94. 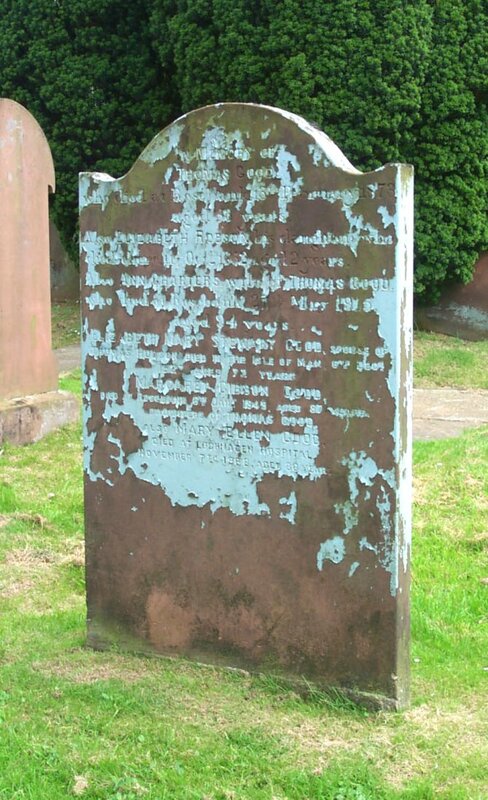 Elizabeth Mary Stewart Good, spouse of Thomas Hudson, died in the Isle of Man 6th Dec’r. 1927 aged 72 years. Margaret Gibson Good died at Rosebank 6th Jan’y 1949, aged 87 years, daughters of Thomas Good. 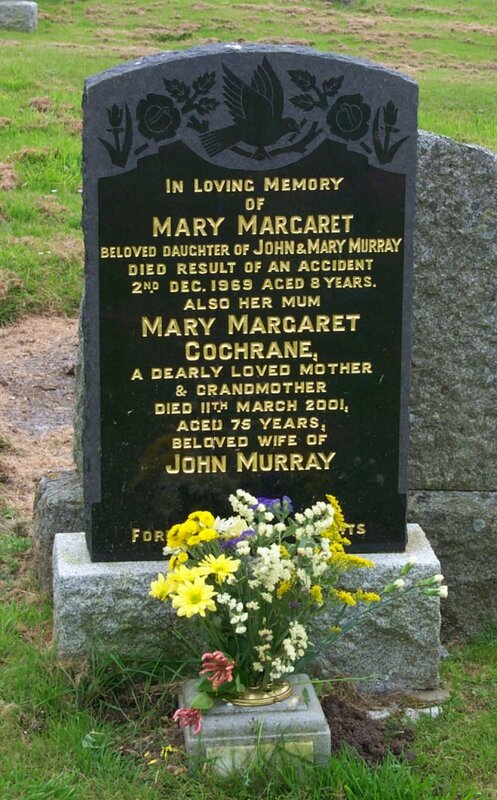 Also Mary Ellen Good, died at Lochmaben Hospital, November 7th 1968, aged 86 years. 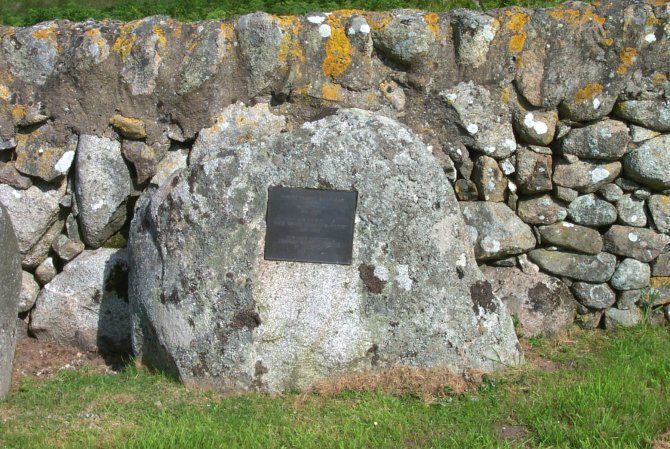 068 Erected by John Mitchell of Corbelly. 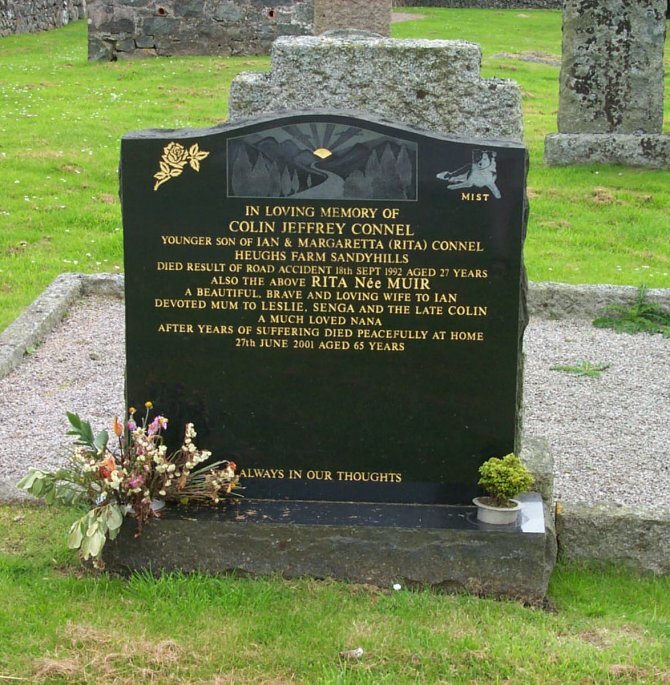 In memory of John Turner of Corbelly, who died at Ryes, 1st Dec’r 1786, aged 88 years. Also William Mitchell, son of James Mitchel,l who died at Ryes, 29th Jan’y 1812, aged 27. And Janet King, spouse to Jas. Mitchell, who died at Ryes, 16th March 1818, aged 69. 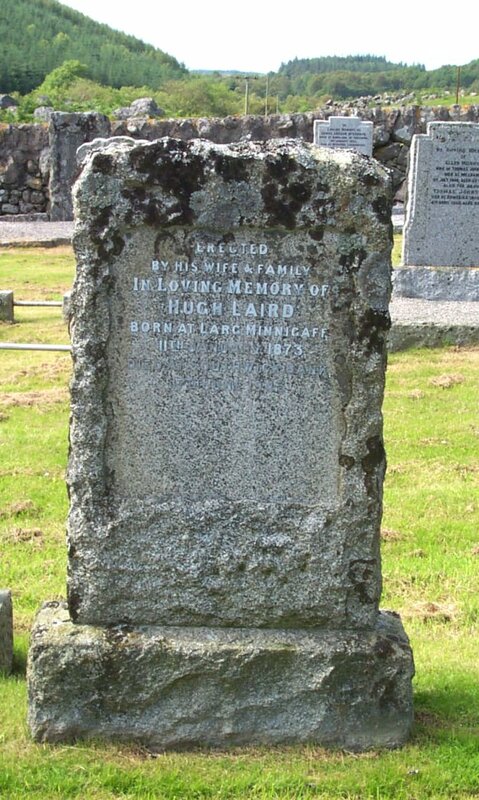 Also James Mitchell of Corbelly, who died at Ryes, 5th Nov’r. 1818, aged 75 years. 069 In memory of Winnifred Maxwell Payne, who died at Woodside, Southwick, 26th Jan’y 1878, aged 84 years. Also Margaret Murray, who died 14th Nov’r 1893, aged 74 years. 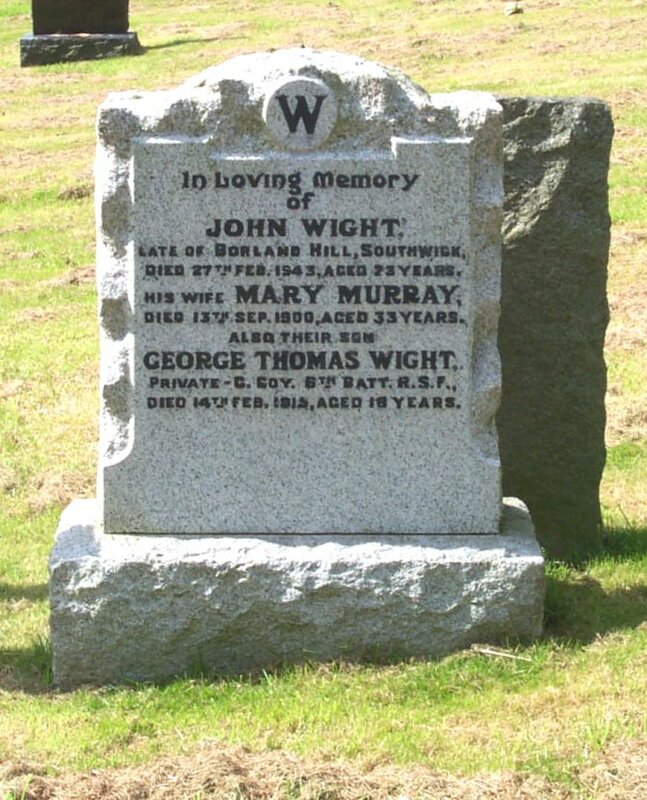 Also John Murray, who died 7th Feb’y 1894, aged 72 years. 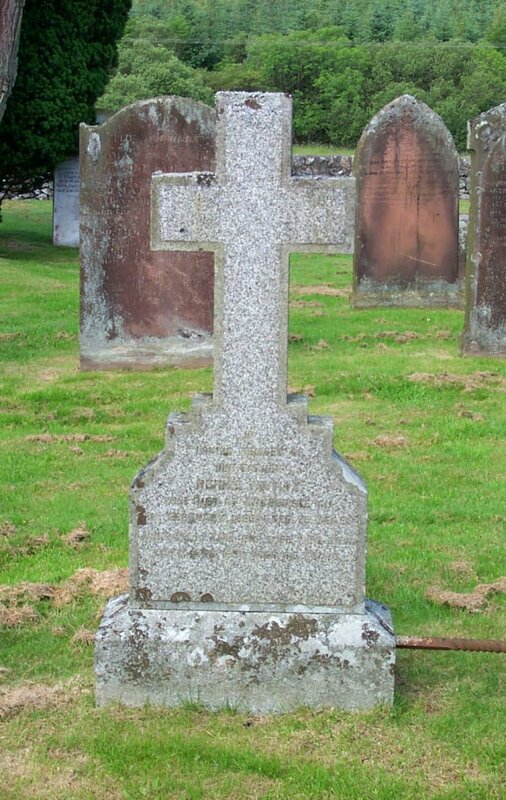 070 In memory of William Wilson, schoolmaster of Southwick, who died at Cushat Grove, on 22nd Nov. 1872, aged 63 years. John his son, who died on 3rd June 1851, aged 22 months. Also John, his son, who died at Picton, N.S.W., 23rd Jan’y 1885, aged 33 years. And David, his son, who died at London, 5th Oct. 1888, aged 41 years. Also Margaret Dinwiddie, wife of the above William Wilson, who died at Southwick Bank, 27th Sept. 1906, aged 84 years. Also Barbara Wilson, daughter of the above William Wilson, who died at Southwick Bank on 10th Nov’r. 1922, aged 77 years. 071 In loving memory of George Edward McKerrow, born at Borelend of Southwick, 9th January 1882, died at Addinston, Lauder, 8th April 1940. Also Margaret Carlton Robb, his devoted wife, who died at Addiston, 23rd Aug. 1907, aged 82 years. 072 M.McK. 1866. E.I. McK 1873 - 1875. 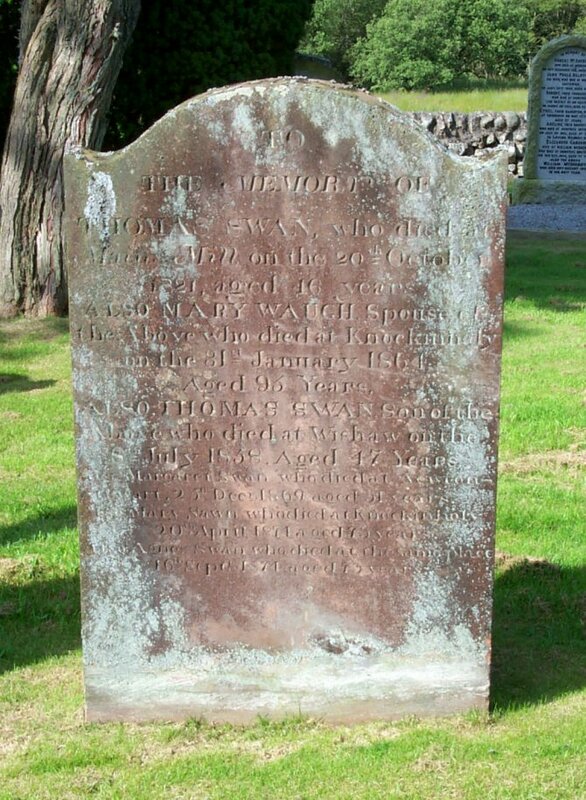 074 To the memory of Thomas Swan, who died at Mains Mill on the 20th October 1821, aged 46 years. Also Mary Waugh, spouse of the above, who died at Knockinholy on the 31th January 1864, aged 95 years. 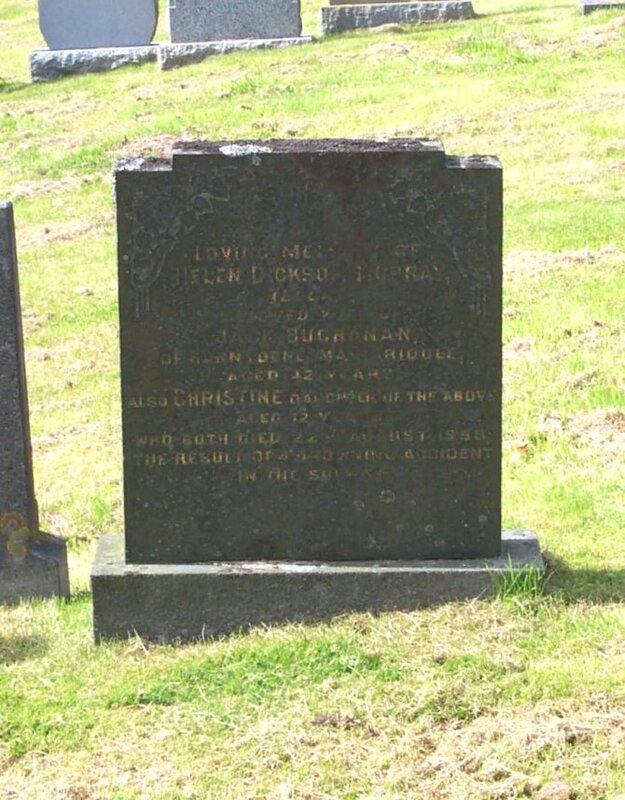 Also Thomas Swan, son of the above, who died at Wishaw on the 8th July 1858, aged 47 years. 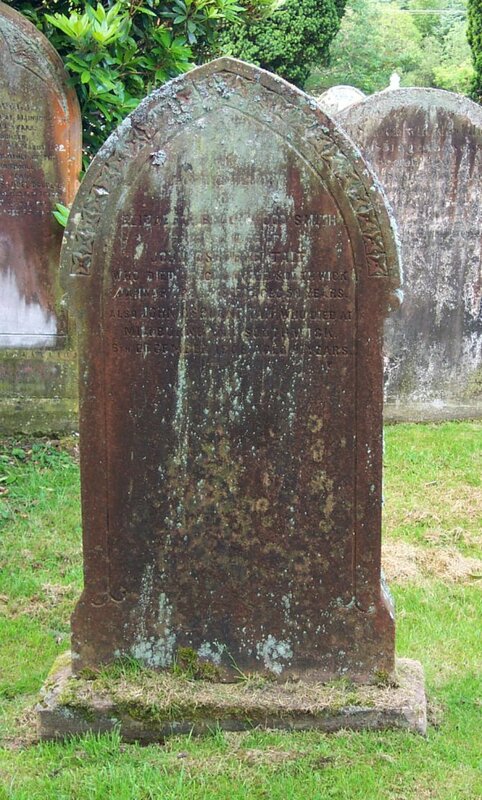 Also Margaret Swan, who died at Newton-Stewart, 25th Dec'r 1869, aged 51 years. Also Mary Swan, who died at Knockinholy, 20th April 1874, aged 73 years. Also Agnes Swan, who died at the same place, 16th Sept’r 1874, aged 73 years. 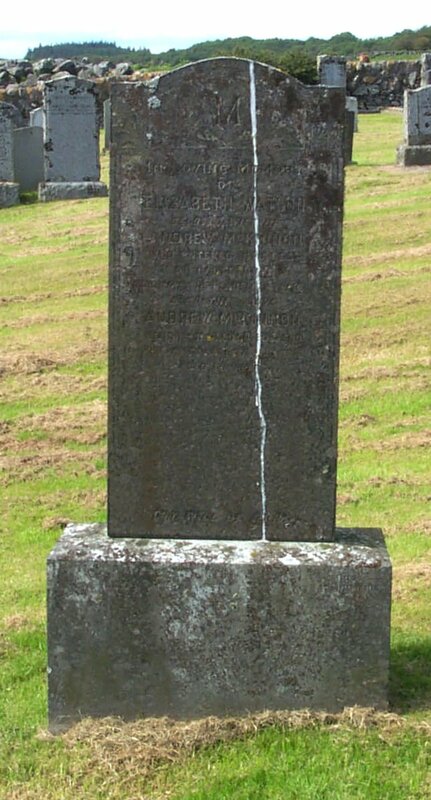 075 Erected to the memory of Mary Smith, spouse of William Baird, who died the 10th of May 1801, aged 53 years. 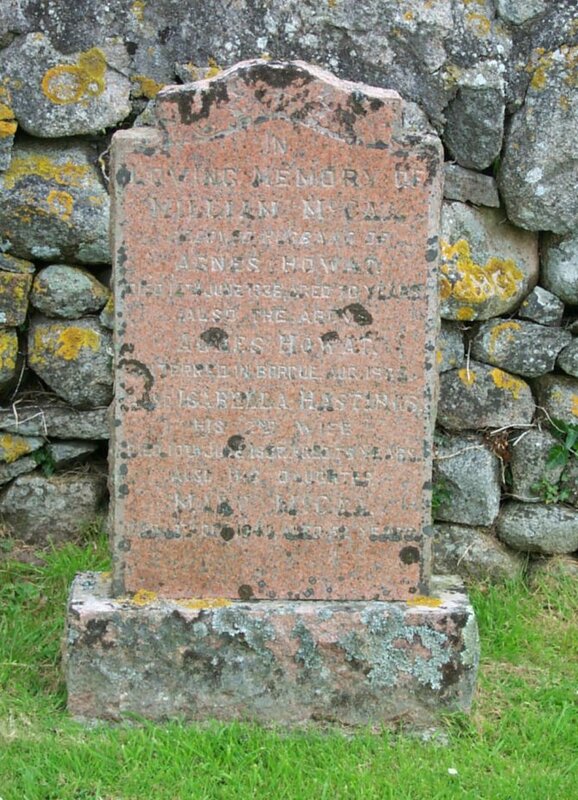 And the said William Baird, farmer in Shawfoot, who died the 26th of July 1803, aged 55 years. Also of Hannah Baird, their daughter, who died 30th December 1852, aged 76 years. Also Adam Baird, who died at Knockinholy, 14th March 1864, aged 80 years. 076 Sacred to the memory of Mary, wife of Mr. John Mackay, Shawfoot, Southwick, and daughter of the late Mr John Embleton, Long Newton, Darlington, who was suddenly called from a life of active usefulness, Jan. 18th 1875, aged 63 years. 077 In loving memory of William Smith, died Sept. 5th 1916, aged 59 years. Also Mary Scambler, died Oct. 7th 1938, aged 83 years. 078 In sweetest memory of Catherine Smith, beloved wife of Henry Windress, died 12th January 1950, in her 73rd year. 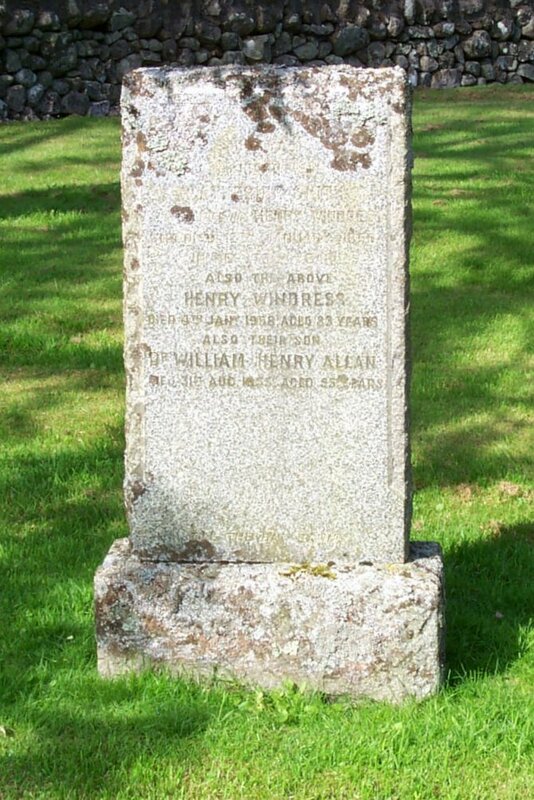 Also the above Henry Windress, died 4th jan'y 1958, aged 83 years. Also their son Dr. William Henry Allan, died 31st Aug. 1955, aged 55 years. 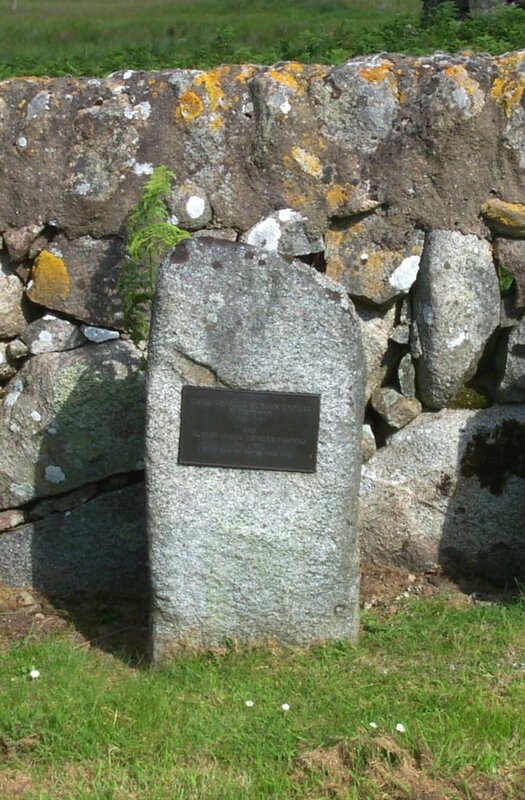 079 Erected to the memory of William Redmond, who died at Jocklig, the 26th of Nov’r 1829, aged 68 years. Also Agnes Henry, his widow, who died in Bogue-foot, 27th Feb’y. 1860, aged 83 years. 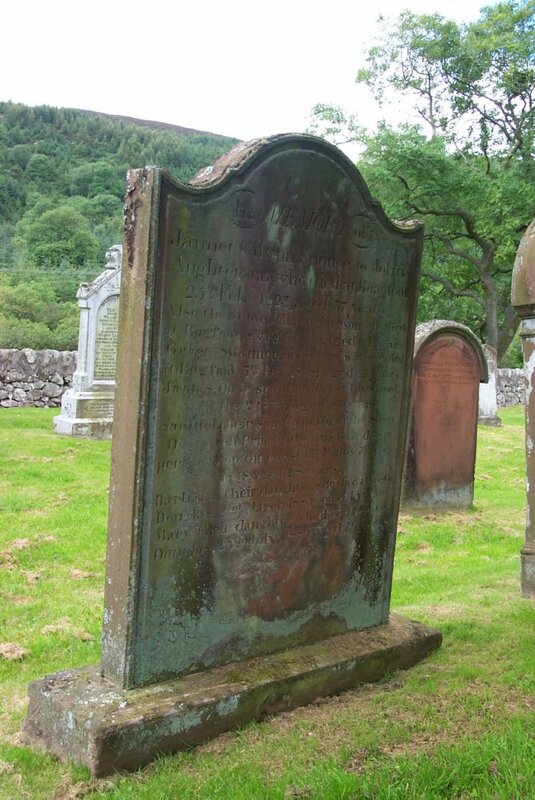 080 In loving memory of Janet Jane McLatchie, daughter of Hugh McLatchie, who died 8th July 1892, aged 20 years. 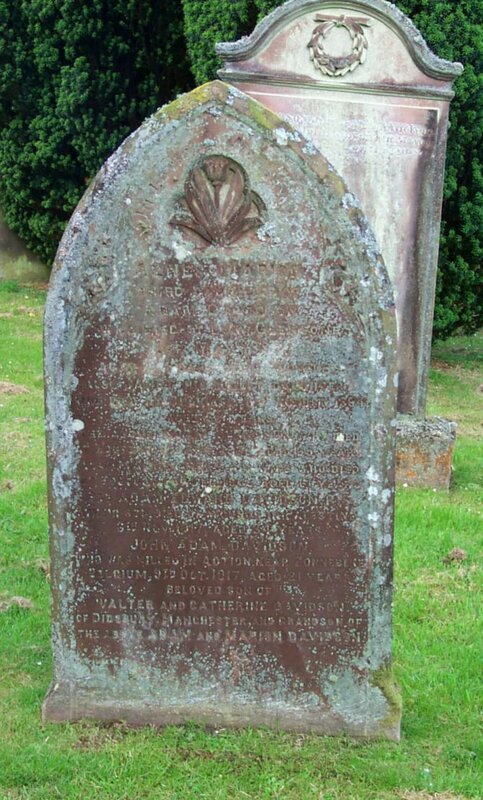 Also Margaret Hyslop Walker, wife of Hugh McLatchie, who died at Boreland Cottages, 10th Feb’y. 1893, aged 52 years. Also the above Hugh McLatchie, who died at Boreland, 16th Jan’y. 1907, aged 73 years. Also William McLatchie his son, who died at Boreland Cottages, 4th Aug’t 1903, aged 40 years. And Agnes Walker, his niece, who died 10th May 1887, aged 7 years. 081 In memory of Jean Corrie, spouse to Andrew Counchear in Banks of Drumstenchall, who died 12th March 1789, aged 43 years. 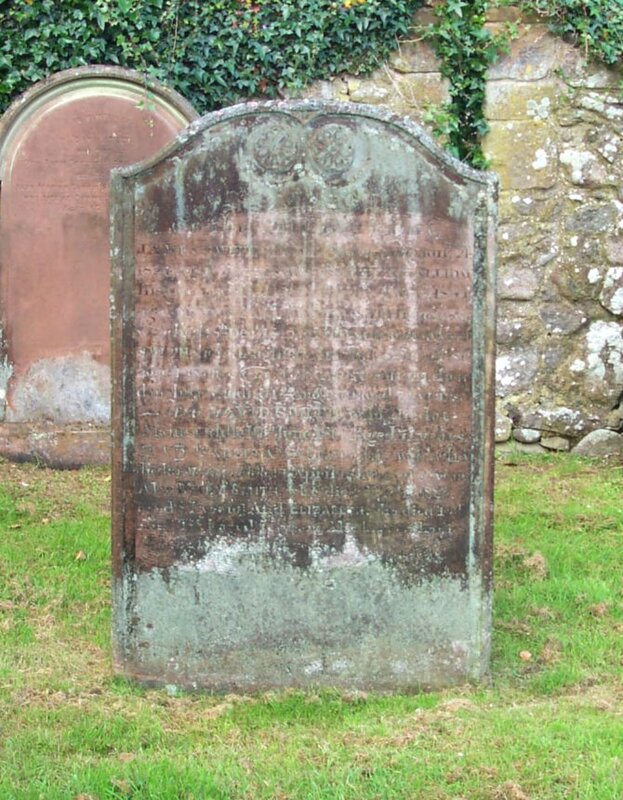 Also Andrew, who died 3rd April, aged 11 years and Nelly, who died 5th April 1801, aged 7 years, children of Andrew Counchear and Janet Milligan. 081b Hic jacet Ioanes Lindsay de main qua obiit 26 die Feberuarii 1666 aetatis suae 42. Ac etiam Isobella McLellan ejus conjunx quae obit 26 die Jannuarii 1693 aetitia suae 78. 082 Flora Kemp, wife of Donald Cameron, who died at Dumfries, August 1864,aged 52 years. Also Donald Cameron, who died 4th October 1885, aged 70 years. And Flora Kemp, their niece, who died 19 Feb’y. 1859, aged 23 years. 083 Sacred to the memory of Robert Pringle, Foreman, Glensone, Southwick, who died at Glensone, 21st May 1880, aged 37 years. Well done, good and faithful servant, thou hast been faithful over a few things, I will make thee ruler of many things: enter thou into the joy of thy Lord. This stone is erected by Wm. Gourlie Blackie, of Glensone, in grateful remembrance of a faithful servant. 084 Erected in loving memory of Jane Cook, wife of John Scott, died at New Farm Cottages, March 8th 1898, aged 48 years. 085 In memory of James Young, who died at Powbraid, March 11th 1831, aged 81 years. 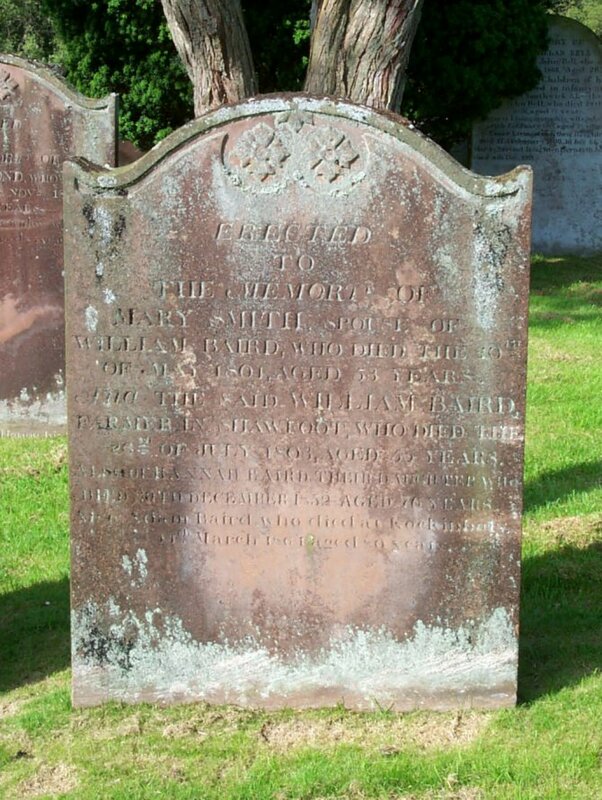 Also Janet Smith, spouse to the above, who died at Kirkland, Colvend, 9th day of June 1837 aged 86 years. Also Louisa Thom, born 20th April 1837, died 11th April 1855. Also James & Ann, who died in infancy. 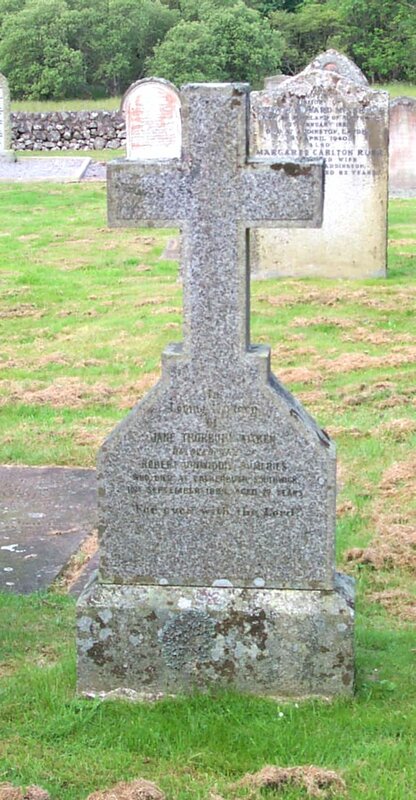 And William Thom, their father, died at Pyle, 4th Feb’y. 1868, in the 67th year of his age. Also Janet Smith, wife of William Thom, who died at Kirkland, 1st January 1888, aged 87 years. 086 Erected by Agnes Cook in memory of her husband, James Cook, who died at New Farm Cottages on the 30th November 1882, aged 67 years. Also the above Agnes Cook, who died at Tarlillian on the 23rd May 1891, aged 71 years. Also their daughter Janet, who died in infancy. 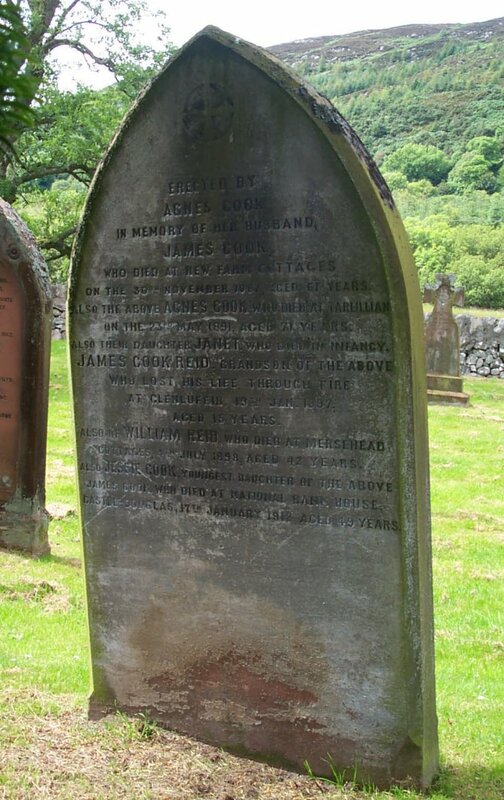 James Cook Reid, grandson of the above, who lost his life though fire at Glenluffin, 19th Jan. 1897, aged 15 years. 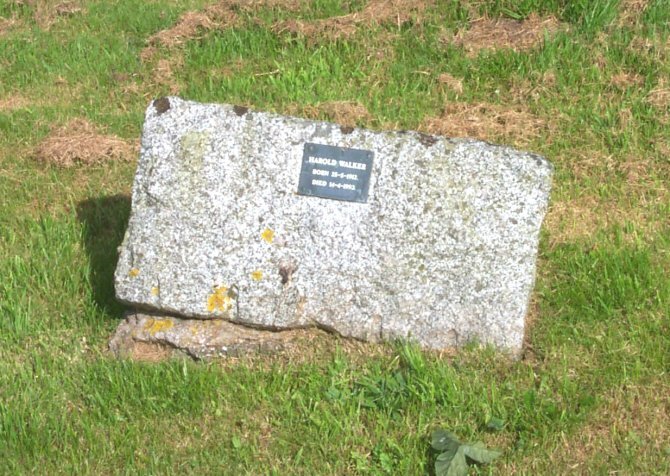 Also of William Reid, who died at Mersehead Cottages, 4th July 1898, aged 42 years. Also Jessie Cook, youngest daughter of the above James Cook, who died at National Bank House, Castle-Douglas, 17th January 1912, aged 49 years. 087 In memory of John Smith, in Moat, who died in the year 1790, aged 71 years. Also Christiana Wilson, his spouse, who died in the year 1801,aged 80 years. 088 Sacred to the memory of James Watson, who departed this life at Kells of Southwick, on the 21st of October 1847, aged 69 years. 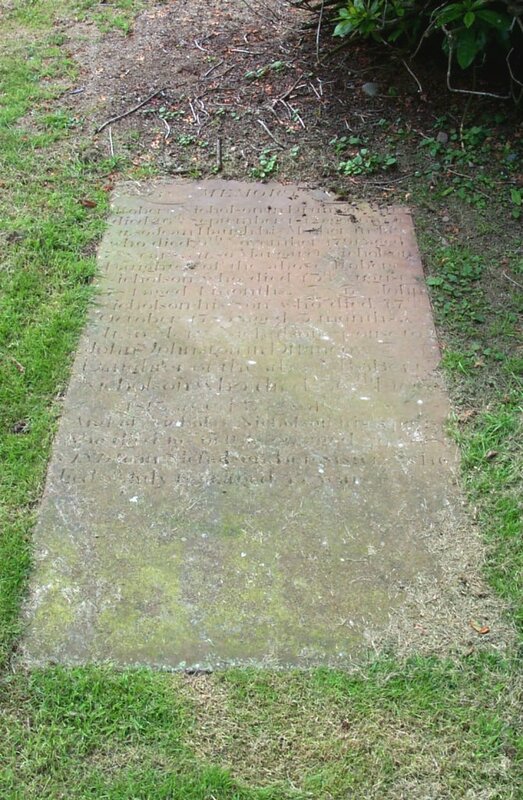 Also Janet Hannah, his spouse, died at Brough of Southwick, on the 15th of April 1855, aged 73 years. 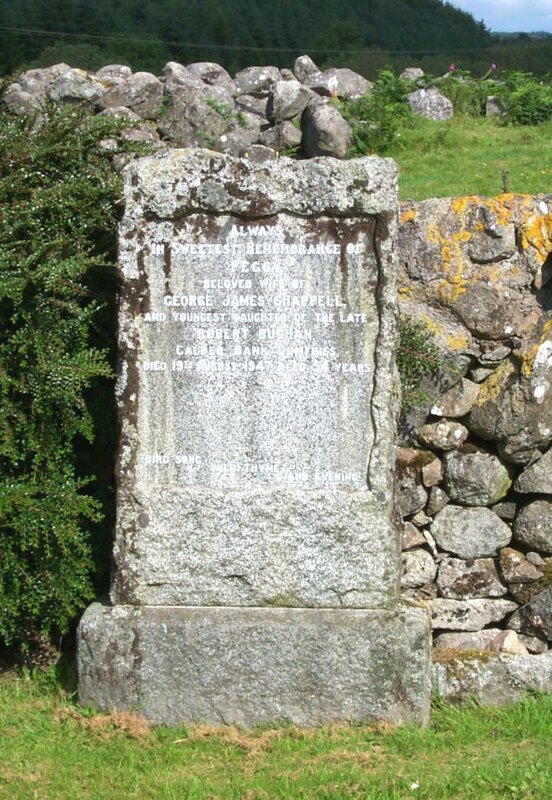 089 Erected to the memory of Joseph Boyd, who died at Auchenhay, Colvend, 10th Nov. 1875, aged 73 years. Also Jane Riddick, his spouse, who died at the same place, 11th Nov. 1870, aged 75 years. 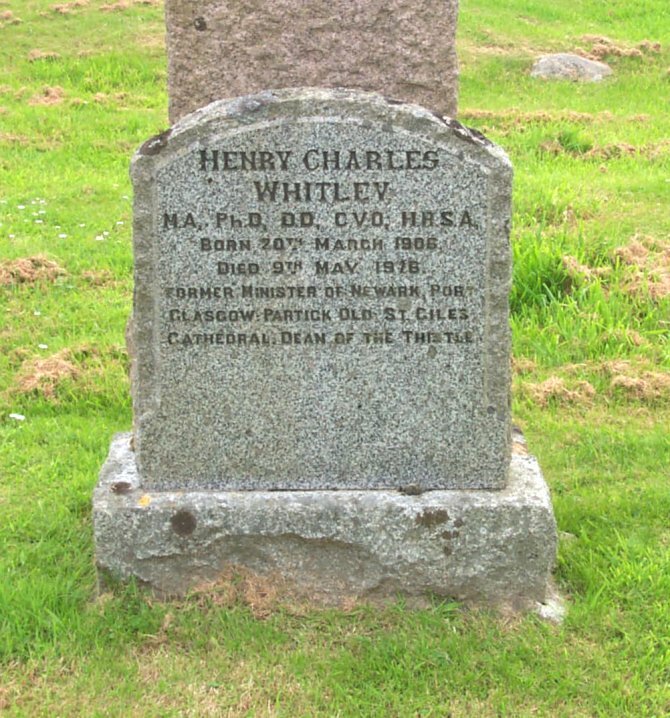 Also Charles, their son, who died at Glensone, 2nd May 1863, aged 42 years. Also Mary, their daughter, who died in infancy. Also Susan Elston, widow of the above Charles Boyd, who died 14th Nov. 1895. Also Joseph, son of the above, who died 20th June 1923. Also Jane, daughter of the above, who died 23rd Dec. 1879. 090 In loving memory of Elizabeth Seggie, who died 16th July 1890, aged 71 years. 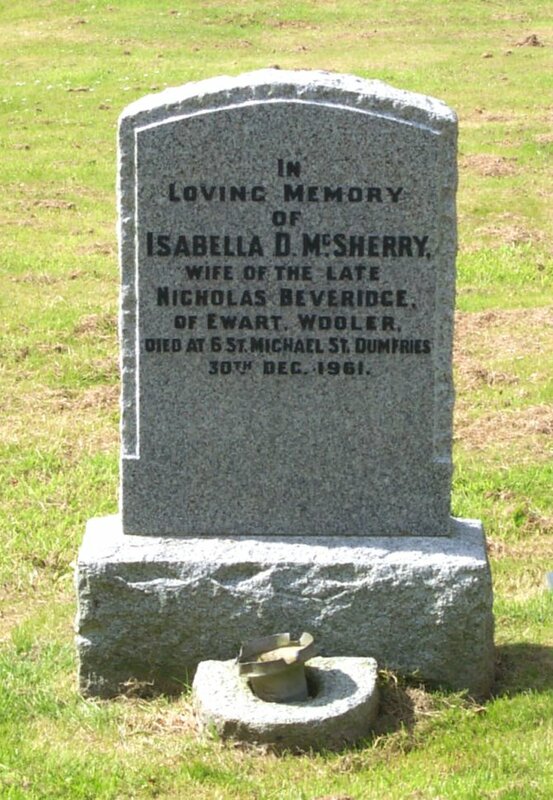 Mary Stevenson, wife of Hugh Seggie, died 25th September 1897, aged 43 years. Annie, his daughter, who died at Irving, 23rd February 1907, aged 22 years. 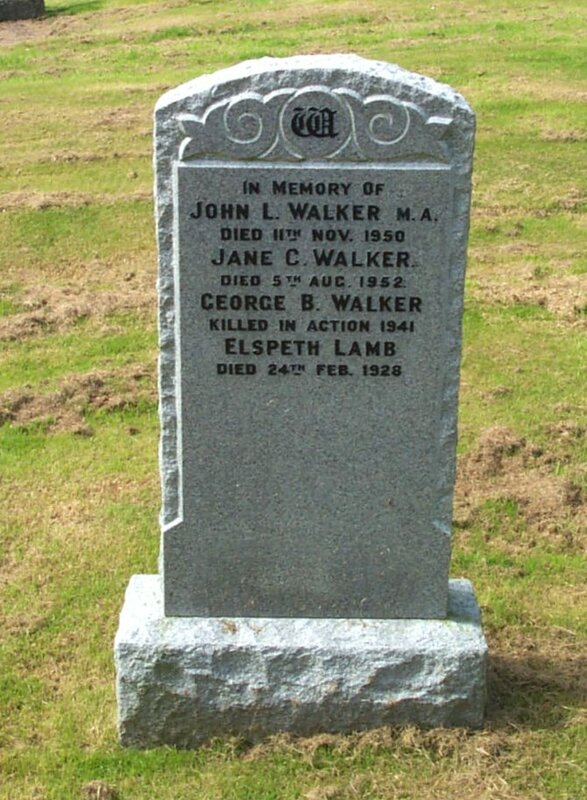 John, his son died at Coatbridge, 6th May 1910, aged 31 years. Helen Cairns, his wife died at Bogknowe, 4th September, 1913, aged 43 years. James Seggie, (killed in action in France), 7th September 1916, aged 23 years. Hugh Seggie, (killed in action at the Battle of the Somme, in France), 14th October 1916, aged 21 years. 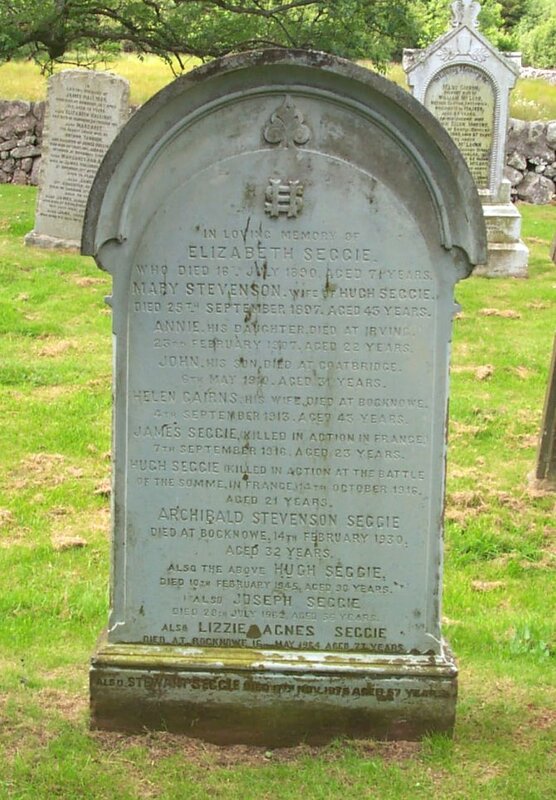 Archibald Stevenson Seggie, died at Bogknowe, 14th Febraury 1930, aged 32 years. Also the above Hugh Seggie, died 10th February 1945, aged 90 years. Also Joseph Seggie, died 28th July 1962, aged 56 years. 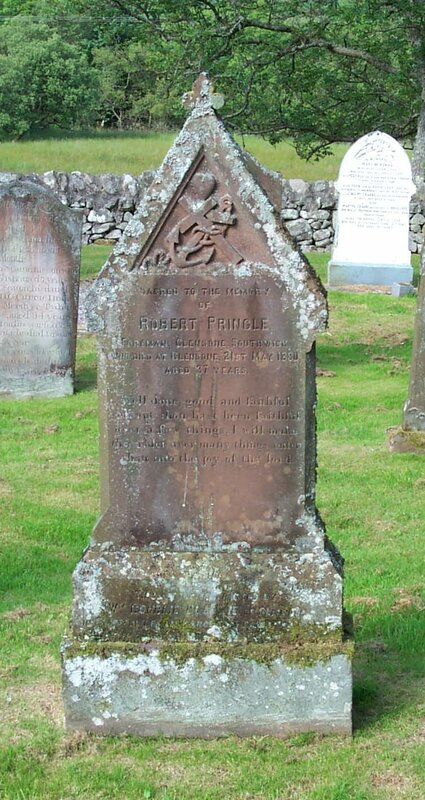 Also Lizzie Agnes Seggie, died at Bogknowe 16th May 1964, aged 73 years. Also Stewart Seggie, died 17th Nov.1976, aged 67 years. 091 In memory of Jannet Gibson, spouse to John Aughterson, who died at Boagfoot, 25th Feb’y 1823, aged 37 years. Also the above John Aughterson, who died at Bogfoot, 8th Feb’y 1845, aged 64 years. Grace Shannon, his second wife, who died at Bogfoot, 3rd Feb’y 1848, aged 55 years. 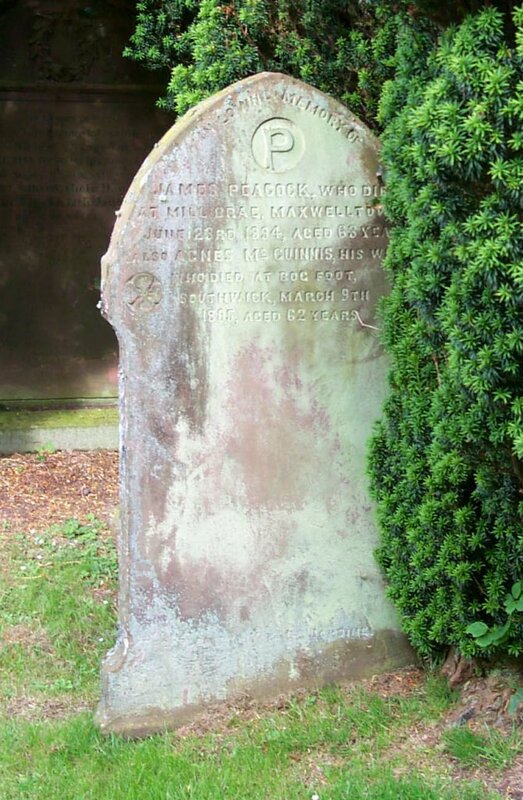 James, their son, who died at Liverpool, 7th Oct’r 1835, aged 28 years. Samuel, their son, Captain of the ship Dispatch, Prince Edwards Island, who perished on the coast of Wales, 7th Dec. 1848, aged 28 years. 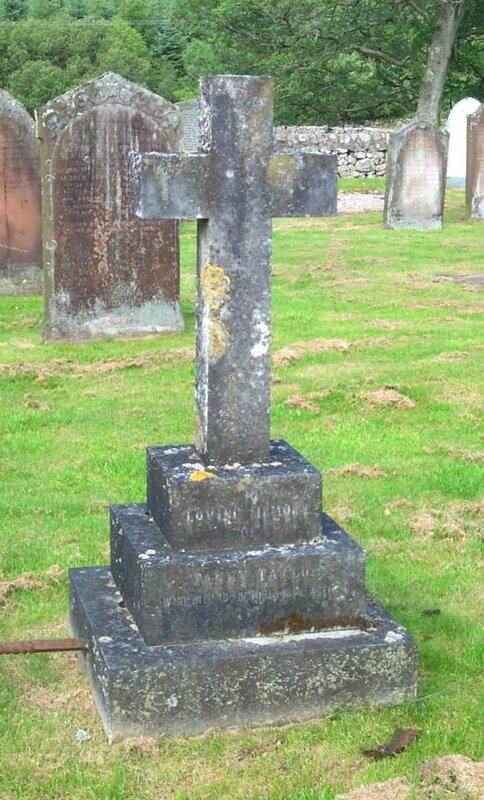 Barbara, their daughter, who died at Castle Douglas, 2nd March 1885, aged 45 years. 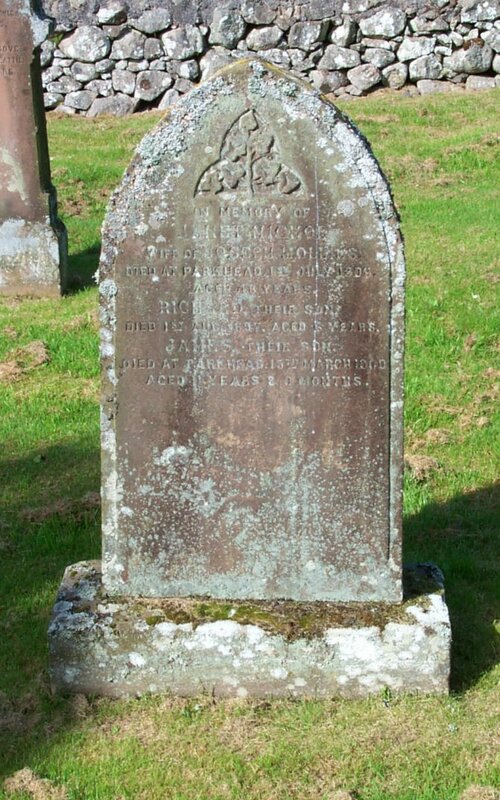 Mary, their daughter, who died at Castle Douglas, 25th July 1885, aged 79 years. 092 In memory of Elizabeth Dalziell, who died at Bogfoot, Southwick, 20th April 1898, aged 78 years. Also her son William Stevenson, who died at Dumfries, 16th April 1916, aged 60 years. 093 In memory of Jane McMillan Bell, daughter of John Bell, who died 2d Aug’t 1866, aged 20. Also twin children of his who died in infancy at Livingston Hall, Southwick. 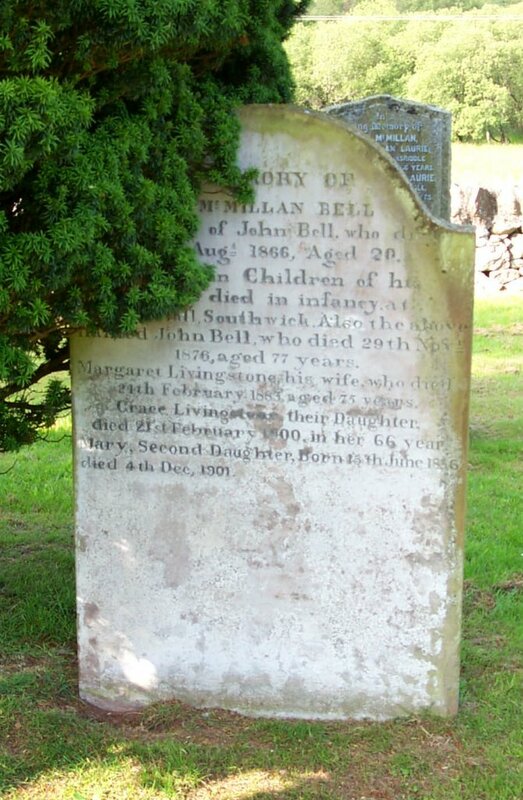 Also the above named John Bell, who died 29th Nov’r 1876, aged 77 years. Margaret Livingstone, his wife, who died 24th February 1883, aged 75 years. Grace Livingstone, their daughter, died 21st February 1900, in her 66 year. Mary, second daughter, born 15th June 1836, died 4th Dec. 1901. 094 In memory of Jane McCririe, wife of John Wilkinson, who died at Roundfell, Southwick, 1833 aged 29 years. 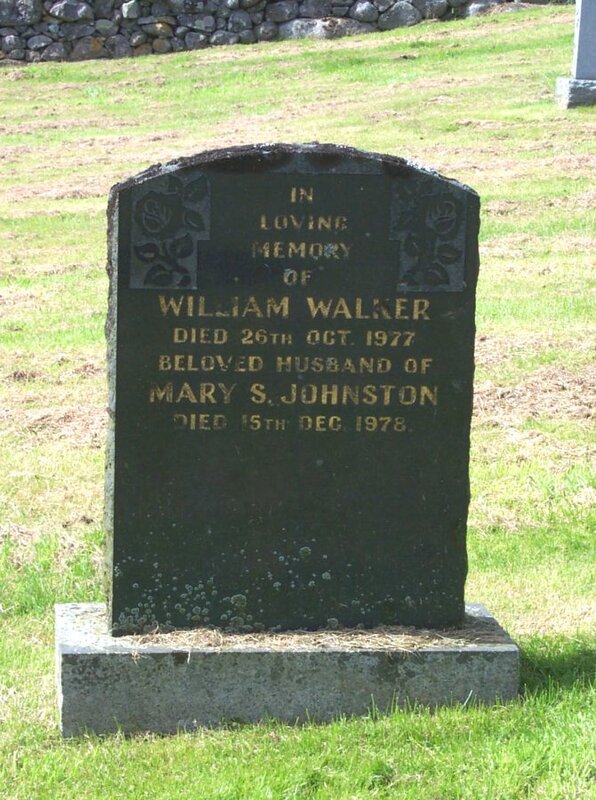 Also the above John Wilkinson, who died at Moorend, Newabbey Oct. 6th 1864, aged 68 years. 095 In memory of Janet Nichol, wife of Joseph Mollins, died at Parkhead, 1st July 1898, aged 48 years. Richard, their son, died 1st Aug. 1897, aged 6 years. 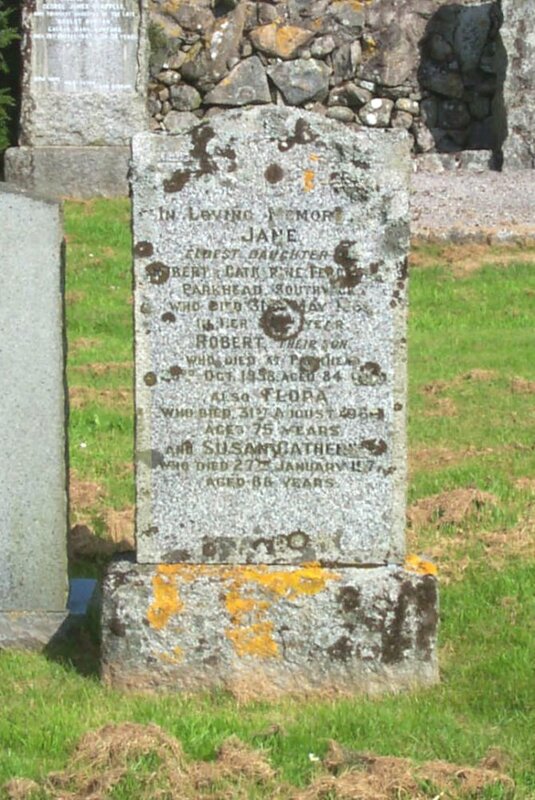 James, their son, died at Parkhead, 15th March 1900, aged 11 years and 9 months. 096 In memory of Sarah Thorburn, daughter of William Thorburn, who died at Knockenhilly, 29th March 1828, aged 19 years. 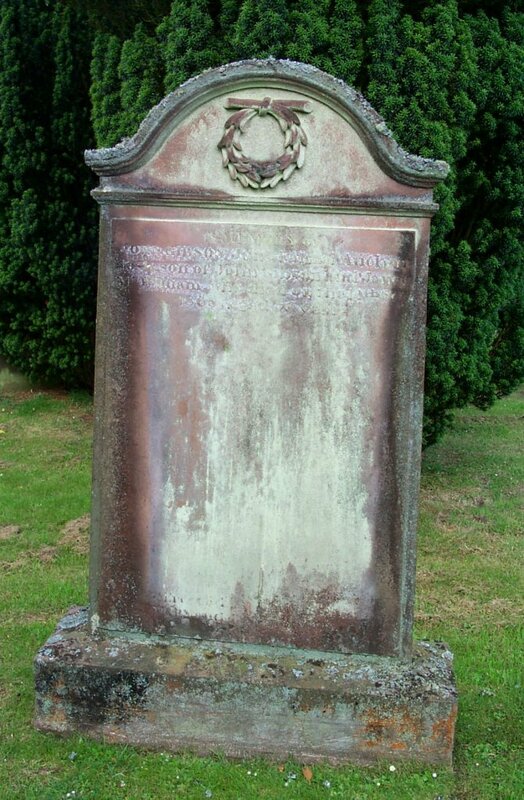 Also his son John Thorburn, who died 3d February 1830, aged 26 years. Also James Thorburn his son, who died on the 28th August 1836, aged 26 years. 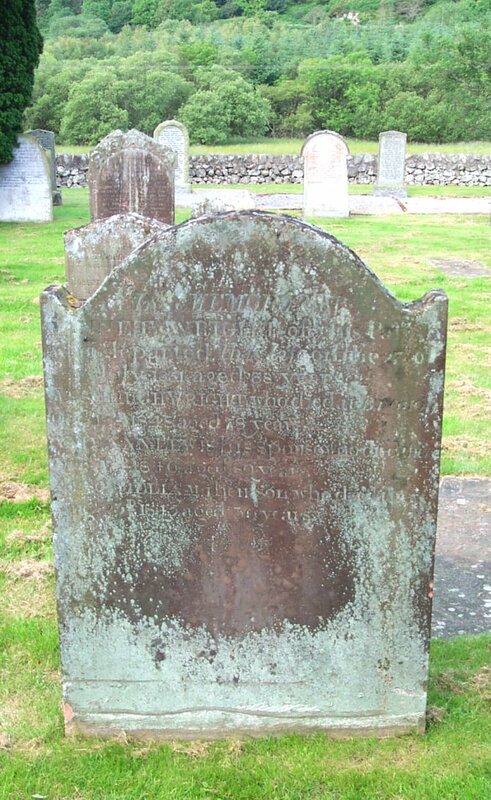 Also Agnes Pattey, spouse to the above William Thorhurn, who died at Isle of Kirkmahoe, on the 6th February 1850, aged 70 years. 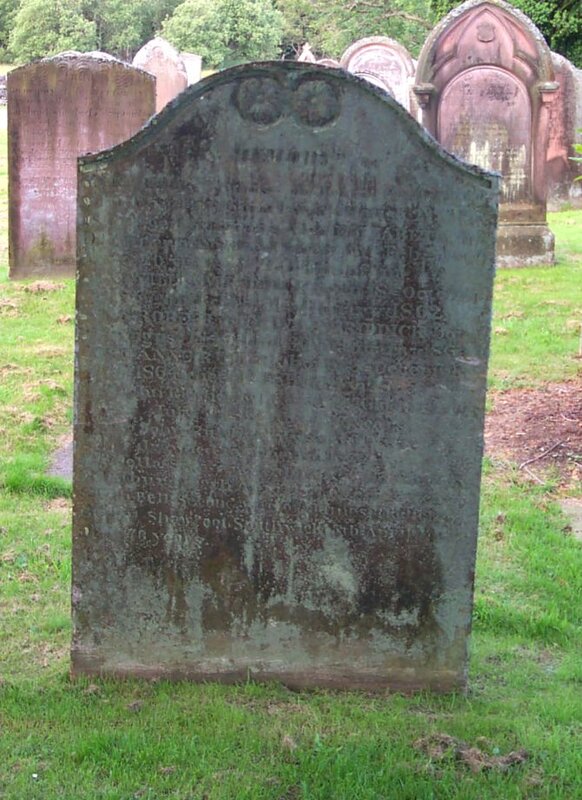 Also William Gillespie, his grandson who died in Dumfries, 25th July 1856, aged 31 years. 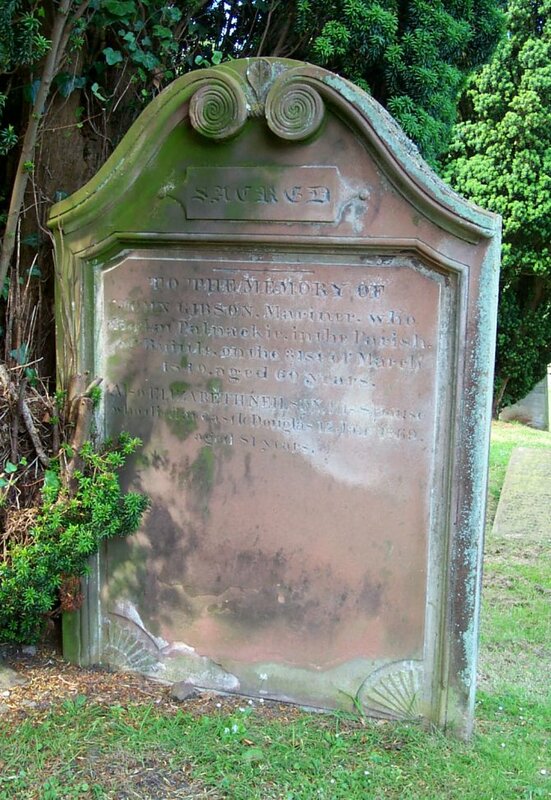 097 In loving memory of Maggie, daughter of Duncan McRae, gamekeeper, Auchenskeoch, died 15 July 1890, aged 16 years. Also Annie who died in infancy. 098 In memory of Jane Craik, spouse of Robert Seaton, who died at Southerness, 1st February 1867, aged 61 years. Also the above Robert Seaton, who died at Southerness, 7th Jan’y 1875, aged 73 years. Also John their son, who died at Douglas Hall, the 4th February 1887, aged 57 years. Also Jane Carlyle Seaton, daughter of the above Robert Seaton, who died at Southerness, 3rd Sept. 1909, aged 72 years. Also Robert Seaton, son of the above who died at Southerness, Kirkbean, 18th January 1925, aged 85 years. 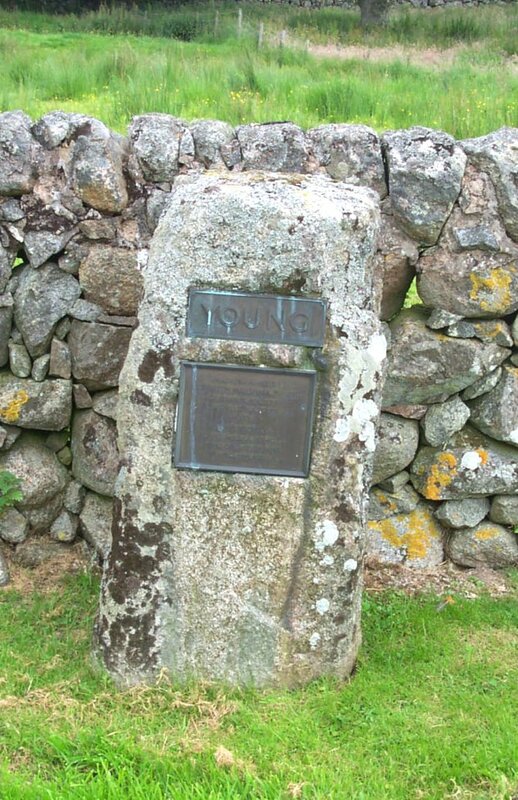 099 In memory of John Seaton in Jocklig, who died 12th June 1816, aged 49 years. Also James Seaton, his son, who died Feb’y 2nd 1815, aged 19 months. 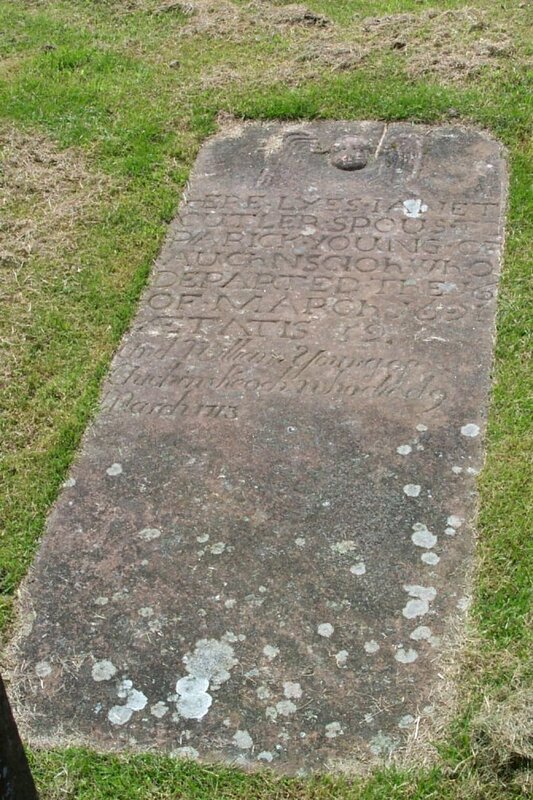 Also William Seaton, his son, who died Aug’t 1817, aged 7 years. Also Eliza Seaton, his daughter, and wife of D.G. Currie, draper, who died at Kerthyr Tydvil, May 27th 1838, aged 34 years. 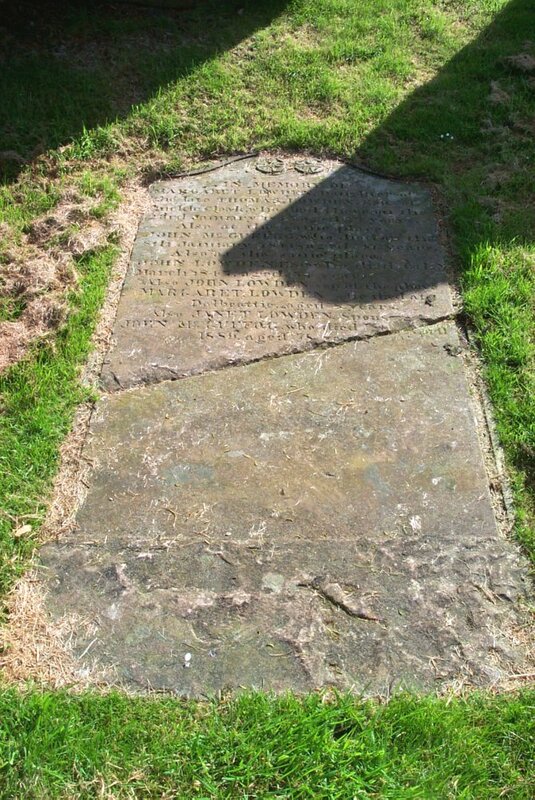 Also John Seaton, his son, tea dealer, Merthyr Tydvil, who died January 12th 1846, aged 37 years. And Mary Seaton, widow of the above John Seaton, who died at Springholme, 12th May 1860 aged 84 years. 100 Erected by Robert Irving, in loving memory of Robert Rae Irving, his son, died at Bogueknowe, 6th March 1881 aged 18 months. Also Elizabeth M. Irving, died at same place July 15th 1889, aged 21 years. Also Maggie M. Irving, who died 21st Feb’y 1894 aged 17 years & 7 months. Also Jane McClymont Irving, who died 4th Oct’r 1894, aged 16 years. Also Robert Irving, father of the above, who died 21st February 1912 aged 69 years. 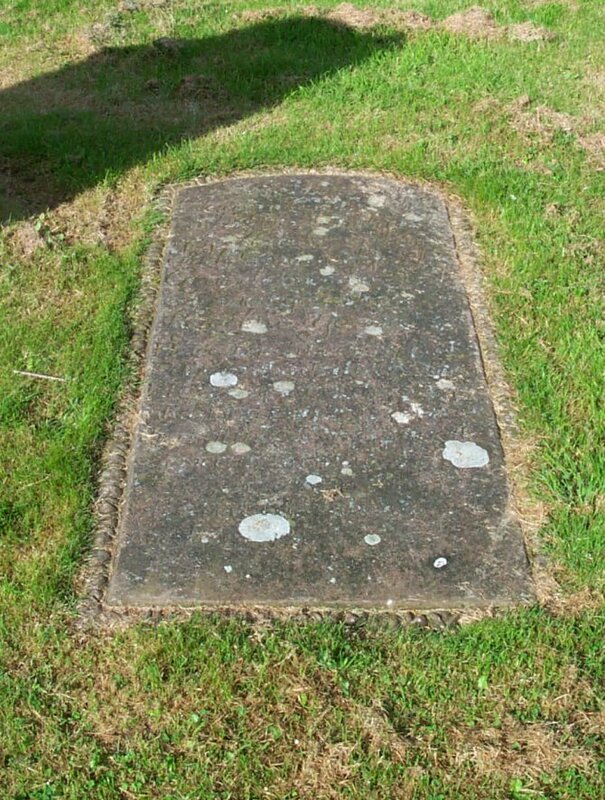 Also Janet Murdoch, wife of the above who died at Dumfries, 28th Jan'y. 1933, aged 90 years. 101 In loving memory of Mary McMillan, wife of William Laurie, who died at Mainsriddle, 9th July 1928, aged 86 years. 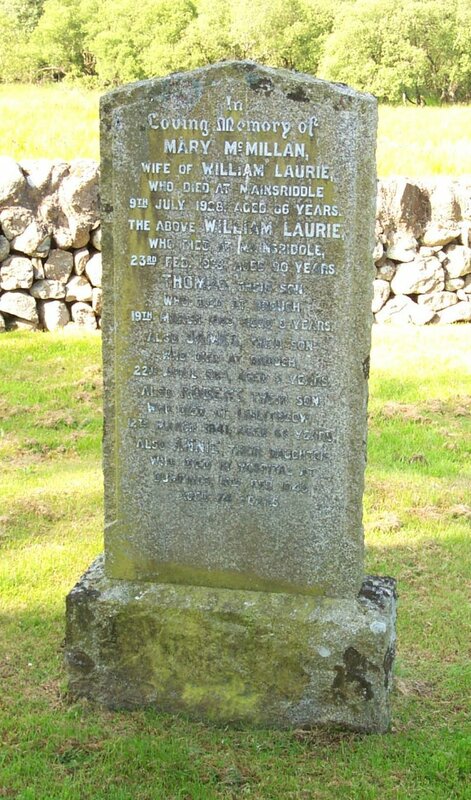 The above William Laurie, who died at Mainsriddle, 23rd Feb. 1932, aged 90 years. Thomas, their son, who died at Brough, 19th March 1883, aged 8 years. Also James, their son, who died at Brough, 22nd April 1883, aged 5 years. Also Robert, their son, who died at Linlithgow, 12th March 1941, aged 68 years. 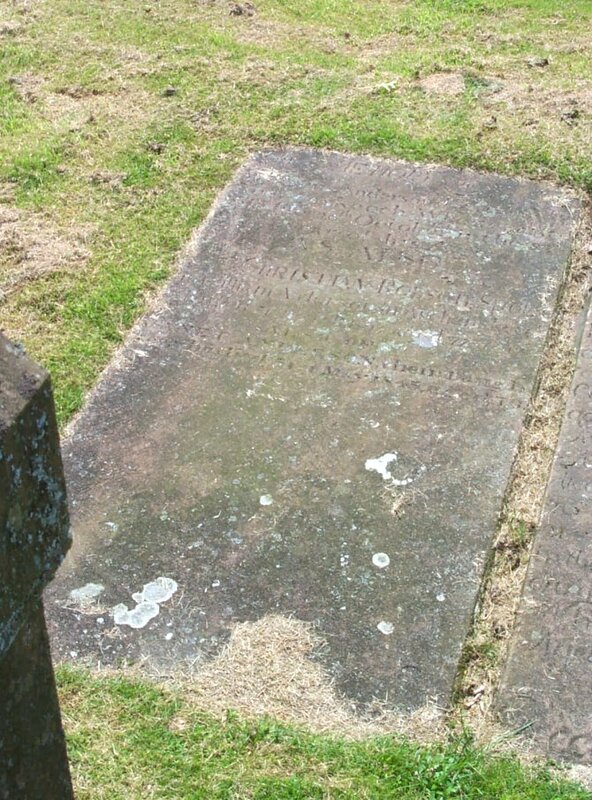 Also Annie, their daughter, who died at hospital at Dumfries, 15th Feb. 1949, aged 74 years. 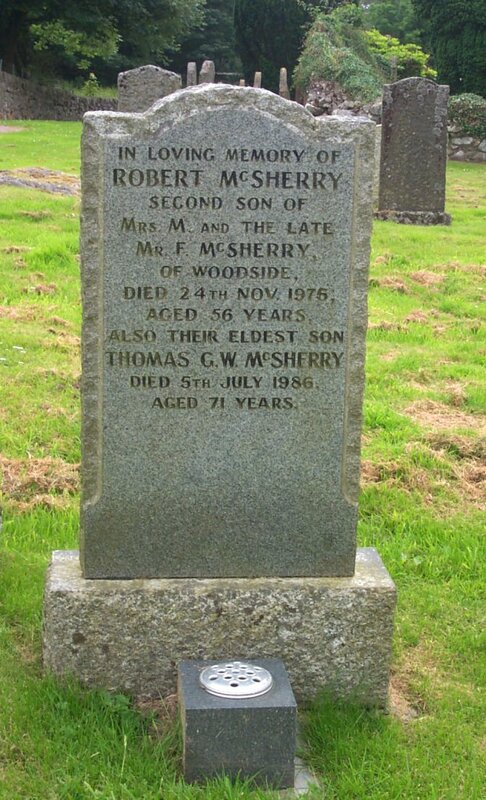 102 In memory of Robert McSherry, who died at Woodside on 30th December 1918, aged 69 years. 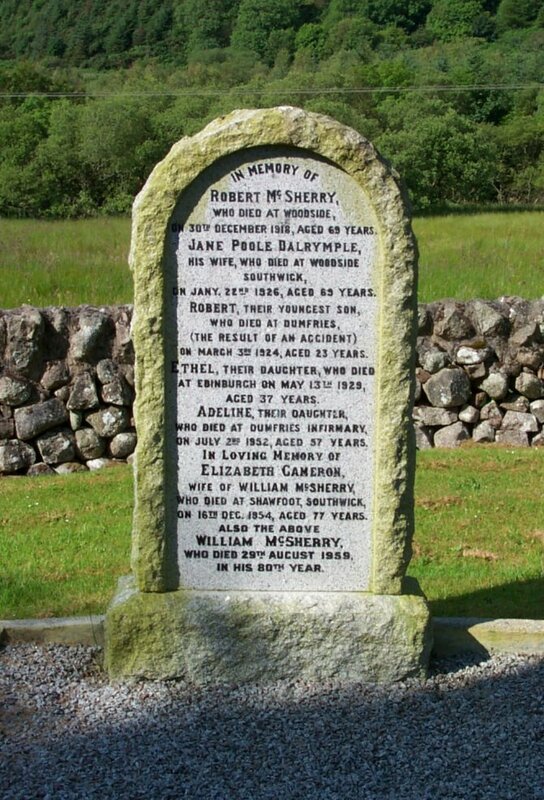 Jane Poole Dalrymple, his wife, who died at Woodside, Southwick on 22nd Jan'y 1926, aged 69 years. 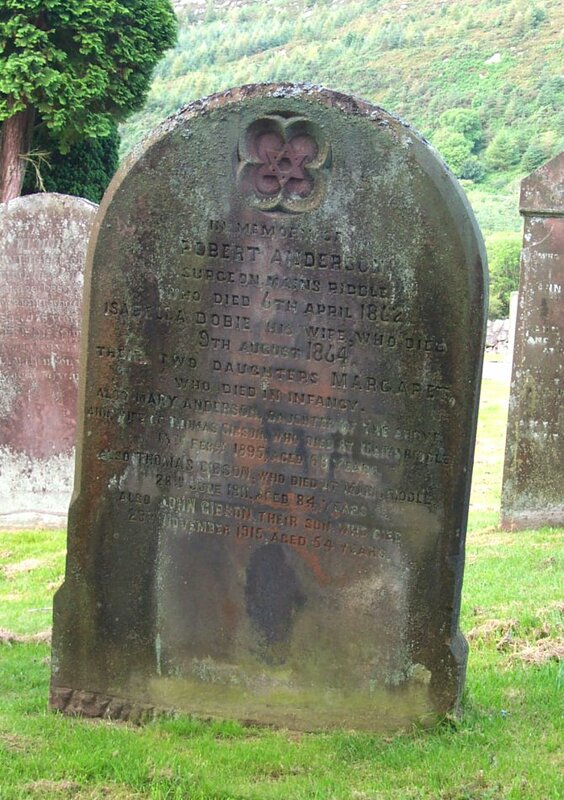 Robert, their youngest son, who died at Dumfries (the result of an accident) on March 3rd 1924, aged 23 years. 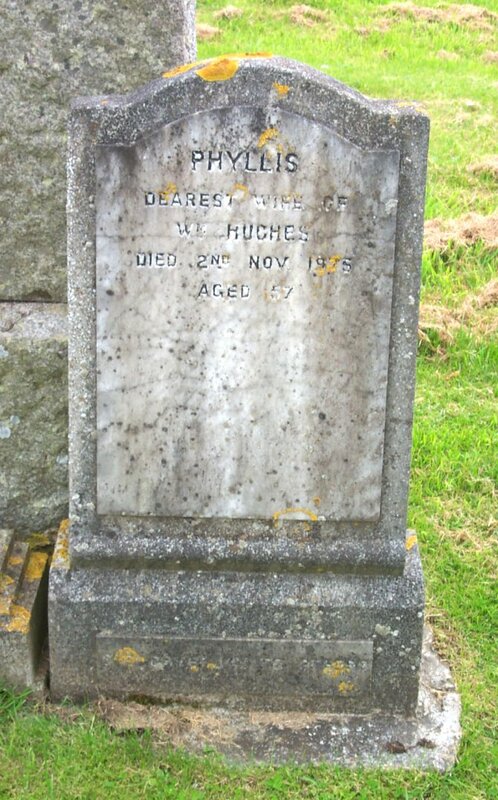 Ethel, their daughter, who died at Edinburgh on May 13th 1929, aged 37 years. 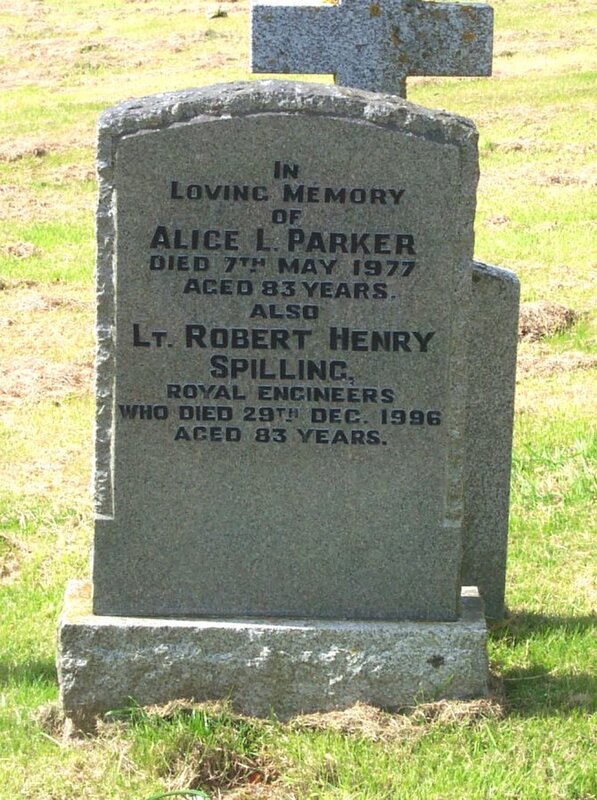 Adeline, their daughter, who died at Dumfries Infirmary on July 2nd 1952, aged 57 years. In loving memory of Elizabeth Cameron, wife of William McSherry, who died at Shawfoot, Southwick on 16th Dec. 1954, aged 77 years. Also the above William McSherry, who died 29th August 1959, in his 80th year. 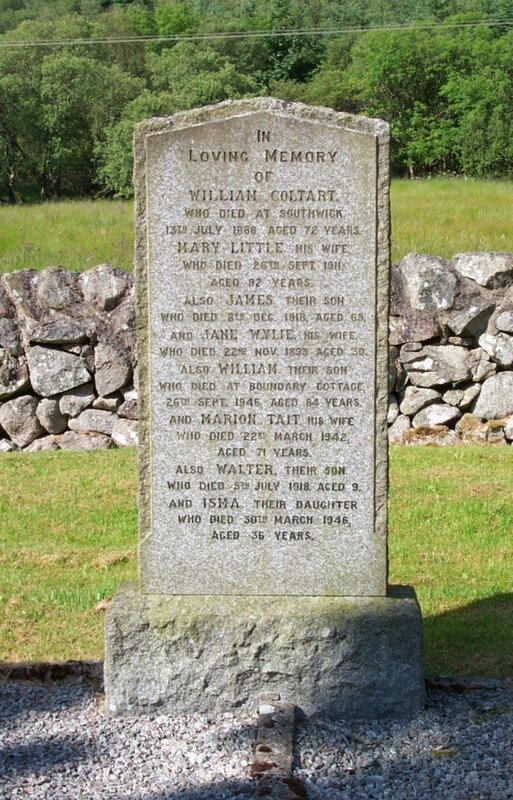 103 In loving memory of William Coltart, who died at Southwick, 13th July 1888, aged 72 years. Mary Little, his wife, who died 26th Sept. 1911, aged 92 years. Also James, their son, who died 8th Dec. 1918, aged 65. Also Jane Wylie his wife, who died 22nd Nov. 1893, aged 30. Also William, their son, who died at Boundary Cottage, 26th Sept. 1946, aged 84 years. And Marion Tait, his wife, who died 22nd March 1942, aged 71 years. Also Walter, their son, who died 5th July 1918, aged 9. Also Isma, their daughter, who died 30th March 1946, aged 36 years. 104 In memory of Mary McKenna, widow of John Love, who died Sept. 1912, aged 57 years. 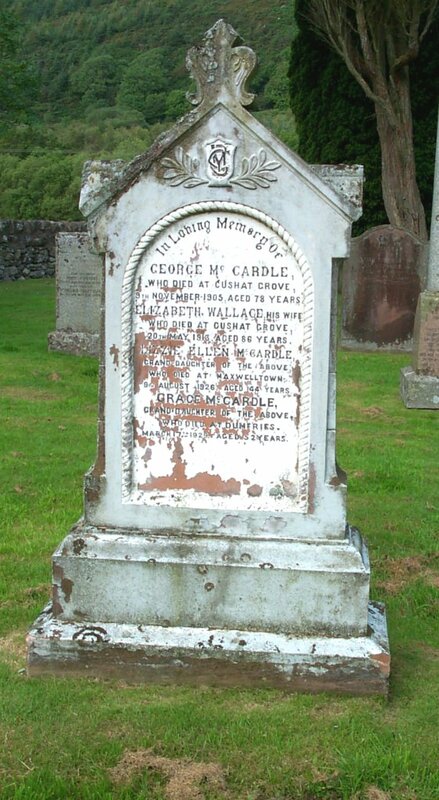 Also George, their son, who died at Torrorie, 5th April 1912, aged 21 years. Also John, son of David Love, who was accidentally drowned, 1st July 1917, in his 14th year. Also Mary Crabbe, his daughter, who died 6th Nov’r. 1905, aged 4 years. 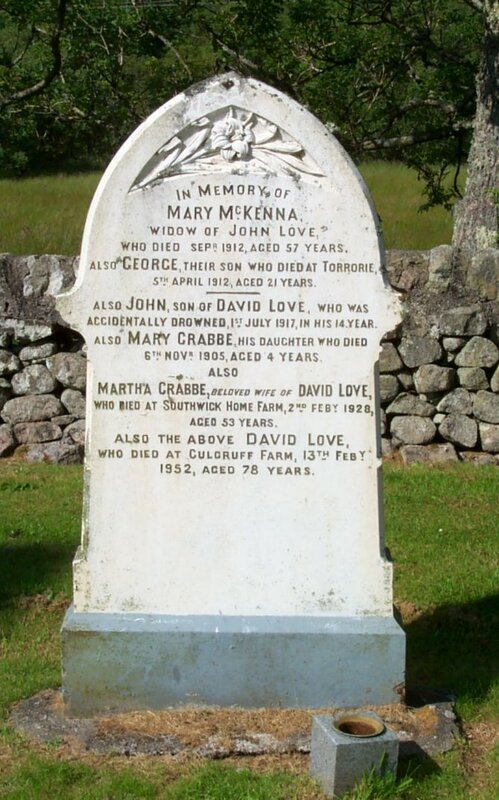 Also Martha Crabbe, beloved wife of David Love, who died at Southwick Home Farm, 2nd Feb’y. 1928, aged 53 years. Also the above David Love, who died at Culgruff Farm, 13th Feb’y. 1952, aged 78 years. 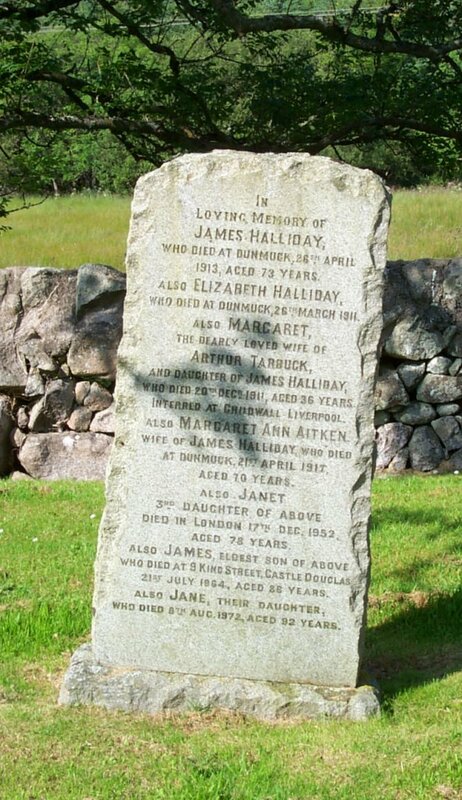 105 In loving memory of James Halliday, who died at Dunmuck, 26th April 1913, aged 73 years. Also Elizabeth Halliday, who died at Dunmuck, 26th March 1911. Also Margaret, the dearly loved wife of Arthur Tarbuck, and daughter of James Halliday, who died 20th Dec’r 1911, aged 36 years. Interred in Childwall, Liverpool. Also Margaret Ann Aitken, wife of James Halliday, who died at Dunmuck, 21st April 1917, aged 7O years. Also Janet, 3rd daughter of above, died in London 17th Dec’r 1952, aged 78 years. Also James, eldest son of above who died at 9 King Street, Castle Douglas, 21st July 1964, aged 86 years. Also Jane, their daughter, who died 8th Aug. 1972, aged 92 years. 106 In loving memory of Mary Gibson, beloved wife of William McLeod, Nether Clifton, Southwick, who died 12th Feb. 1920, aged 49 years. 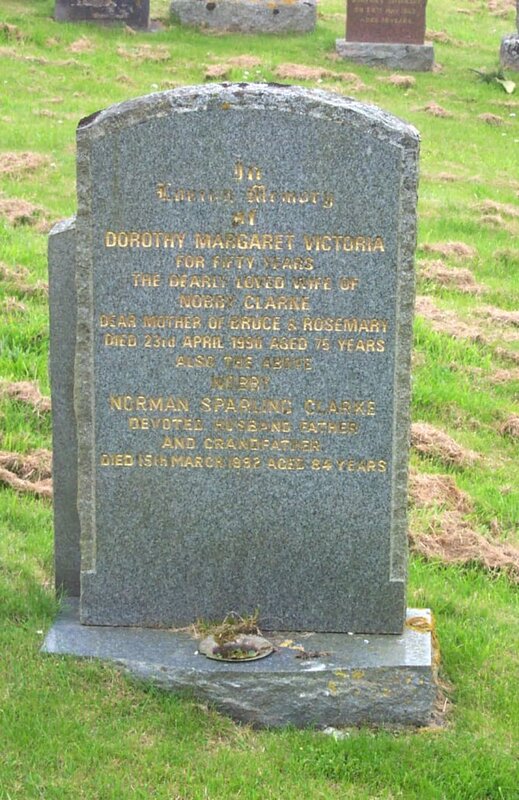 Also his second wife Marion Ellen Morton, who died at castle Douglas, 22nd March 1949, aged 67 years. 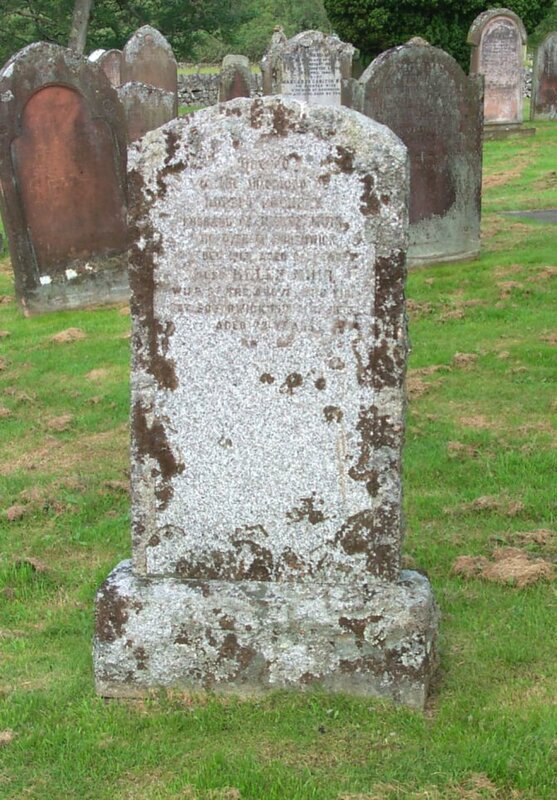 Also the above William Mcleod, who died at 18 Church Street, Castle Douglas, 15th Dec. 1950, aged 83 years. Also Mary Agnes McLeod, eldest daughter of the above William & Mary McLeod, beloved wife of James C.C. Dobie, died at London, 11th Nov. 1980. Also their youngest daughter, Margaret Templeton McLeod, beloved wife of Ewan A. McPherson, died at Edinburgh, 19th Nov. 1990, aged 76 years. 107 In loving memory of John Douglas, who died at Bridge-end Cottage, 21st Jan’y 1910, aged 70 years. 108 In memory of Adam, son of Wm. Smith, who died at Newhouse on June the 25th 1881, aged 17 years. 109 In memory of Agnes Stevenson, wife of James McNaught, who died at Houstard, Colvend, 13th July 1914, aged 67 years. Also on 13th Feb’y. 1926, James McNaught, in his 78th year. 110 In memory of Arthur Tracey, who died at Home Farm, Southwick, 1st May 1902, aged 72 years. 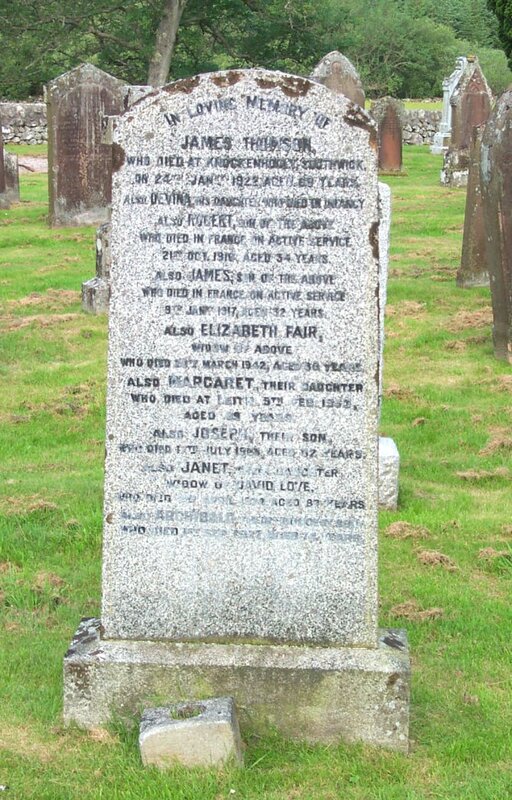 Alice Fox, daughter-in-law of the above, who died at Hawthorn Place, Dalbeattie, 13th May 1912, aged 41 years. 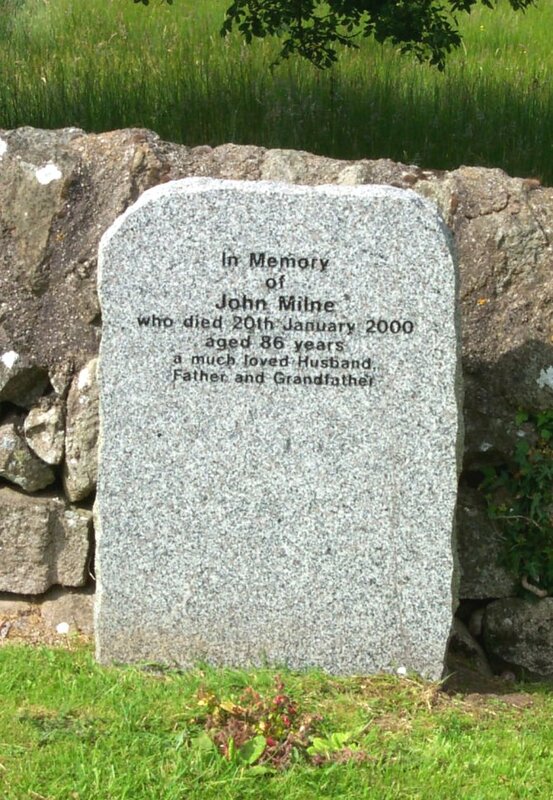 110a In memory of John Milne, who died 20th January 2000, aged 86 years, a much loved husband, father and grandfather. 111 In loving memory of David Dalgleish, son of David Coupland, Plumjordan, who was drowned while bathing, 10 Aug. 1900, aged 12 years. Also Mary Ann Stitt, beloved wife of David Coupland, who died at Livingston Hall, Southwick, 31 March 1926, aged 89 years. Also Margaret Jane Dalgleish, wife of George Currie and daughter of the above, who died at Newbarn, 23 August 1925, aged 43 years, interred in Colgate Cemetery, Sussex. Also the above David Coupland, who died at Post Office, Southwick, 21 February 1937, aged 78 years. Also Annie Stitt Wragg, wife of Wm Wragg and daughter of above David Coupland, who died at Edgeware, 6 April 195, aged 67 years, cremated at Golders Green, London. 112 In memory of Elizabeth Campbell, beloved wife of James Graham, who died at Newhouses, Mainsriddle, 15th April 1906, aged 71 years. 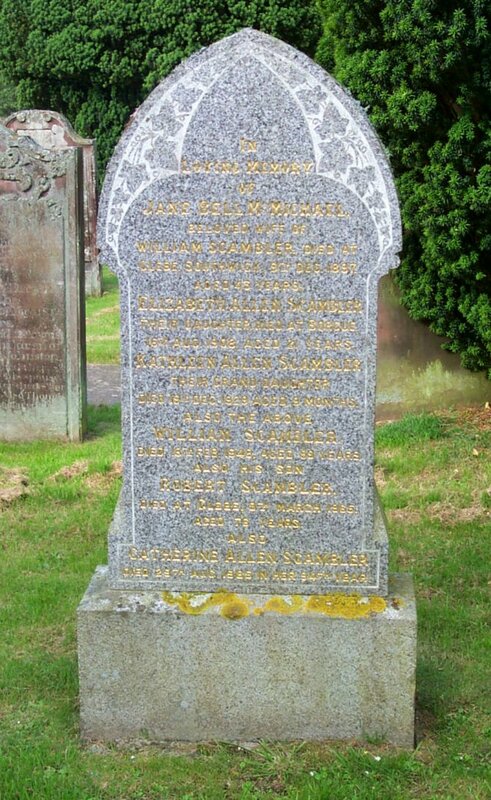 Also the above James Graham, who died at Millburn Avenue, Dumfries, 3rd Jan. 1926, aged 75 years. 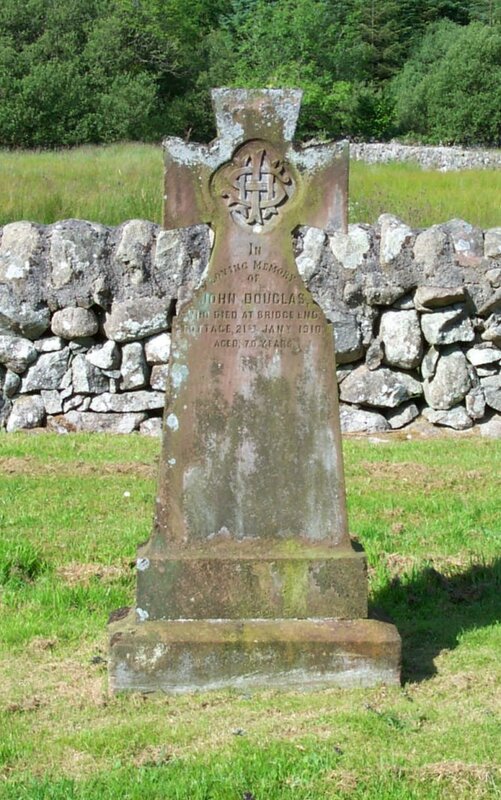 113 In loving memory of John McCall, who died at West Barmoffity, Kirkpatrick Durham, 2nd July 1892, aged 52 years. Also Nicholas Cannan, his wife, who died at Auchenlosh, Southwick, 30th March 1909, aged 63 years. Also David Cannan their son, who died at West Barmoffity, Kirkpatrick Durham, 22nd Jan. 1904, aged 11 years. Also their daughter Margaret, died 30th August 1957, aged 78 years. 114 In loving memory of Mark Simpson Roberts, died 23rd Oct. 1928, aged 14 years. Also his father John W. Roberts, died 26th Sept. 1929, aged 42 years. 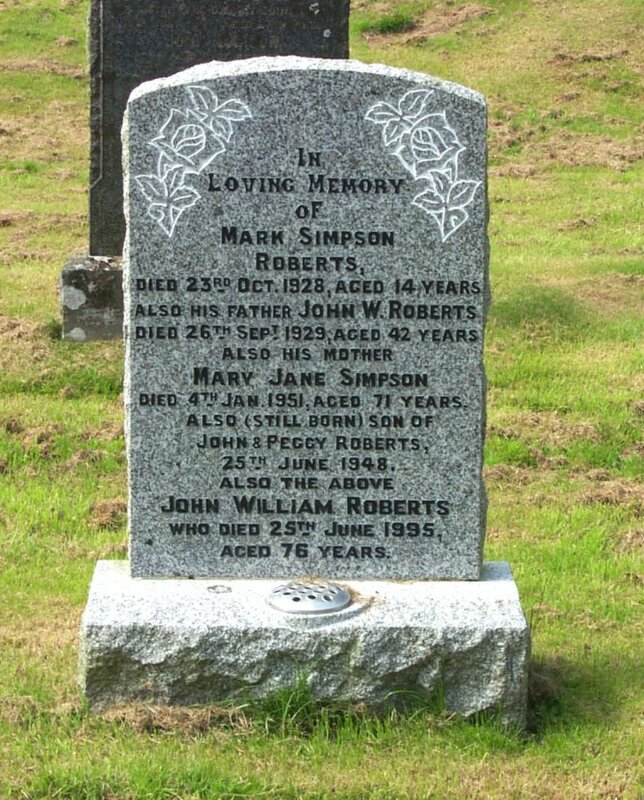 Also his mother Mary Jane Simpson, died 4th Jan 1951, aged 71 years. Also (still born) son of John & Peggy Roberts, 25th June 1948. Also the above John William Roberts, who died 25th June 1995, aged 76 years. 115 In loving memory of Agnes Jane Palmer, beloved wife of Samuel Landsburgh, Auchenskeoch Cottage, who died 20th April 1926, aged 20 years. Their youngest daughter, Samina, who died at Corrie Bridge, Lockerbie, 8th May 1908, aged 15 months. 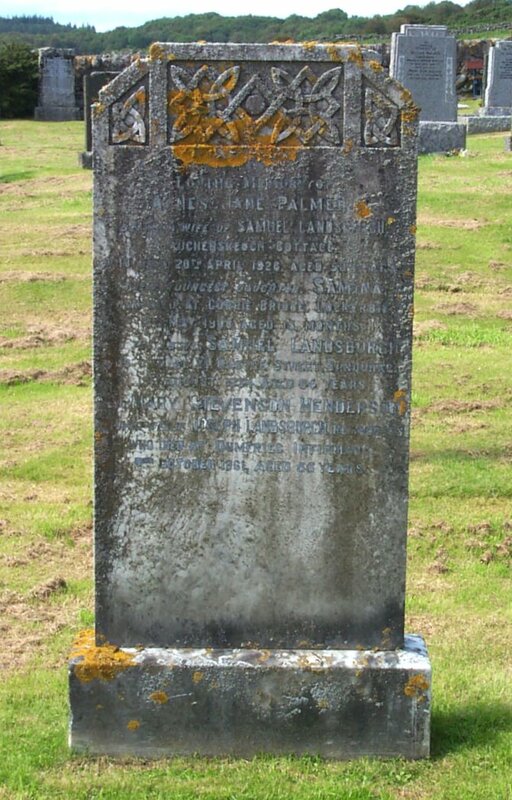 Also the above Samuel Landsburgh, who died at 21 Castle St., Sanquhar, 19th August 1934, aged 64 years. Mary Stevenson Henderson, beloved wife of Joseph Landsburgh, Newhouses, who died at Dumfries Infirmary – October 1961, aged 55 years. 116 In loving memory of Elizabeth Watson, beloved wife of Andrew McKinnon, who entered into rest at Carsethorn, 29th May 1936, aged 72 years. 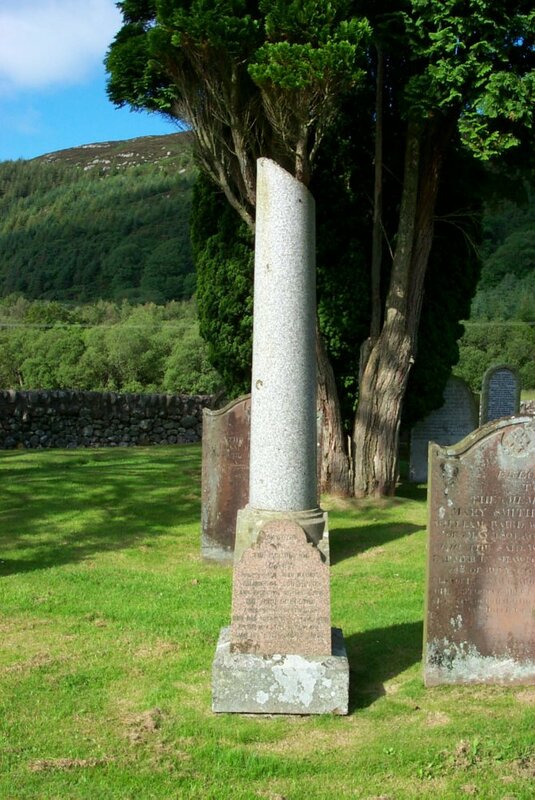 Also the above Andrew McKinnon, Heughs of Laggan, Colvend, who passed away 27th July 1923, aged 80 years. Thy will be done. 117 In memory of John L. Walker, M.A., died 11th Nov. 1950. Jane C. Walker, died 5th Aug. 1952. George B. Walker, killed in action, 1941. Elspeth Lamb, died 24th Feb. 1928. 118 In loving memory of William Carson, Linnethill, who died 15th June 1928, aged 34 years. Also Elizabeth Carson, his sister, who died at Edinburgh, 19th July 1929, aged 27 years. John Carson, father of the above, who died at Gelston, 26th June 1946, aged 84 years. 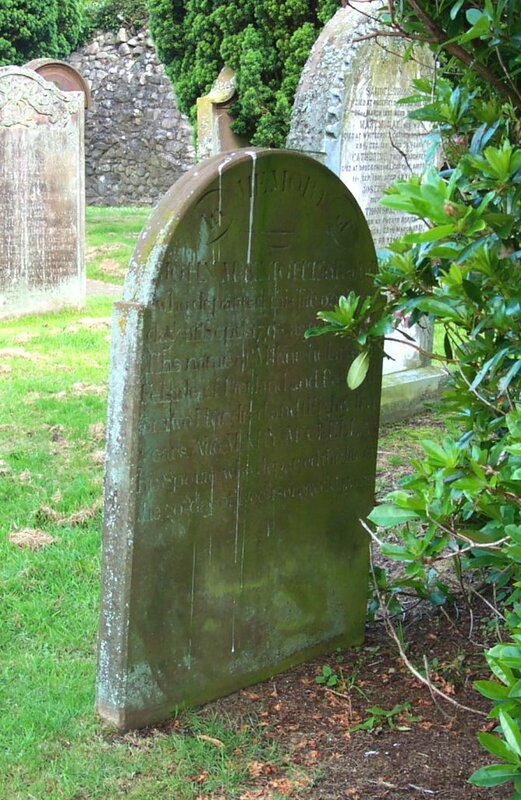 Also Elizabeth McClune, wife of the above, who died at Kirkcudbright, 20th Feb’y 1954, aged 82 years. 119 In loving memory of James Thomson, who died at Mainsmill, 24th September 1930, aged 57 years. Agnes Robson, his wife, who died at Mainsmill, 27th Sept. 1944, aged 74 years. 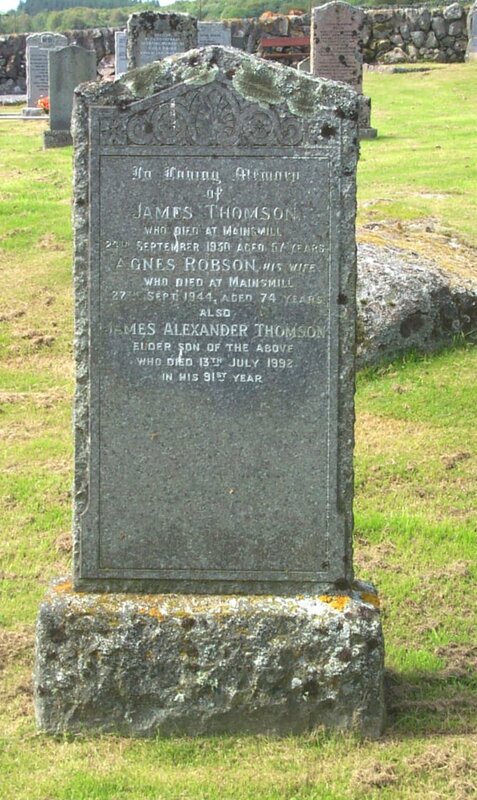 Also James Alexander Thomson, elder son of the above who died 13th July 1992, in his 91st year. 120 In loving memory of Sadie, dearly beloved daughter of John & Jeanie Cameron, who died at Castle Farm, Southwick, 13th May 1942. Also the above John J. Cameron, who died at 4 Portland Place, Dumfries, 14th Jan. 1955. Also Anne, dearly beloved daughter of John & Jeanie Cameron, who died at 53 Glasgow Street, Dumfries, 13th Aug’t 1966. His wife Jeanie K. Murdoch, died 23rd April 1983, aged 91 years. 121 Erected by his wife and family in loving memory of Hugh Laird, born at Larg, Minnigaff, 11th January 1873, died at Southwick Bank, 17th June 1943. 122 In loving memory of William Walker, Caulkerbush, who died at Dumfries Infirmary, 5th April 1945, aged 77. Also his wife, Mary Jane Neilson, who died at Calkerbush, 15th Jan 1954, aged 83. 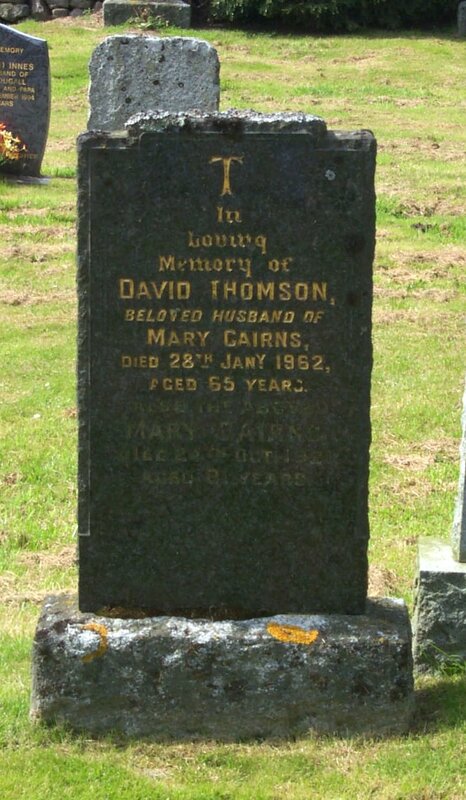 123 In loving memory of David Thomson, beloved husband of Mary Cairns, died 28th Jan’y 1962, aged 65 years. Also the above Mary Cairns, died 24th Oct. 1981, aged 81 years. 124 In loving memory of Marcus Dods Ewell, who died 1st Jan. 1956, aged 73 years. Beloved husband of Margaret M. Ewing, Bridgend, Southwick. 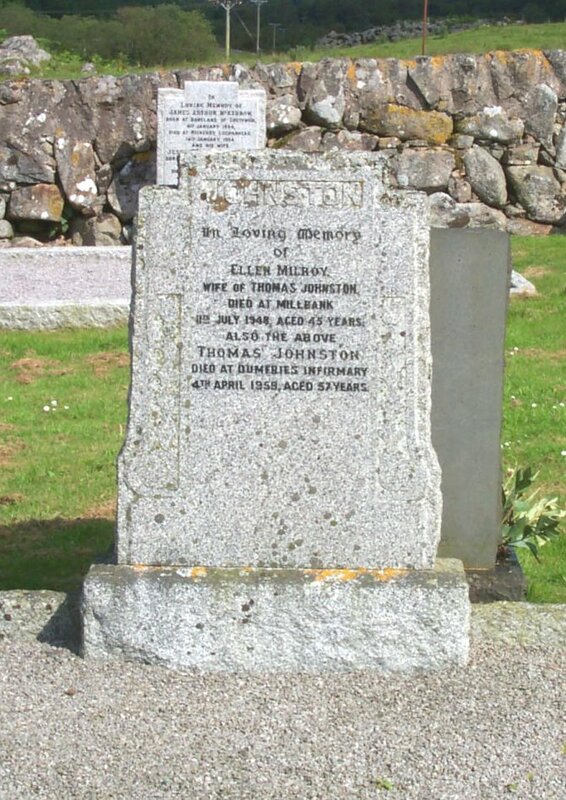 Also Margaret Muir Ewing, Bridgend, Southwick, beloved wife of above, who died 20th February 1960, aged 76 years. 125 In loving memory of Helen Dickson Murray, (Ella), beloved wife of Jack Buchanan, of Sunny Dene, Mainsriddle, aged 42 years. Also Christine, daughter of the above, aged 12 years. 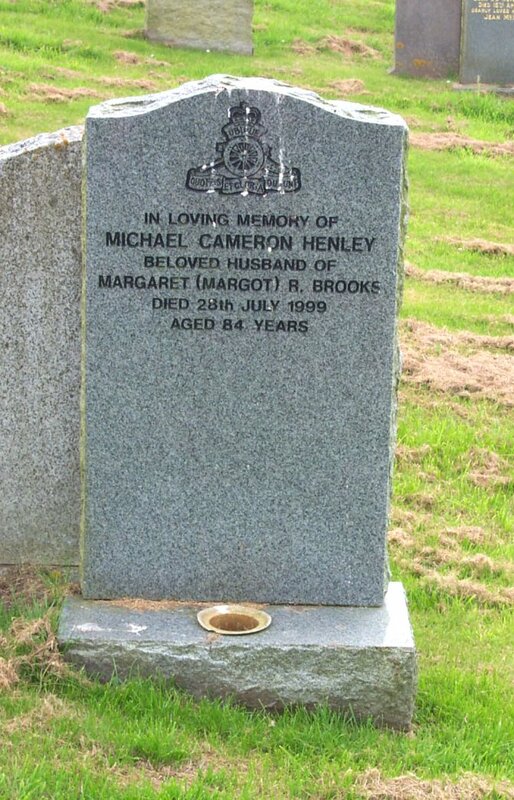 Who both died 22nd August 1958, the result of a drowning accident in the Solway. 126 Nil Desperandum Christo Duce. 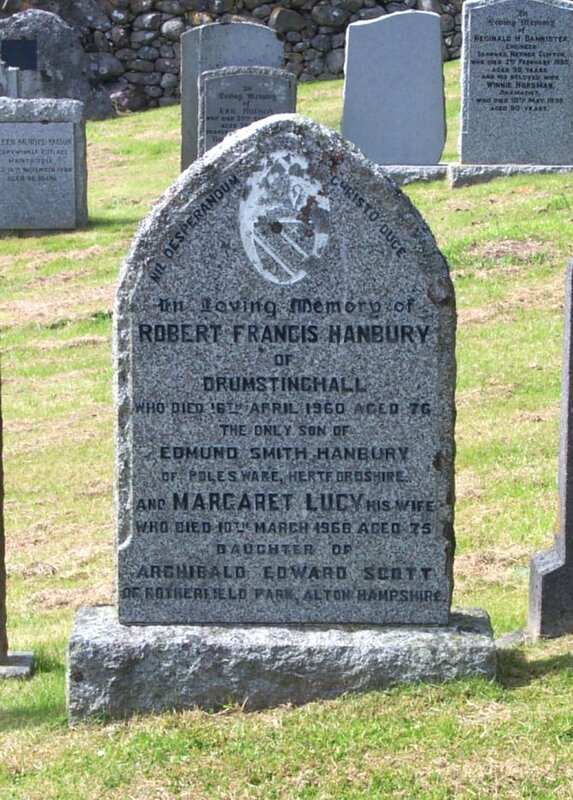 In loving memory of Robert Francis Hanbury of Drumstinghall, who died 16th April 1966, aged 76, the only son of Edmund Smith Hanbury of Polesware, Hertfordshire. And Margaret Lucy, his wife, who died 10th March 1960, aged 75, daughter of Archibald Edward Scott, of Rotherfield Park, Alton, Hampshire. 127 In loving memory of George Calder Edgar of Auchenlosh, who died 15th October 1950, aged 21. 128 To the memory of Anne Swarbrick Calder, beloved wife of George Edgar, Craigiepark, Thornhill, late of Auchenlosh, who died 25th October 1962, aged 69 years. Also the above George Edgar, who died 31st March 1965, aged 78 years. 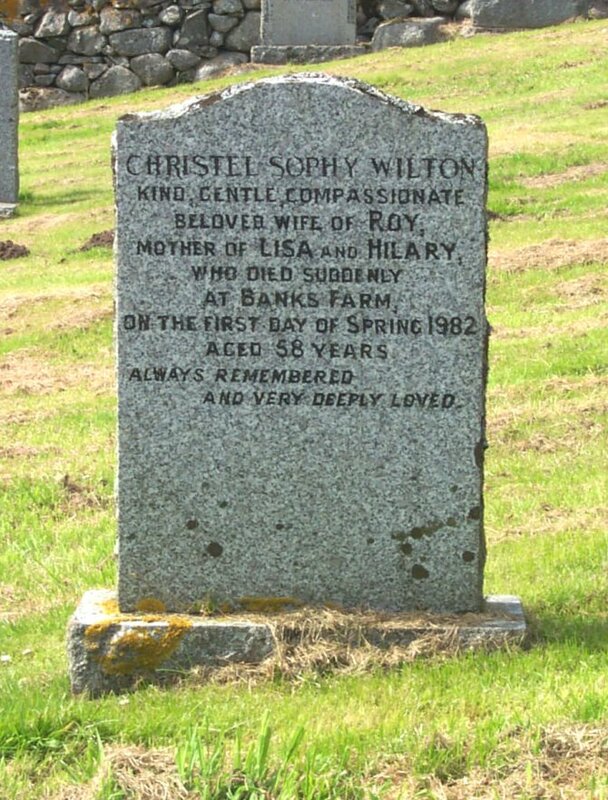 129 Christel Sophy Wilton, kind, gentle, compassionate, beloved wife of Roy, mother of Lisa and Hilary, who died suddenly at Banks Farm, on the first day of spring, 1982, aged 58 years. Always remembered and very deeply loved. 130 In proud and loving memory of H.C. Sinclair, (Bertie), (Military M.B.E. and Bar) 1915 – 1980. 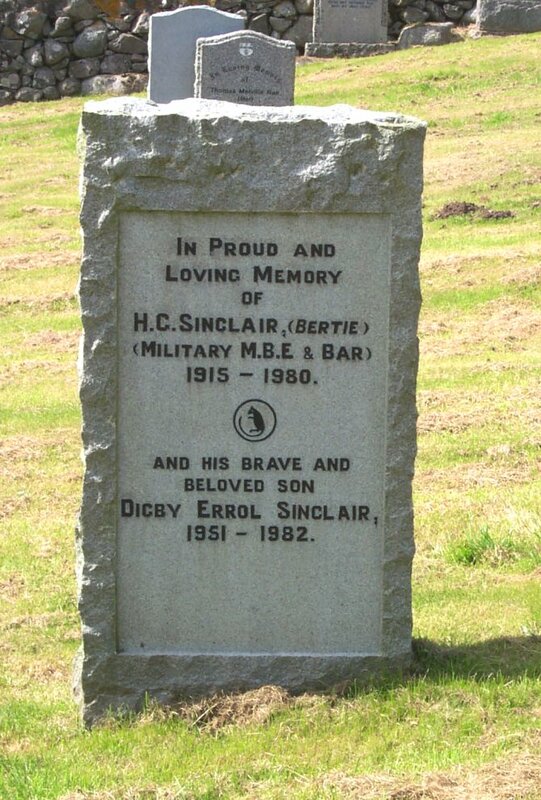 And his brave and beloved son Digby Errol Sinclair, 1951 – 1982. 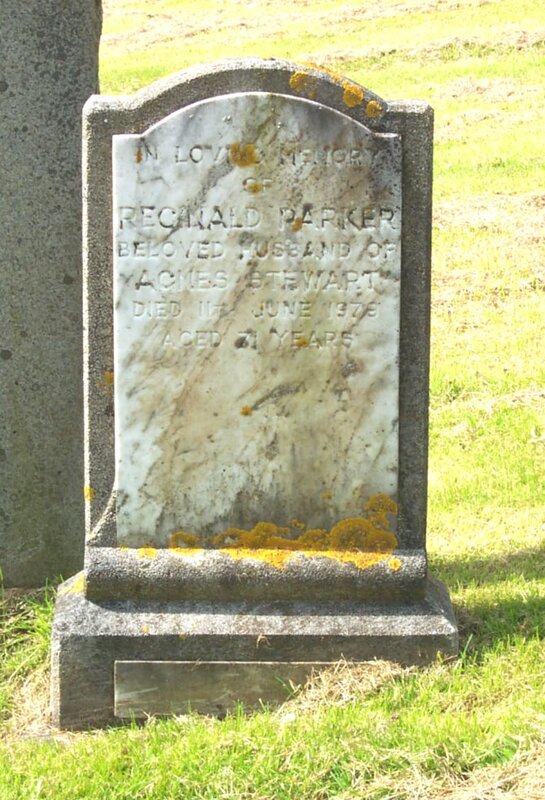 131 In loving memory of Reginald Parker, beloved husband of Agnes Stewart, died 11th June 1979, aged 71 years. 132 In loving memory of William Walker, died 26th Oct. 1977, beloved husband of Mary S. Johnston, died 15th Dec. 1978. 133 In loving memory of Alice L. Parker, died 7th May 1977, aged 83 years. Also Lt. Robert Henry Spilling, Royal Engineers, who died 29th Dec. 1996, aged 83 years. 134 In loving memory of John Wight, late of Borland Hill, Southwick, died 27th Feb. 1943, aged 73 years. His wife Mary Murray, died 13th Sep. 1900, aged 33 years. Also their son George Thomas Wight, Private, C. Coy. 6th Batt. R.S.F., died 14th Feb. 1915, aged 18 years. 135 In loving memory of Jessie McCardle, wife of William Atkinson, who died at Marbuie, Colvend, 28th June 1936, aged 81 years. 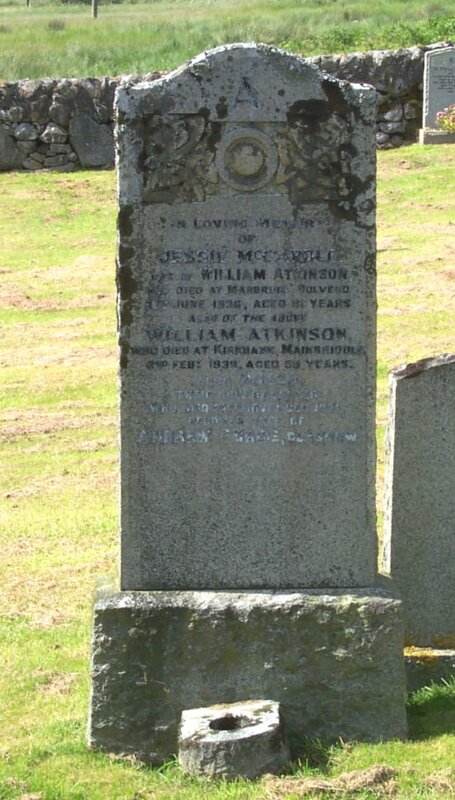 Also of the above William Atkinson, who died at Kirkbank, Mainsriddle, 2nd Feb’y 1939, aged 83 years. 136 In loving memory of my beloved husband and our dear father Frank McSherry, of Woodside, born 1st March 1885, died 19th July 1968. Also Margaret Wight, beloved husband of the above, born 23rd Nov. 1893, died 27th Feb. 1977. Also his son James, who died in infancy. 137 In loving memory of Isabella D. McSherry, wife of the late Nicholas Beveridge, of Ewart, Wooler, died at 6 St. Michael St., Dumfries, 30th Dec. 1961. 138 In loving memory of David McCartney, died 13th February 1936, aged 35 years. Also his beloved wife Jessie Muir, died 17th July 1989, aged 84 years. 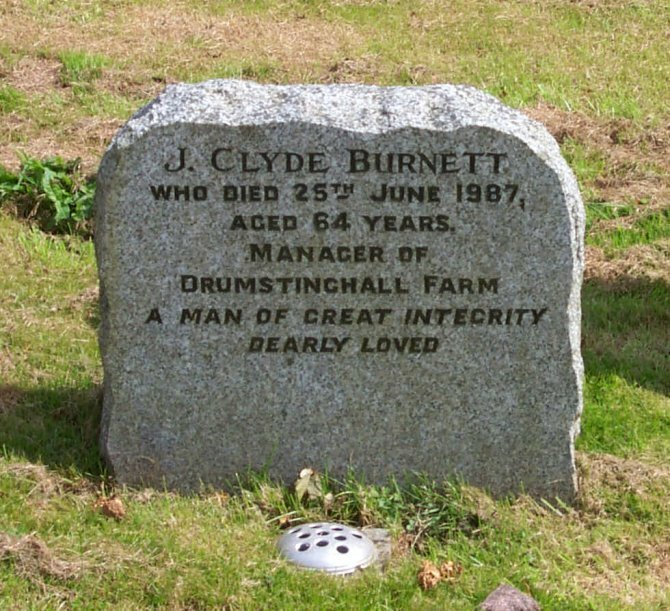 139 J. Clyde Burnett, who died 25th June 1987, aged 64 years. Manager of Drumstinghall Farm. A man of great integrity. Dearly loved. 140 In loving memory of Karen Margaret Ward, died 19th January 1983, aged 22 years. 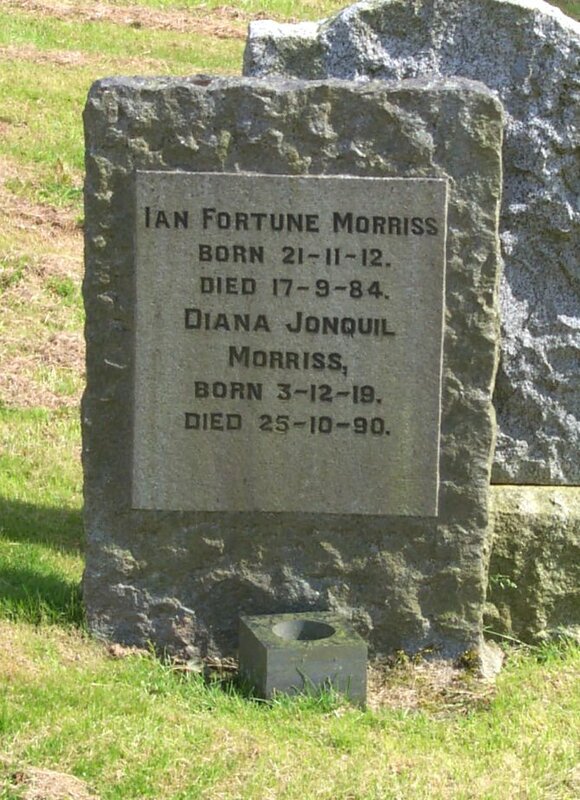 141 Ian Fortune Morriss, born 21-11-12, died 17-9-84. Diana Jonquil Morriss, born 3-12-19, died 25-10-90. 142 In loving memory of Malcolm D. Kennedy, Capt. Cameronians (Scottish Rifles), of Kippford, 1895 – 1984. And of his beloved wife Margaret Coutts, 1898 – 1973. And their dear son Mungo, lost at sea 1945. 143 In loving memory of John James Fleming, master mariner, born 3rd November 1921, died 15th April 1987. 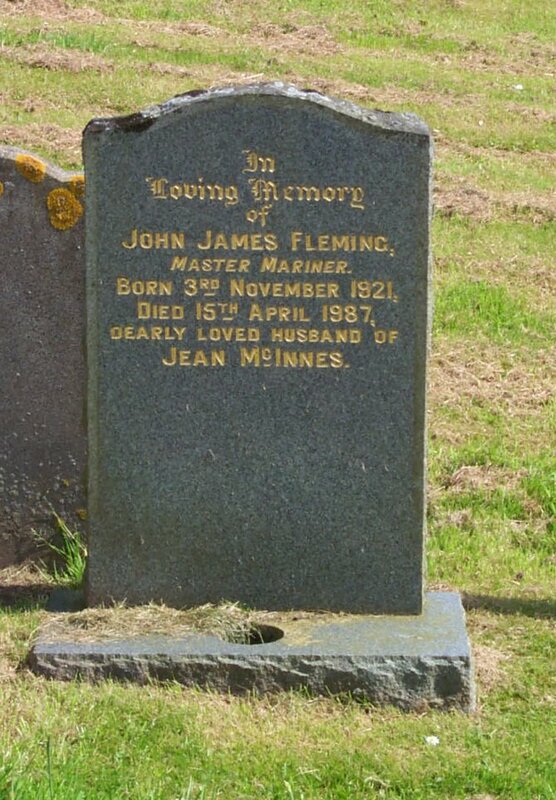 Dearly loved husband of Jean McInnes. 144 In loving memory of Harry Ronald Heald, born at Hove House, Mexborough, 12th May 1907, died Castle Douglas Hospital, 12th April 1988. 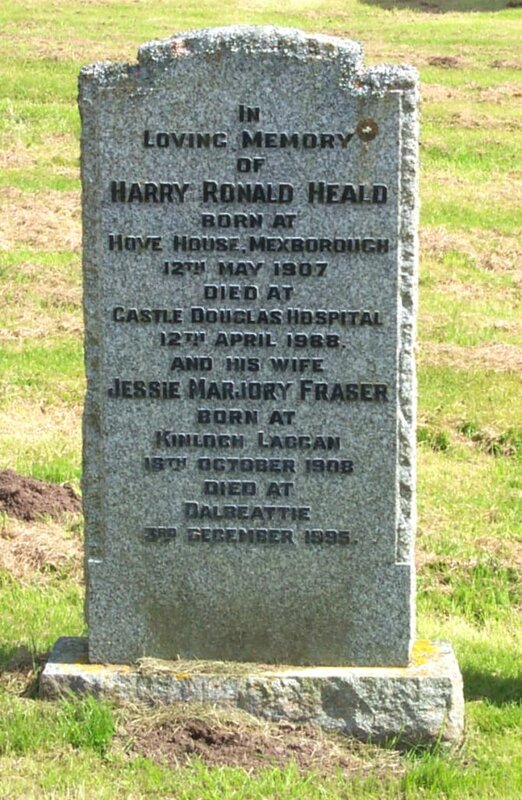 And his wife Jessie Marjory Fraser, born at Kinloch Laggan, 16th October 1908, died at Dalbeattie, 3rd December 1995. 145 In loving memory of David Carson (Doug) who died 11th July 1983, aged 87 years. 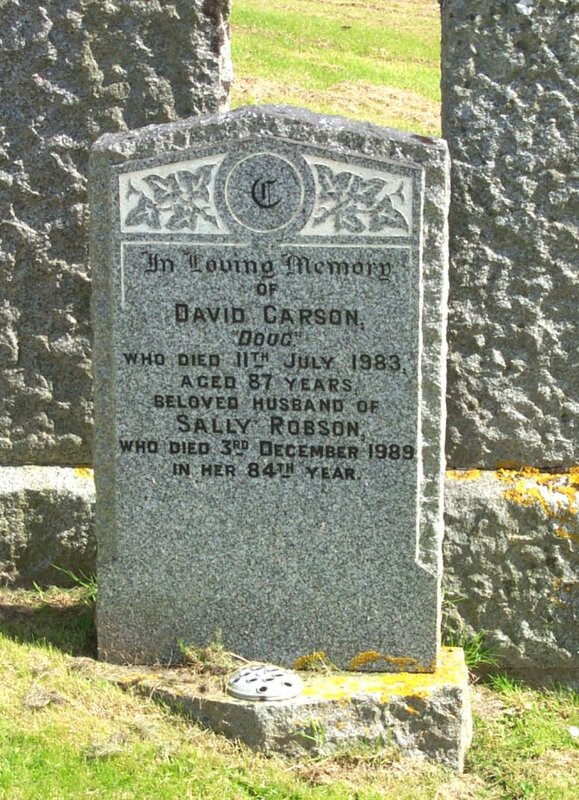 Beloved husband of Sally Robson, who died 3rd December 1989, aged 84 years. 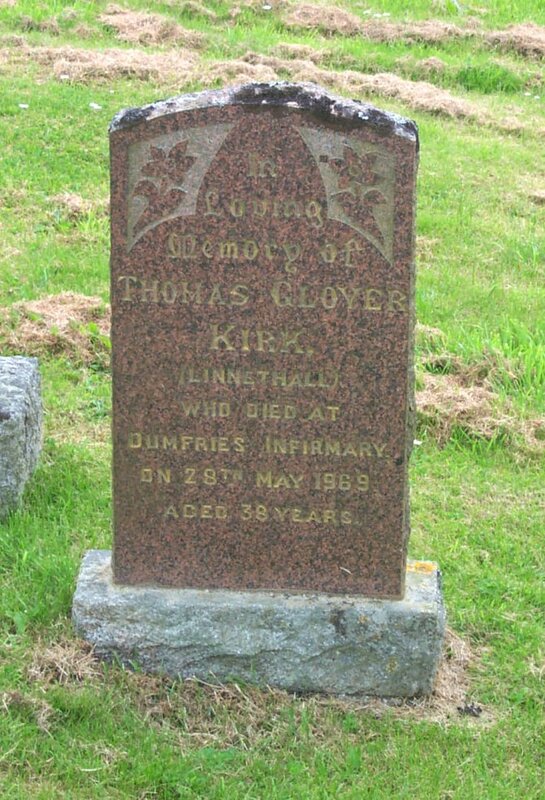 146 In loving memory of Thomas Glover Kirk, (Linnethall), who died at Dumfries Infirmary on 28th May 1969, aged 38 years. 147 In loving memory of Jane Scambler, beloved wife of John Murray, who died the result of an accident, 18th Aug. 1969. 148 In loving memory of Mary Margaret, beloved daughter of John & Mary Murray, died result of an accident 2nd Dec. 1969, aged 8 years. Also her mum, Mary Margaret Cochrane, a dearly loved mother & grandmother, died 11th March 2001, aged 75 years. Beloved wife of John Murray. Forever in our thoughts. 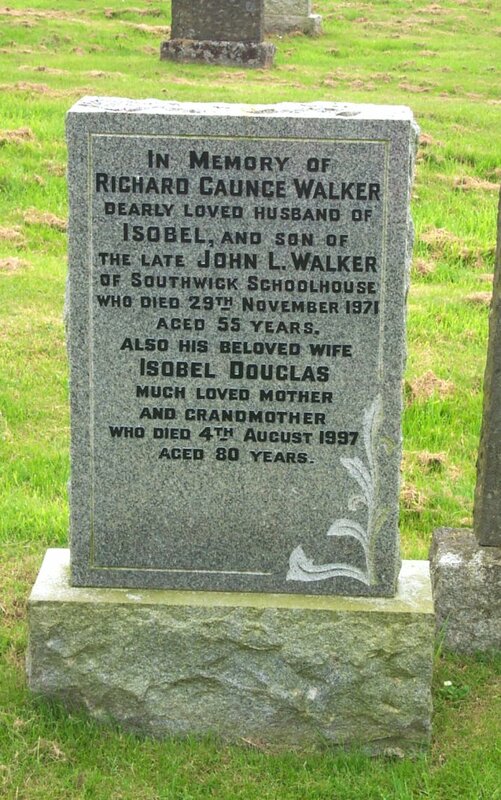 149 In memory of Richard Caunce Walker, dearly loved husband of Isobel, and son of the late John L. Walker of Southwick Schoolhouse, who died 29th November 1971, aged 55 years. Also his beloved wife Isobel Douglas, much loved mother and grandmother, who died 4th August 1997, aged 80 years. 150 In loving memory of John McCombie, from the family. 151 In memory of our loving parents John McCombie, died 30th May 1975, and Judy McCombie, died 11th Jan. 1982. 152 Phyllis, dearest wife of Wm. Hughes, died 2nd Nov. 1975, aged 57. 153 In loving memory of Robert McSherry, second son of Mrs. M., and the late Mr. F. McSherry of Woodside, died 24th Nov. 1975, aged 56 years. And also their eldest son, Thomas G.W. McSherry, died 5th July 1986, aged 71 years. 154 Henry Charles Whitley, M.A., Ph.D., D.D., C.V.O., H.H.S.A., born 20th March 1906, died 9th May 1978, former minister of Newark, Port Glasgow, Partick, Old St. Giles Cathedral, Dean of the Thistle. 155 In loving memory of Ellen Milroy, wife of Thomas Johnston, died at Millbank, 11th July 1948, aged 45 years. Also the above Thomas Johnston, died at Dumfries Infirmary, 4th April 1959, aged 57 years. 156 In everloving memory of Margaret (Daisy) Erskine, beloved wife of John McDougall, who died at Brigend, 17th May 1951, aged 44 years. 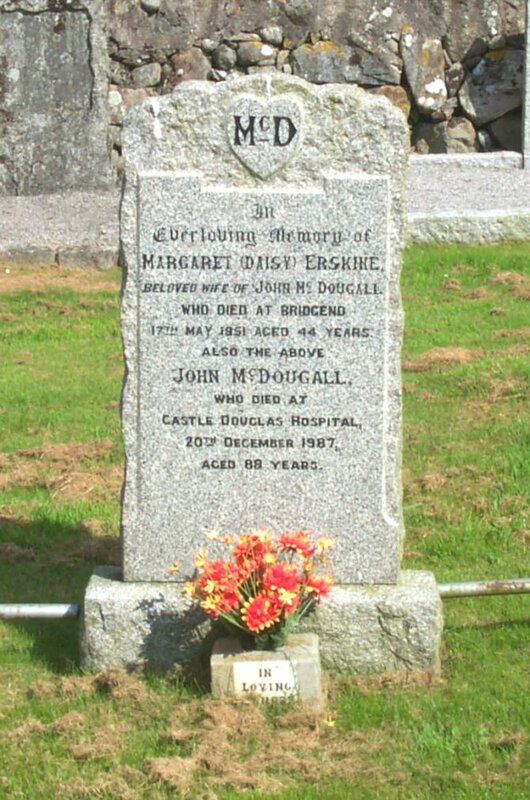 Also the above John McDougall, died at Castle Douglas Hospital, 20th December 1987, aged 88 years. 157 In loving memory of Jane, eldest daughter of Albert & Catherine Fergusson, Parkhead, Southwick, who died 31st May 1951, in her 80th year. Robert, their son, who died at Parkhead, 23rd Oct 1958, aged 84 years. Also Flora, who died 31st August 1969, aged 75 years. And Susan Catherine, who died 27th January 1977, aged 88 years. 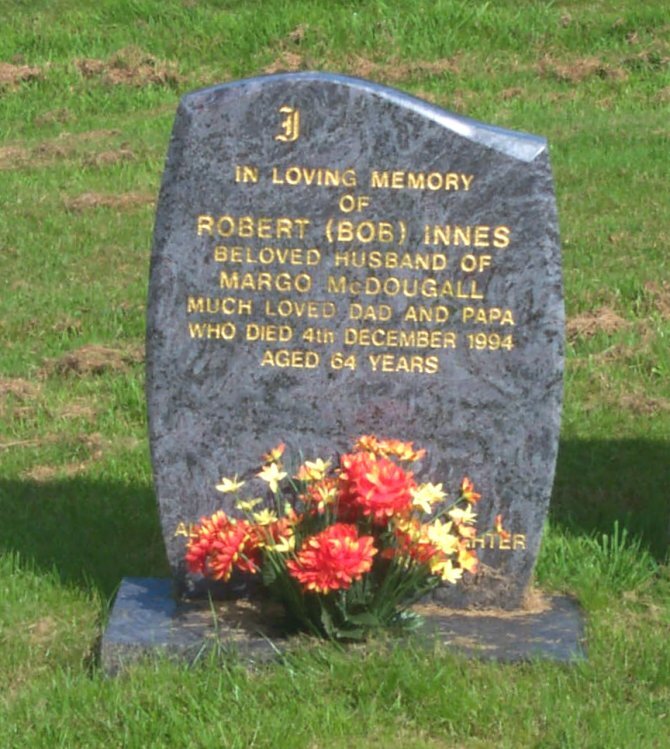 158 In loving memory of Robert (Bob) Innes, beloved husband of Margo McDougall, much loved dad and papa, who died 4th December 1994, aged 64 years. Also Lorna, their daughter, died in infancy. 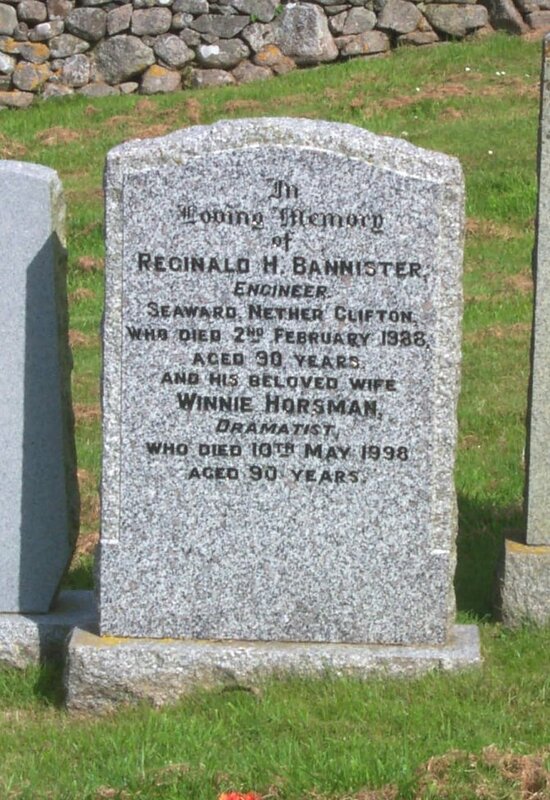 159 In loving memory of Reginald H. Bannister, engineer, Seaward, Nether Clifton, who died 2nd February 1988, aged 90 years. And his beloved wife Winnie Horsman, dramatist, who died 10th May 1998, aged 90 years. 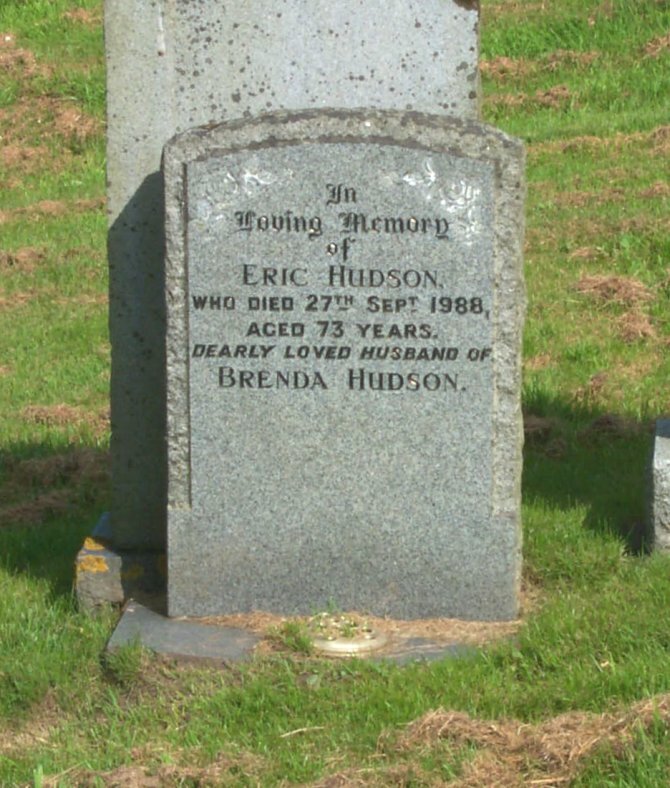 160 In loving memory of Eric Hudson, who died 27th Sept. 1988, aged 73 years, dearly loved husband of Brenda Hudson. 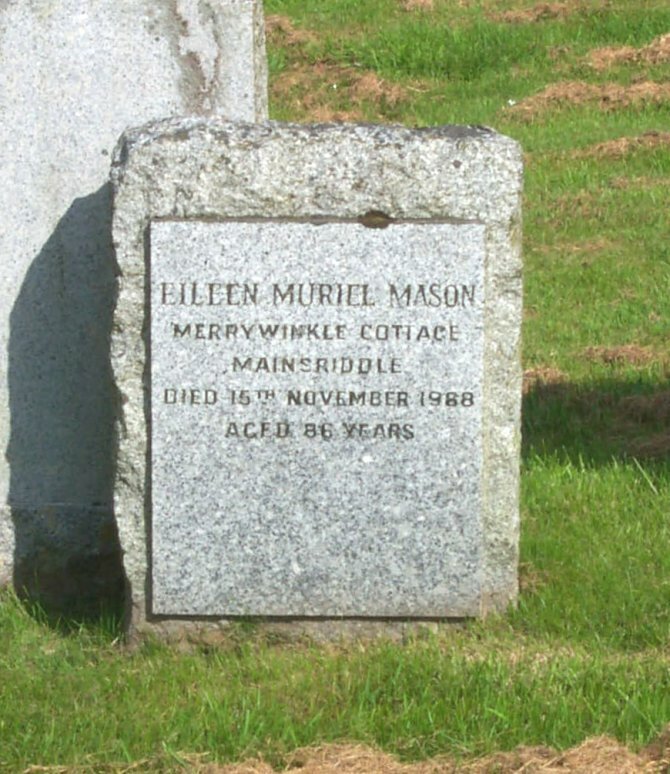 161 Eileen Muriel Mason, Merrywinkle Cottage, Mainsriddle, died 15th November 1988, aged 86 years. 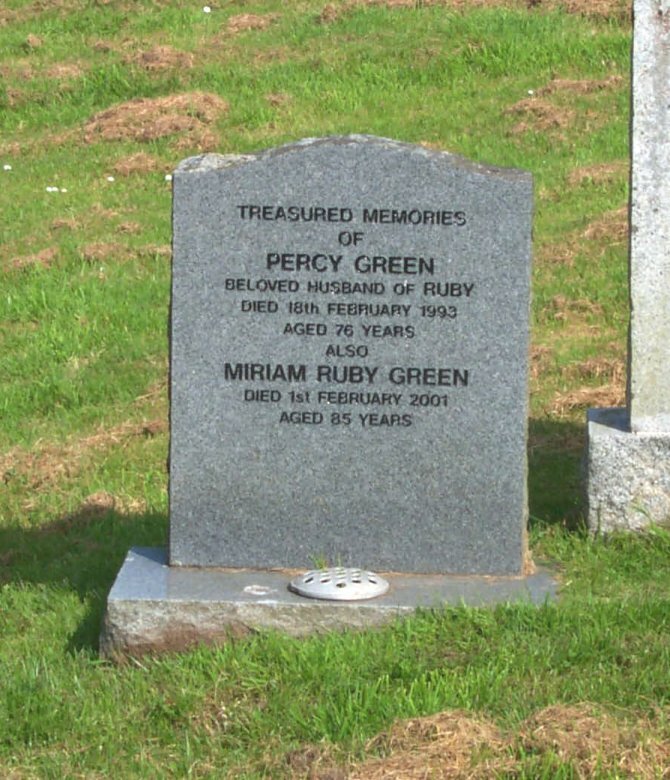 162 Treasure memories of Percy Green, beloved husband of Ruby, died 18th February 1993, aged 76 years. Also Miriam Ruby Green, died 1st February 2001, aged 85 years. 163 Harold Walker, born 15.5.1912, died 14.4.1993. 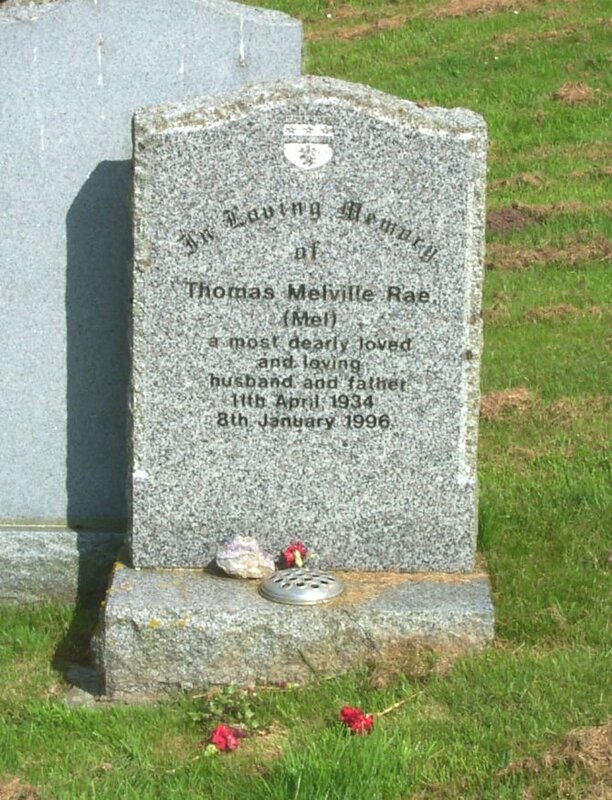 164 In loving memory of Thomas Melville Rae, (Mel), a most dearly loved and loving husband and father, 11th April 1934, 8th January 1996. 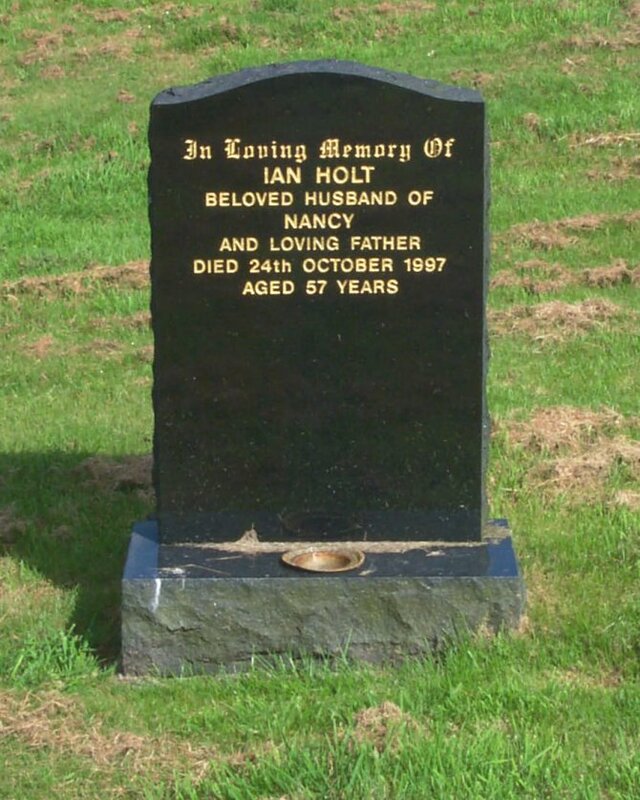 165 In loving memory of Ian Holt, beloved husband of Nancy, and loving father, died 24th October 1997, aged 57 years. 166 In loving memory of Michael Cameron Henley, beloved husband of Margaret (Margot) R. Brooks, died 28th July 1999, aged 84 years. 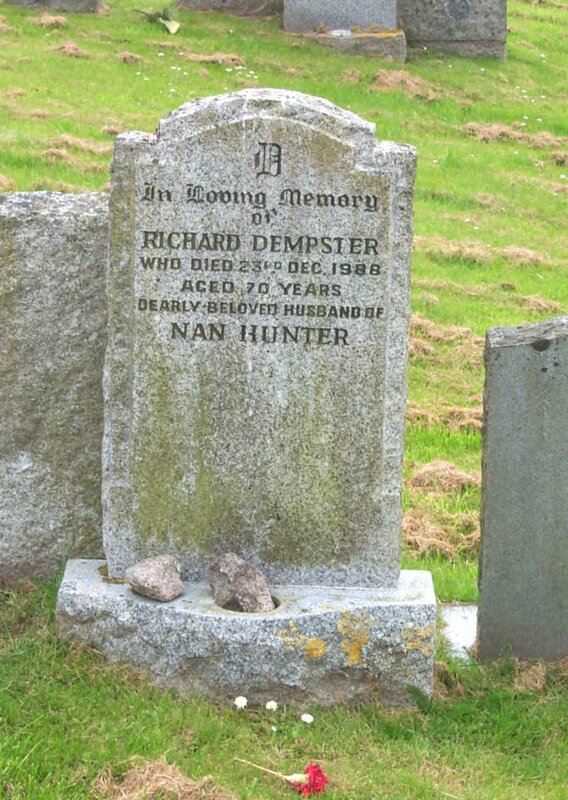 167 In loving memory of Richard Dempster, who died 23rd Dec. 1988, aged 70 years, dearly beloved husband of Nan Hunter. 168 In loving memory of Dorothy Margaret Victoria, for fifty years the dearly loved wife of Nobby Clarke, dear mother of Bruce & Rosemary, died 23rd April 1990, aged 75 years. Also the above Nobby, Norman Sparling Clarke, devoted husband, father and grandfather, died 15th March 1992, aged 84 years. 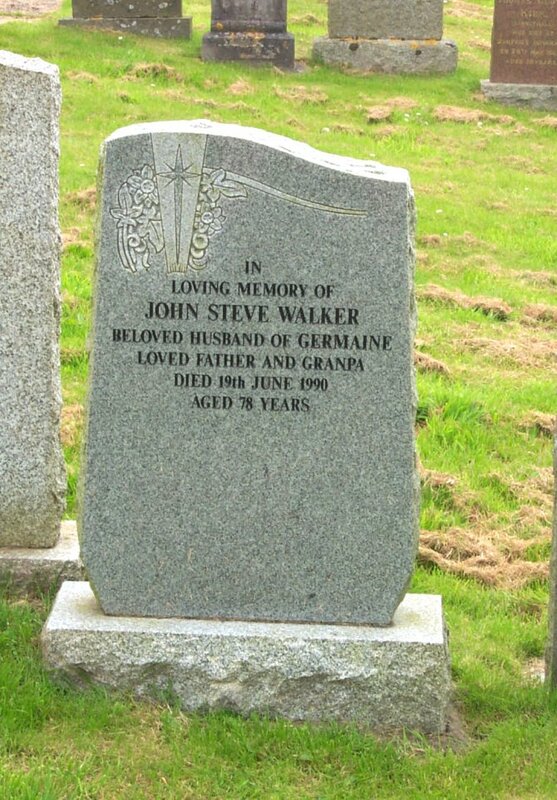 169 In loving memory of John Steve Walker, beloved husband of Germaine, loved father and grandpa, died 19th June 1990, aged 78 years. 170 In loving memory of James I. 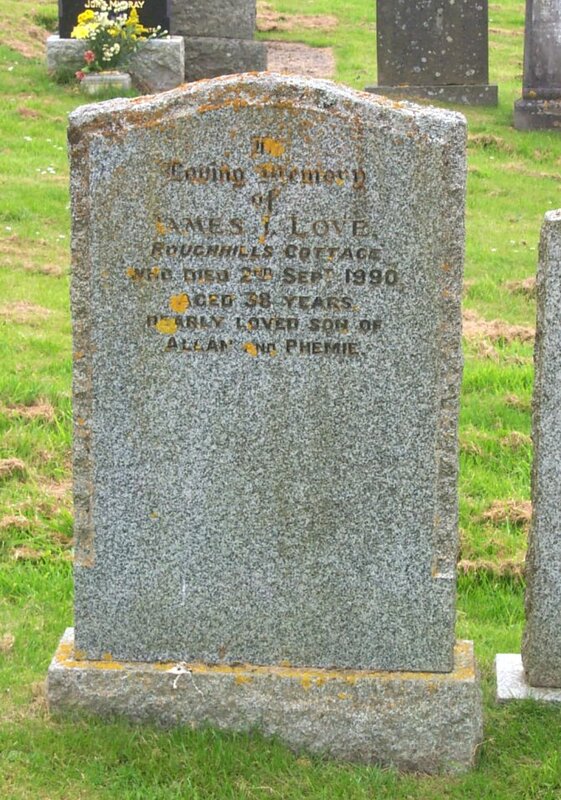 Love, Roughhills Cottage, who died 2nd Sept. 1990, aged 38 years, dearly loved son of Allan and Phemie. 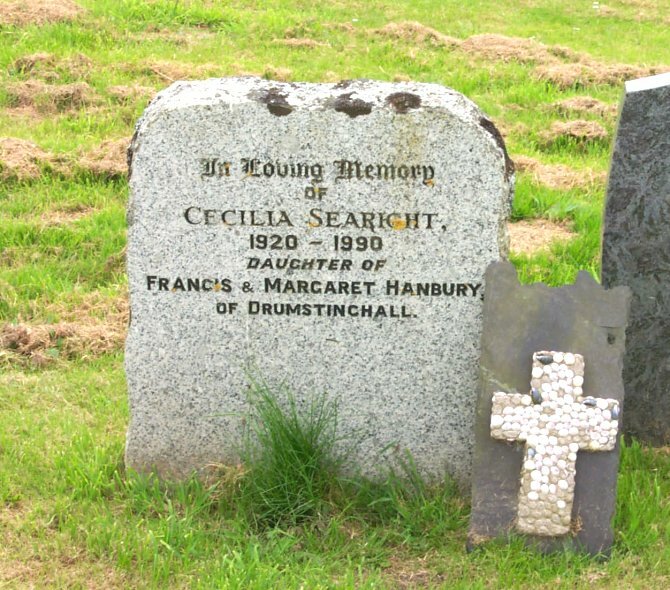 171 In loving memory of Cecilia Searight, 1920 – 1990, daughter of Francis & Margaret Hanbury, Drumstinchall. 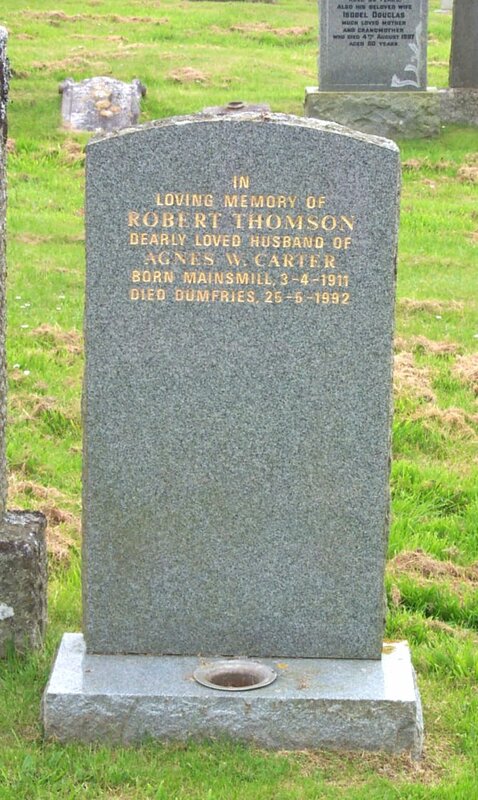 172 In loving memory of Robert Thomson, dearly loved husband of Agnes W. Carter, born Mainsmill 3.4.1911, died Dumfries 25.5.1992. 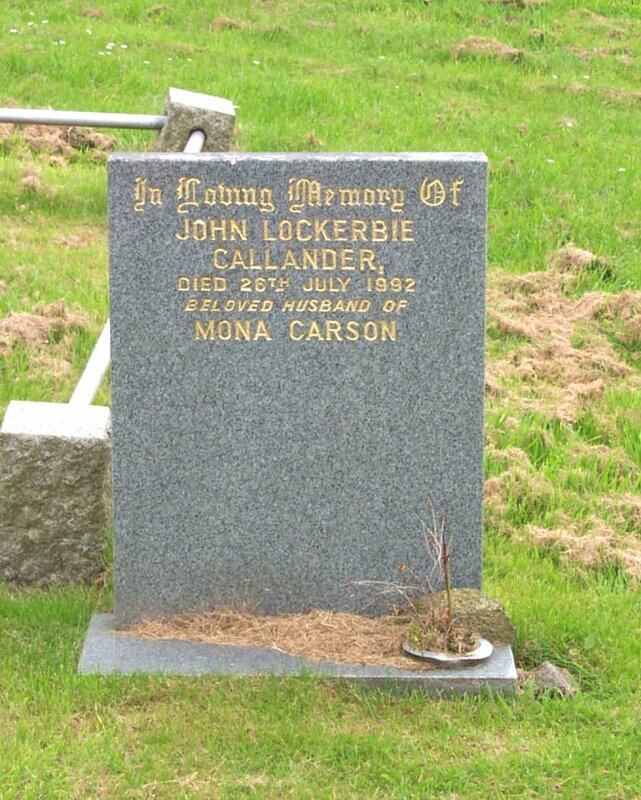 173 In loving memory of John Lockerbie Callander, died 26th July 1992, beloved husband of Mona Carson. 174 In loving memory of Colin Jeffrey Connel, younger son of Ian and Margaretta (Rita) Connel, Heughs Farm, Sandyhills, died result of road accident, 18th Sept. 1992, aged 27 years. Also the above Rita, nee Muir, a beautiful brave and loving wife to Ian, devoted mum to Lesley, Senga, and the late Colin, a much loved nana, after years of suffering died peacefully at home 27th June 2001, aged 65 years. Always in our thoughts. 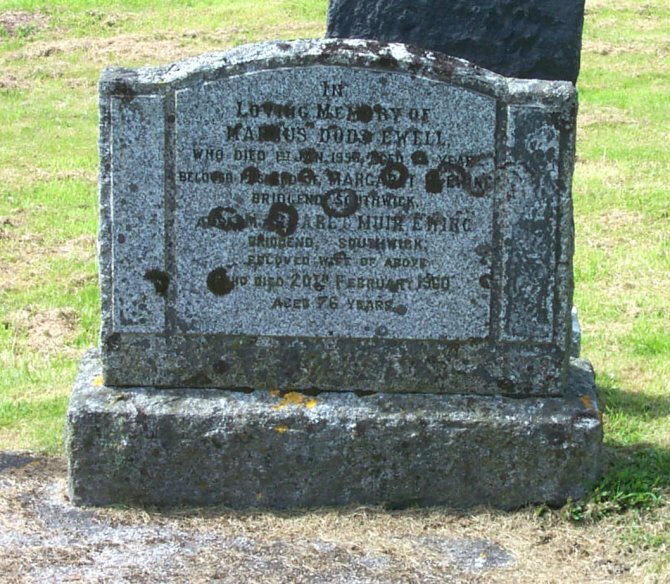 175 aged 54, the ever dear wife of Oliver Heywood, Cairngill, Colvend, died 17 January 1969, aged 86. In memory of their nephew Lieut. David W. Leggat, R.M., lost in H.M.S./M. Usk, May 1941, aged 24. Dianan, died 4 Nov. 1958, aged 43, their daughter, and loved wife of Lt. Col. Anthony Hannahford. Also in loving memory of his brother William Heywood, 7.10.1889 – 1.8.1981. 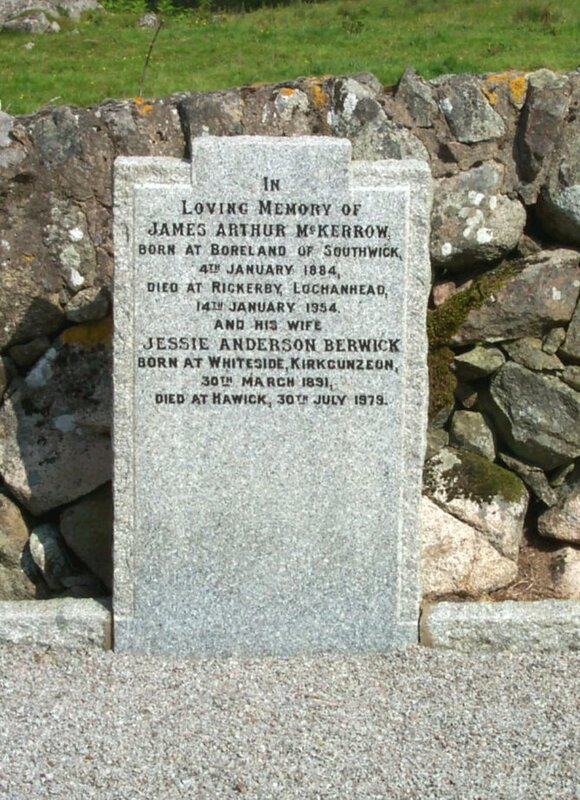 176 In loving memory of James Arthur McKerrow, born at Boreland of Southwick, 4th January 1884, died at Rickerby, Lochanhead, 14th January 1954. And his wife Jessie Anderson Berwick, born at Whiteside, Kirkgunzeon, 30th March 1891, died at Hawick, 30th July 1979. 177 Agnes Ann Lawson, who died at Mainsriddle, 19th Dec. 1945, aged 88 years. 178 Always in sweetest remembrance of Peggy, beloved wife of George James Chappell, and youngest daughter of the late Robert Buchan, Calder Bank, Dumfries, died 19th August 1947, aged 54 years. Bird song, wild thyme, and evening. 179 In loving memory of Mary Webster Young, beloved wife of Robert Carson, who died at Millburnbank, 7th Oct. 1971, aged 68 years. Also the above Robert Carson, who died 31st July 1988, aged 85 years. 180 Robert George Dashwood Thomas of Southwick, 1876 – 1950. And his wife Kate Grace Maitland-Heriot, 1885 – 1968. And their eldest son Charles Holiwell Thomas of Southwick, 1909 – 1990. 181 David Charles Morgan Thomas of Southwick, 1942 – 1987. And Rupert James Morgan Thomas, 1972 – 1992. Only sons of David and Ann. 182 In loving memory of Andrew McTaggart, Kells of Southwick, born 8th March 1895, died 3rd August 1973. Also Mary Elizabeth Dunn, born 19th January 1906, died 9th August 1987. 183 MILNE-REDHEAD. 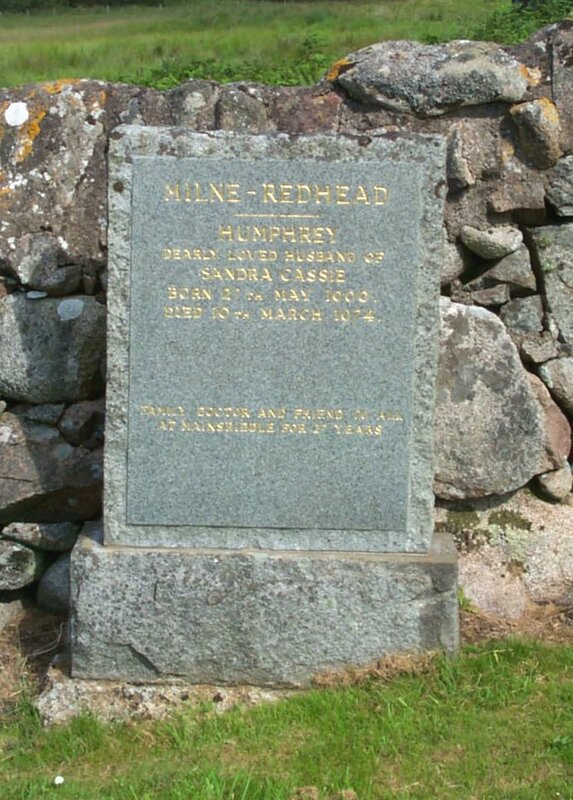 Humphrey, dearly loved husband of Sandra Cassie, born 27th May 1906, died 16th March 1974. Family doctor and friend to all at Mainsriddle for 27 years. 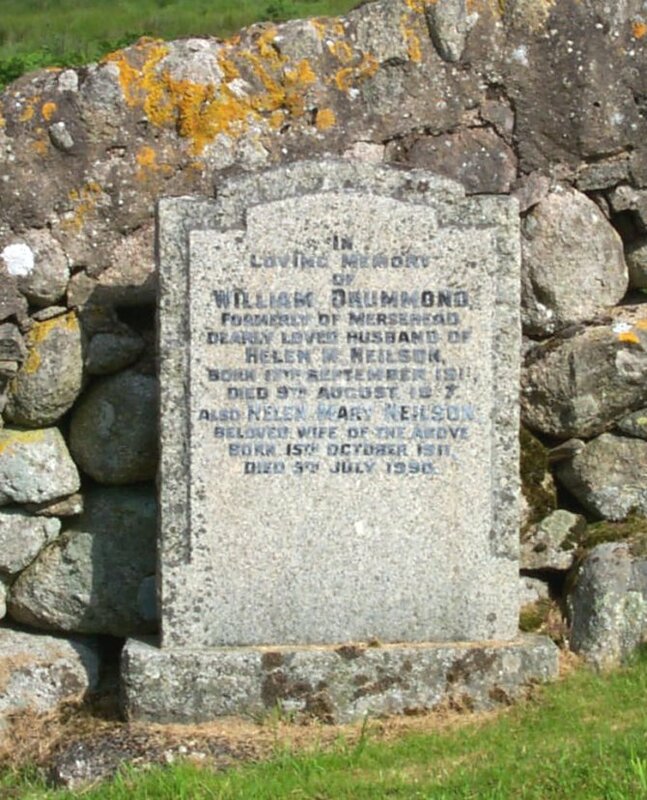 184 In loving memory of William Drummond, formerly of Mersehead, dearly loved husband of Helen M. Neilson, born 19th September 1911, died 9th August 19(7)7. And Helen Mary Neilson, beloved wife of the above, born 15th October 1911, died 5th July 1990. 185 In loving memory of a much loved mum and nan, Joan G Lovett, who died 13th Oct. 1992, aged 71 years, dearly loved wife of Joe. 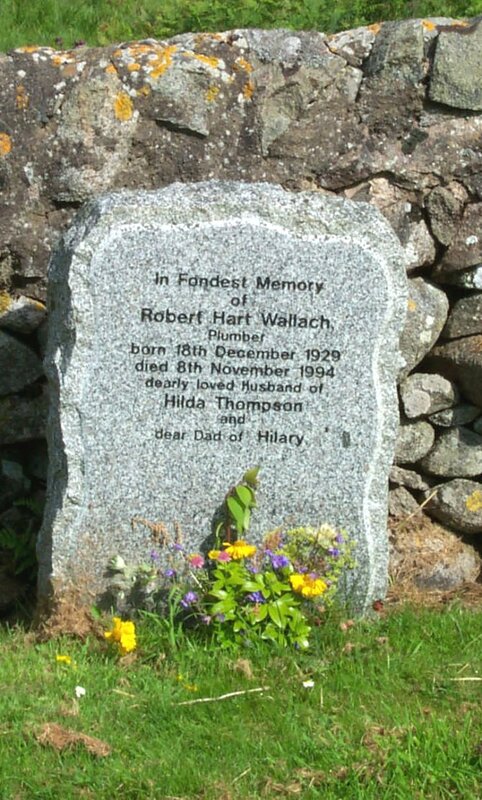 186 In fondest memory of Robert Hart Walloch, plumber, born 18th December 1929, died 8th November 1994, dearly loved husband of Hilda Thomson, and dear dad of Hilary. 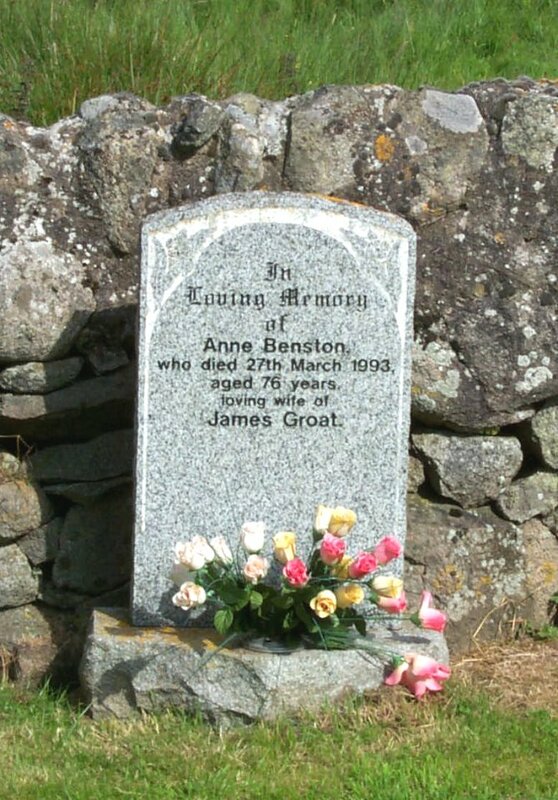 187 In loving memory of Anne Benston, who died 27th March 1993, aged 76 years, loving wife of James Groat. 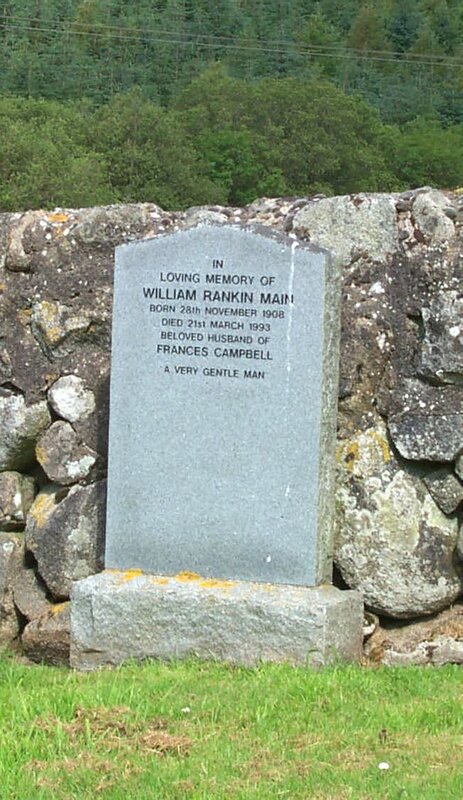 188 In loving memory of William Rankin Main, born 28th November 1908, died 21st March 1993, beloved husband of Frances Campbell. A very gentle man. 189 YOUNG. In loving memory of Kenneth Marshall Young, of Seabank, Rockcliffe, who died 5th October 1971, aged 78. Also his beloved wife Daisy Millar Arnott, who died at Seabank, 13th April 1955, aged 60. 190 In loving memory of Harold Duncan, died 6th Oct. 1939, aged 56. And his wife Doris Isabel Duncan, died 7th June 1952, aged 65. 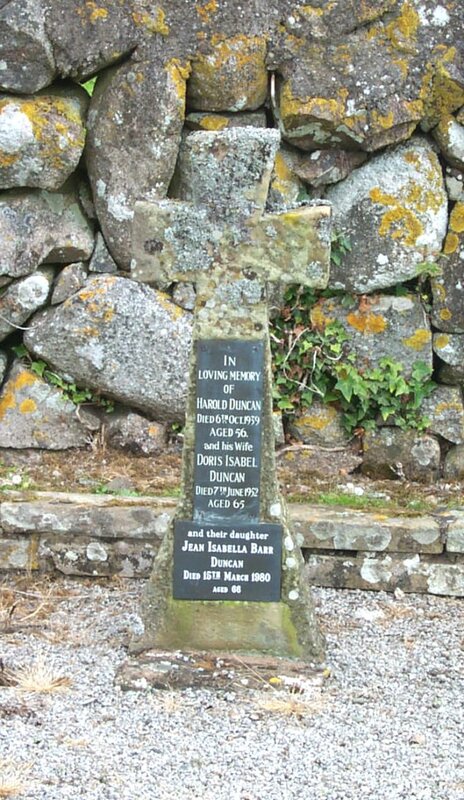 And their daughter Jean Isabella Barr Duncan, died 15th March 1980, aged 66. 191 In loving memory of Jane King, who died at East Lodge, Southwick, 7th April 1941, aged 73 years. Also Mary King, beloved wife of James Copland, who died at Conchieton, Twynholm, 22nd April 1945. Also the above James Copland, who died at Carsluith Farm, Creetown, 12th May 1947. 192 In loving memory of Elizabeth F. Roberts, beloved wife of William McCaa, died 22nd August 1940, aged 30 years. 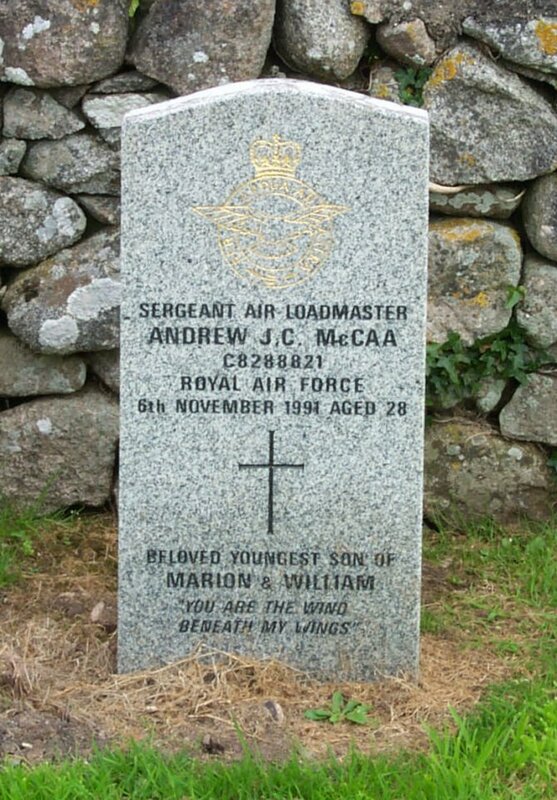 Also their son John Roberts McCaa (killed by an accident) on 31st July 1948, aged 13 years. Also the above William McCaa, died 15th May 1974, aged 77 years. 193 In loving memory of Stewart Fraser McCaa, beloved son of William & Marion, died 28th May 1962, aged 6 months. 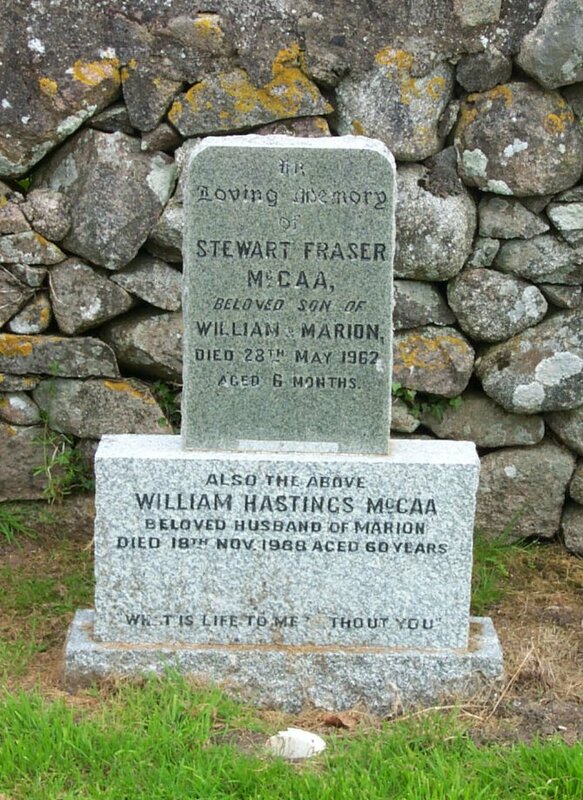 Also the above William Hastings McCaa, beloved husband of Marion, died 18th Nov. 1988, aged 60 years. What is life to me without you. 195 In loving memory of William McCaa, beloved husband of Agnes Howat, died 12th June 1936, aged 70 years. 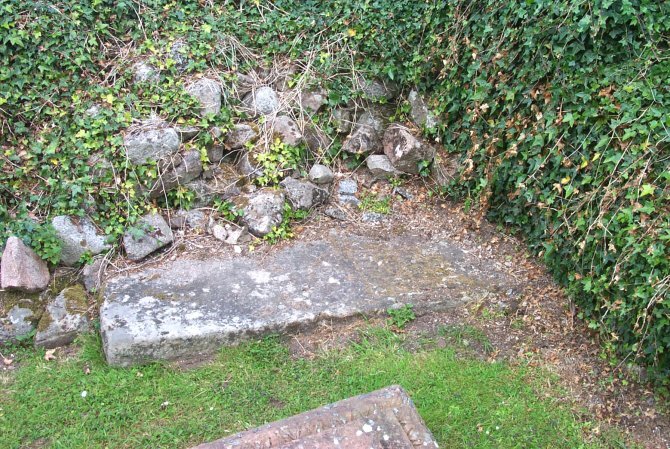 Also the above Agnes Howat, interred in Borgue, Aug. 1895. Also Isabella Hastings, his second wife, died 10th June 1937, aged 75 years. Also his daughter Mary McCaa, died 19th Dec. 1946, aged 52 years.